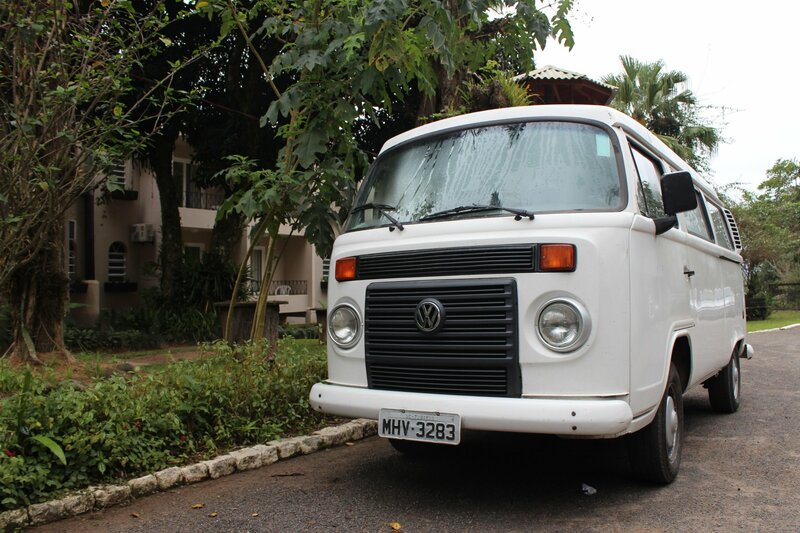 One of the unexpected pleasures of my trip to Brazil in July was the discovery that we would be travelling around in a convoy of four VW Kombi (T2) vans. 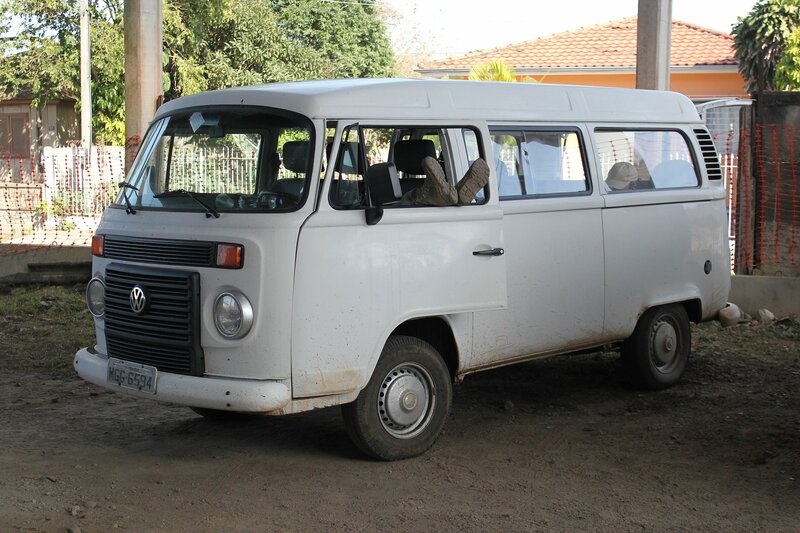 Although they looked like heritage machines they were in fact relatively young, having been constructed by Volkswagen’s Brazilian operations within the last decade. The vehicles we picked up required a degree of manhandling to drive and did not always deliver the smoothest ride, but they certainly never lacked for character! It seems remarkable to think that a design first introduced in 1950 should still have been rolling off a production line in 2013, but that story finally came to an end this month. 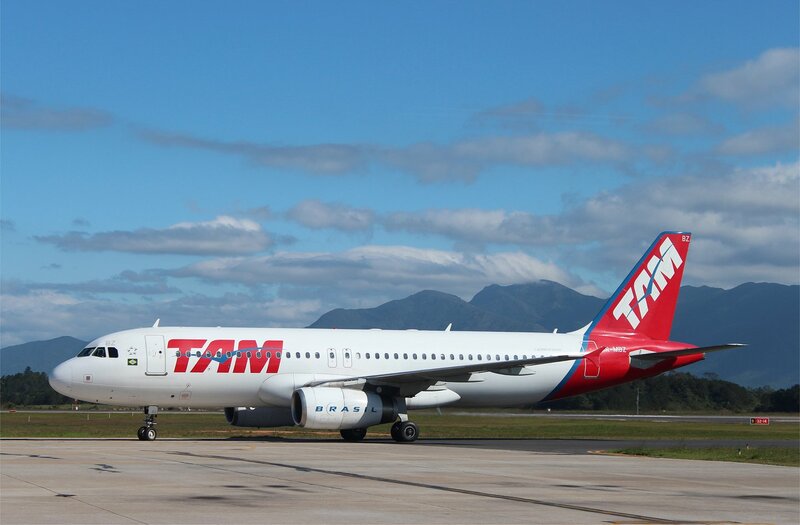 Production in Brazil was scheduled to cease at the end of December 2013. 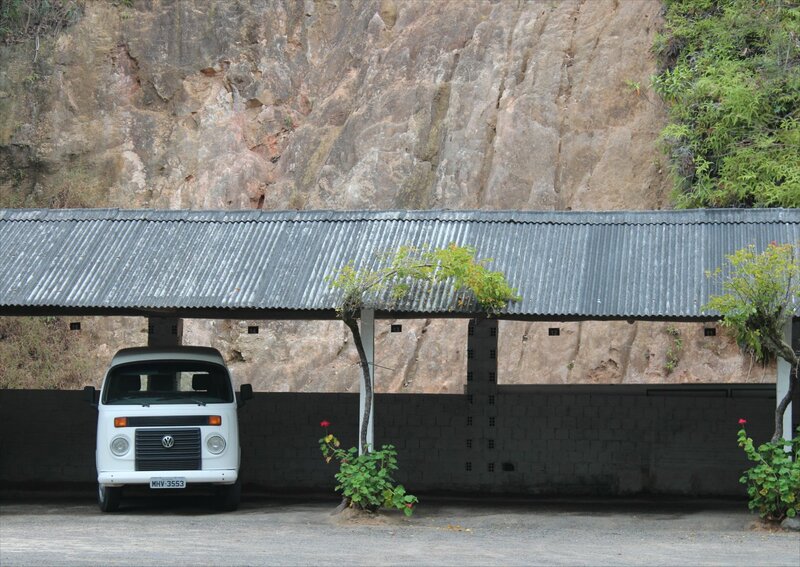 The story of the last Kombis to roll off the production line has been covered in the Daily Mail story Volkswagen Kombi’s epic journey reaches end after 63 years whilst Volkswagen Brazil have recorded the last wishes of the Kombi. 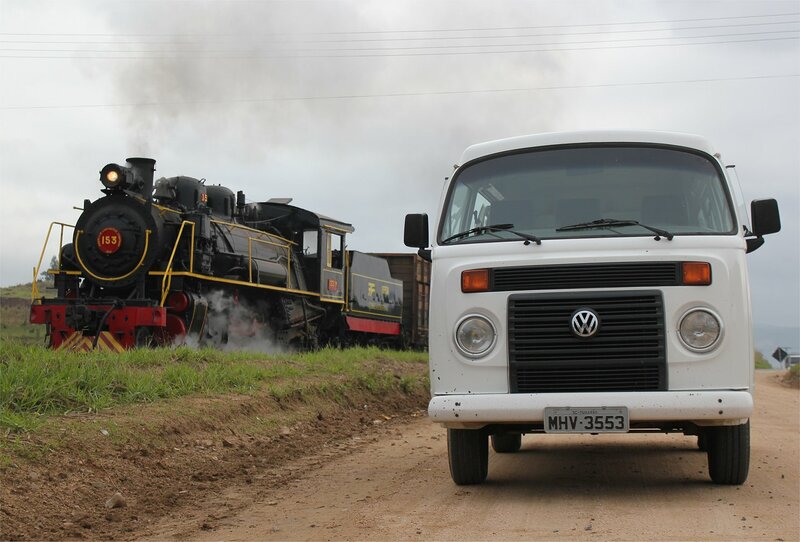 Although there are plenty of these machines to be seen in Brazil, the sight of our Kombi convoy (or better still the dance of the Kombis as four machines manouevred out of their parking spots in unison) still caught the attention of anyone around. It’s not hard to see why. Farewell to the much loved Kombi! Although my primary interest is taking photographs, I always try to come back from a trip with a few videos that give a flavour of the tour. I am clearly no great shakes when it comes to shooting videos but if they capture just a little of the magic of steam then I am quite happy. My video camera developed a little bit of a stutter during the trip (or maybe the operator developed additional incompetencies!?) so I don’t know how many videos will be usable, but whatever seems half decent will be added to the playlist below. Although it seemed as though our trip was always just a step away from catastrophe we managed to make it through to the end somehow. 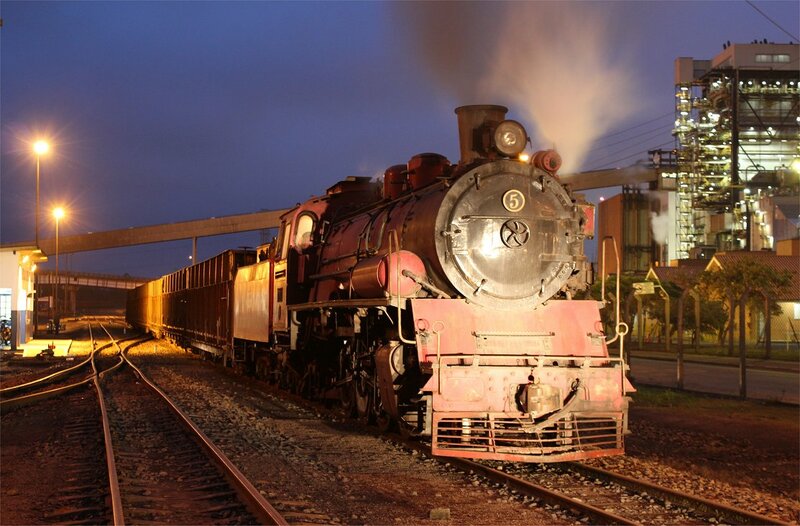 In no small part this was down to our incredible crew, the valiant efforts of the museum team to work through the night repairing the locos and the ability of our tour organiser to continually re-plan as each new disaster hit. Now we could relax, safe in the knowledge that we had made it to the most important photospots by the end of the tour. It might have been a slightly bonkers journey at times, but that is what makes these adventures so memorable. 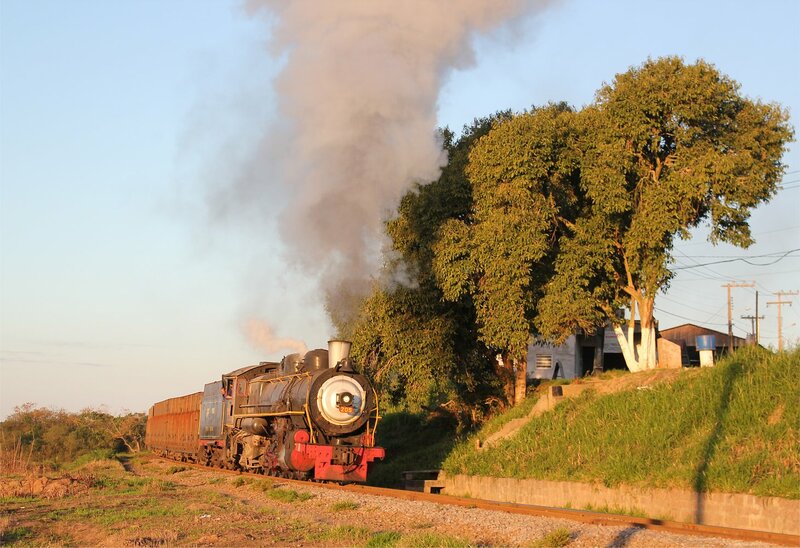 The events of the past week have also clearly captured a local interest too*, which I hope continues to generate goodwill for the future development of the railway museum. 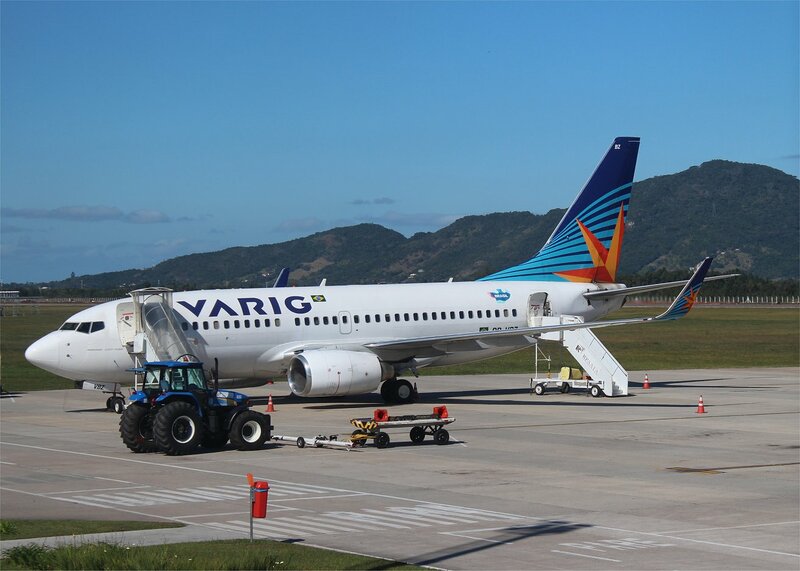 Our journey home was to be a long winded affair, starting with a coach at 9.15am for the drive to the airport at Florianopolis. 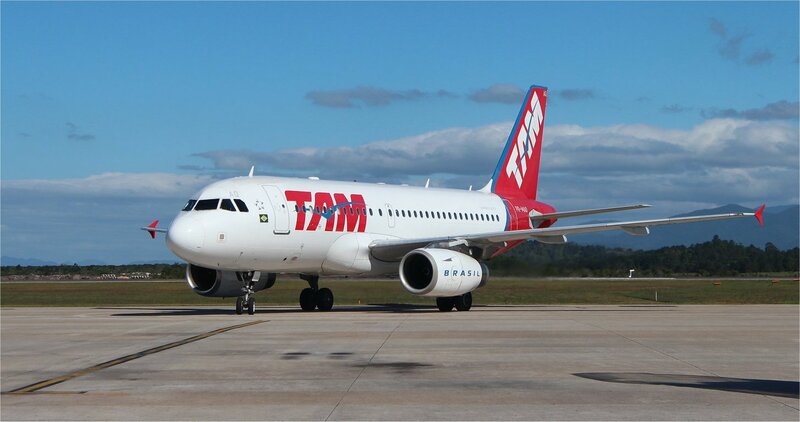 Flights out of the city were pretty much fully booked so we were spread over three different internal flights, even though we were mostly taking the same international flight out of Sao Paulo. 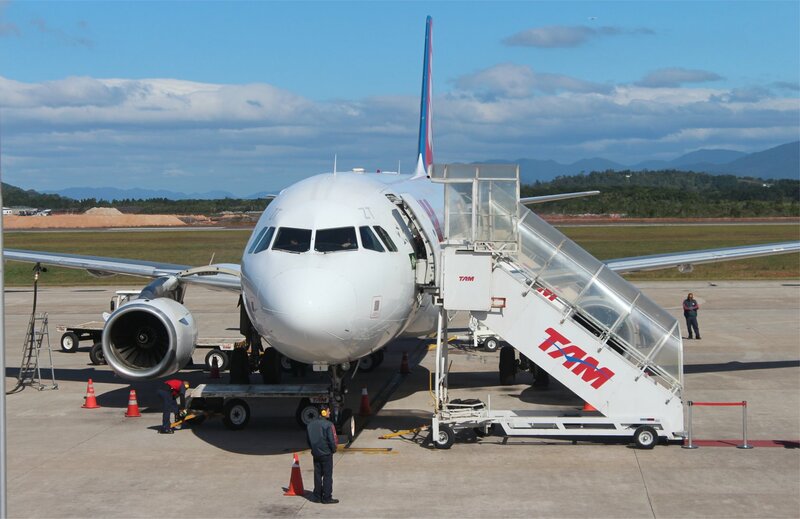 I had half expected a few problems (on account of slightly mixed messages from the ground crew at Florianopolis who suggested that the boarding passes they had printed for me would be invalid for my onward connections, which the check in staff at Sao Paulo assured me was not the case!) so was pleasantly surprised by the smooth transit. The only heart-stopping moment came when the machine at the gate came up with the message ‘Ticket rejected’ but that only turned out to be a seat change that worked in my favour. My flight landed in Frankfurt on time and left me with a few hours to kill before the onward connection to the UK. Inevitably it was at Heathrow that things went a little haywire with an unwished for circular tour of London, repeated a few times, though I got the clearest views of my neighbourhood that I have managed on a flight which made up for it a little. It was good to be back. 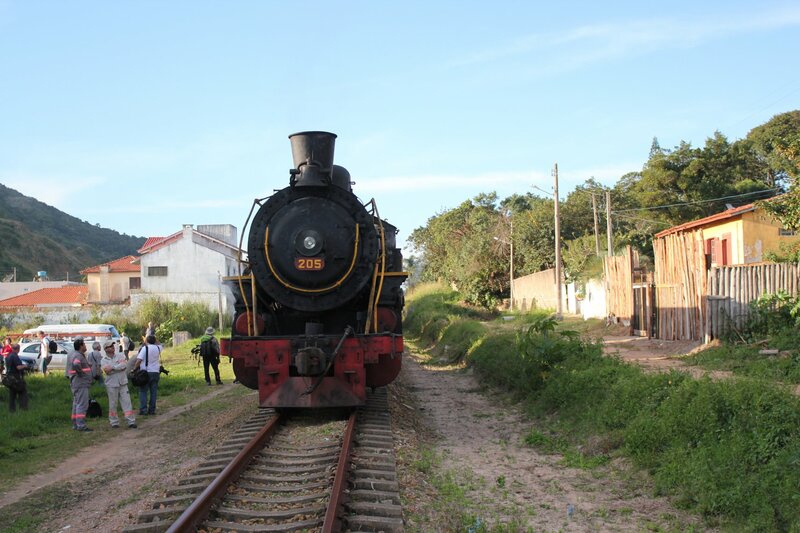 Rede Ferroviária volta a circular na região. 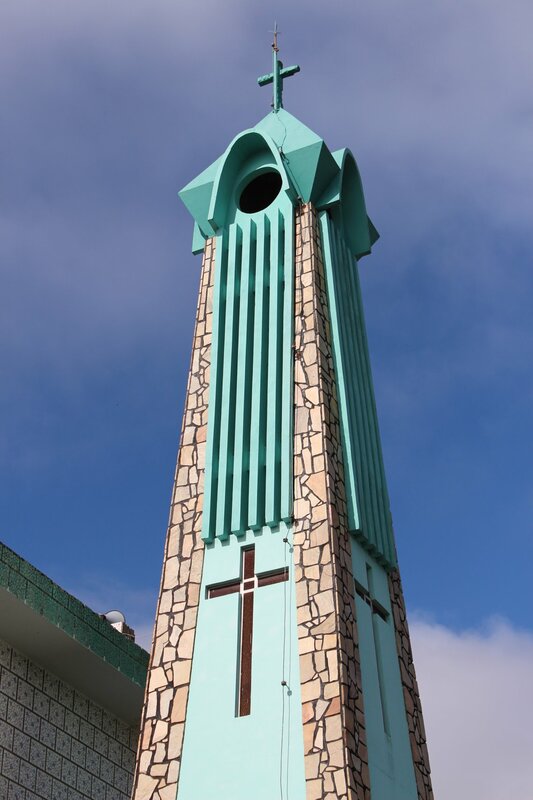 On top of this, there were articles on the Radio Sideropolis and Diário do Sul websites. 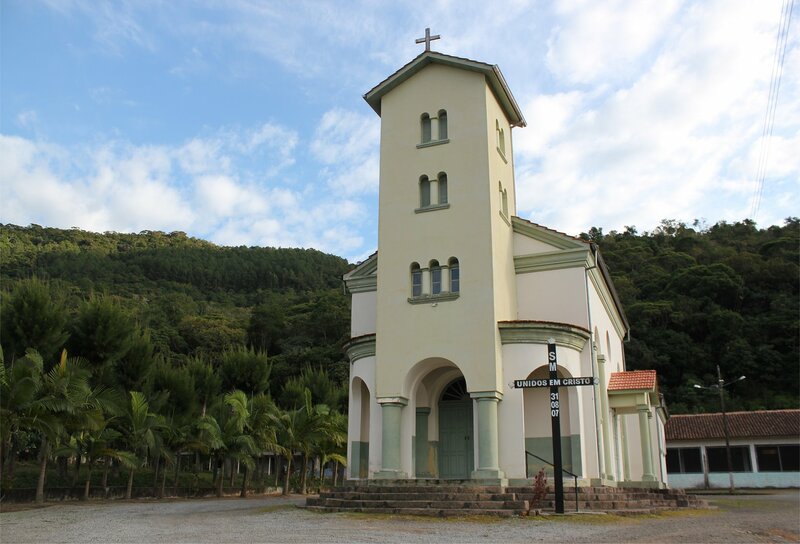 Our final day on the territory of the EF Doña Teresa Christina took us back to Eng. 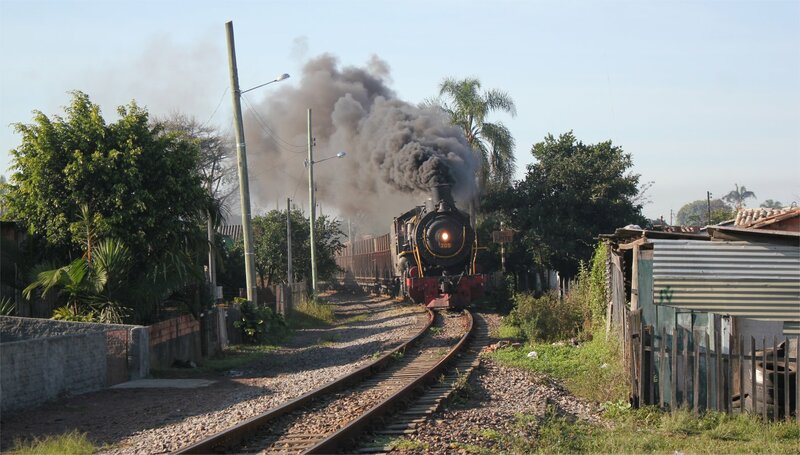 Paz Ferreira and the spectacular sight of Santa Fe no. 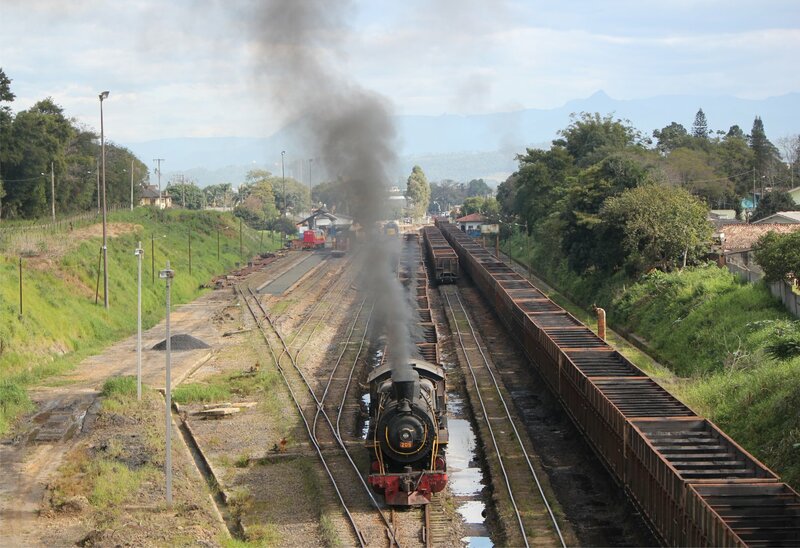 205 doing her best impression of a volcano as she departed with around 20 loaded wagons. It was a great sight to start the day, followed soon after by a run through the road crossing we had visited a few days earlier. 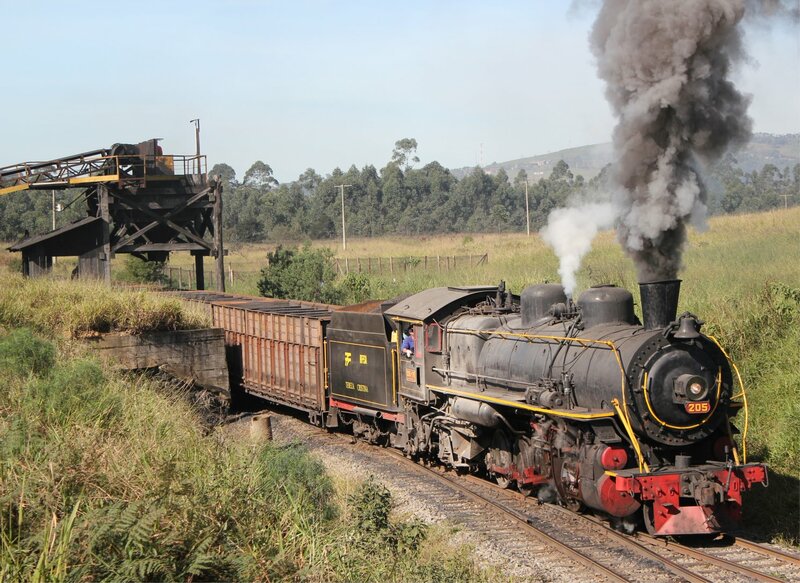 Throughout the day we had the diesel following close behind to retrieve the freight train after each run through which I am sure spared us from some of the difficulties that we experienced earlier in the week. 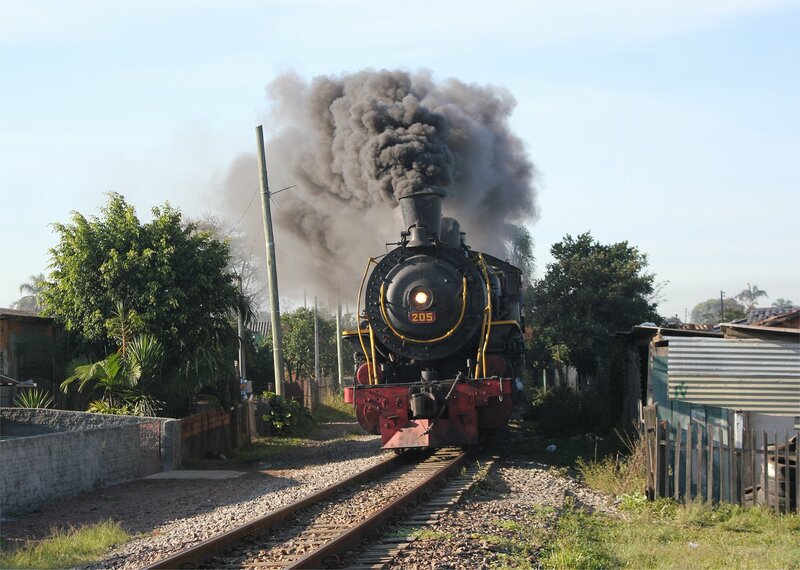 Our translator, Marcia, told us that the local children thought that the steam locomotive was broken and that the diesel was coming to rescue it. Thankfully, on this occasion, that was not the case! 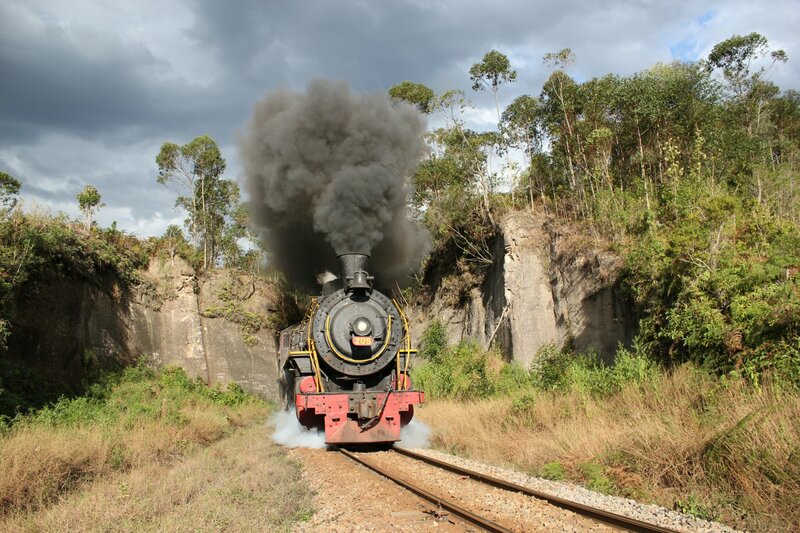 In the afternoon we headed to a rather spectacular rock cutting and watched in dismay as shadow fell on the line as our steam freight passed through. Inevitably, sunlight illuminated the rocks beautifully afterwards but the question we had to grapple with was, could we get a second runpast in sunlight when clouds were closing in rapidly? We waited and waited, trying to read the wind direction and the path of small gaps in the cloud cover. The peril of betting on the wrong gap became apparent when the sun poked through a small gap in the clouds but quickly closed up again. It was 45 minutes before a slightly larger gap in the clouds looked set to give us a slim chance and the instruction to go was urgently transmitted by radio to the waiting crew. 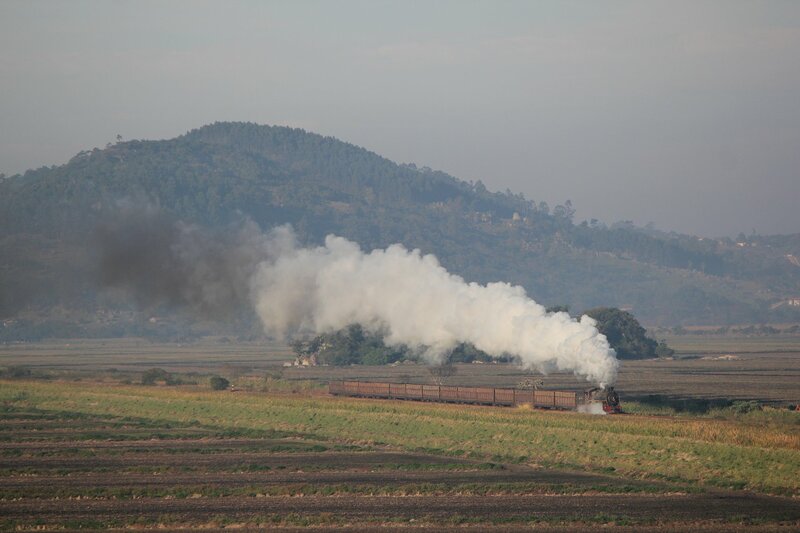 The steam freight passed through in perfect sunlight and disappeared moments later. Incredible! The long wait was worth it for the shot it produced but had come at the price of the next photospot, the tunnel mouth outside Sideropolis, which was now in shadow after a brief moment in sunlight. It is a shot that will have to wait for the next tour to come here. It looked like this was the end of the light as we trekked back from the tunnel mouth to see Sideropolis under a blanket of clouds. 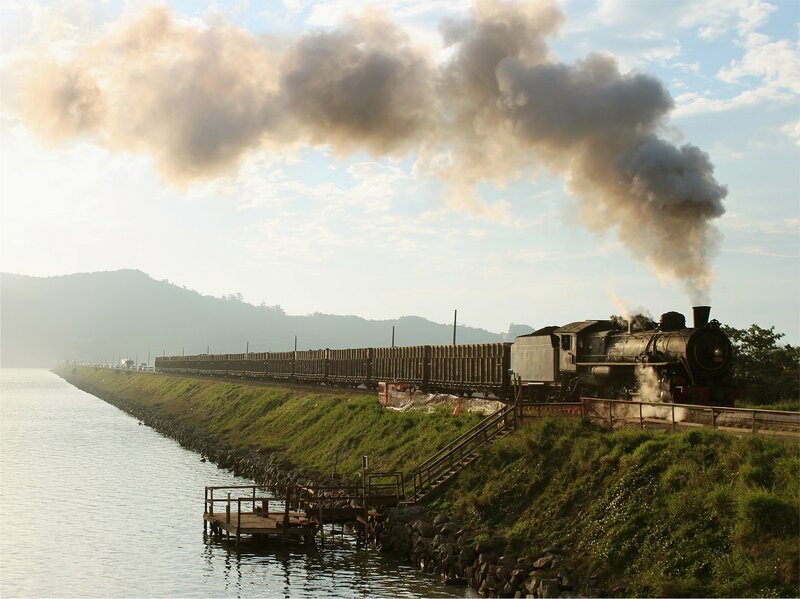 Our luck held a little longer, with glorious rays of sunlight greeting the arrival of the steam freight at Rio Fiorita’s wooden loading facility and setting up the perfect finale to our tour. 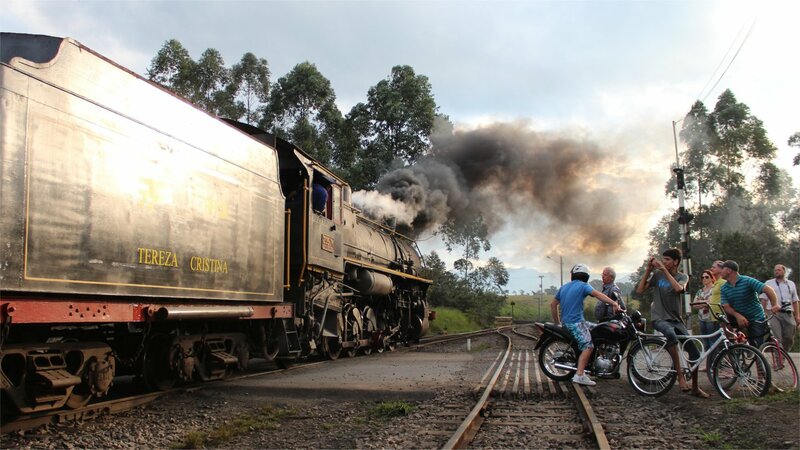 Large crowds of locals had gathered at the level crossing to witness this final act in the week’s events which gave the end of the tour a rather unexpectedly lovely atmosphere. In the evening the crew, translators, railway managers, museum team and our tour organiser were deservedly the toast of the room with many a speech taking us into the night. I am sure that the crew in particular needed their sleep after a hellish week in ‘the office’ but all of could say with absolute honesty that they had delivered a magnificent spectacle. As I headed to bed the sound of thunder, lightning and torrential rain pounding down reminded me that luck really had swung our way today! 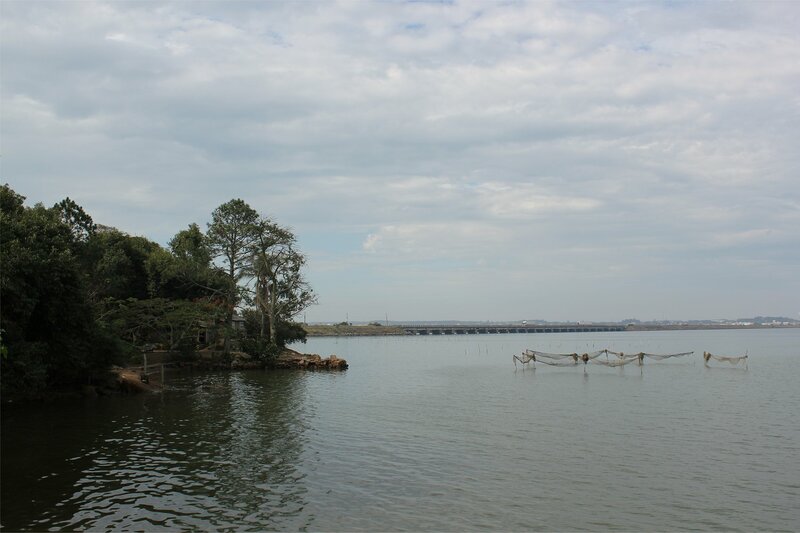 Today’s lunchtime stop brought us to the private waterfront property of a former mayor of Tubarão for a Brazilian style barbeque and a glass or two of a particularly potent caipirinha. It was a good opportunity to stop and reflect in beautiful surroundings. 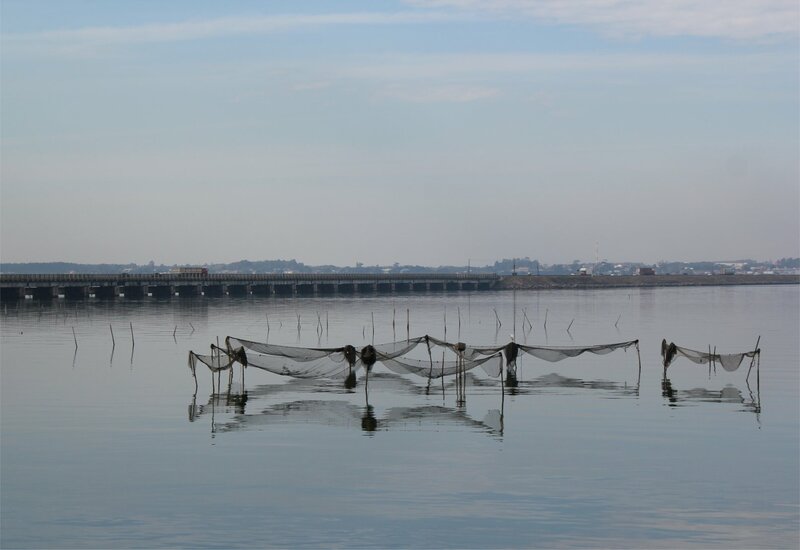 Our spot on the edge of the Lagoa de Santo Antonio offered a wonderful view across to the far shore, which looked much as it might have done through the centuries. 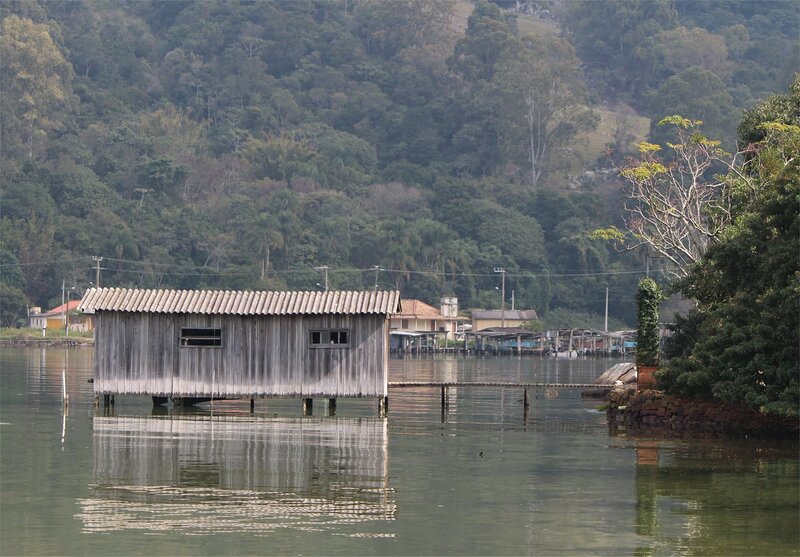 All along the shoreline you could see an array of wooden boathouses, whilst out in the lagoon itself a small group of fishermen passed by their nets. 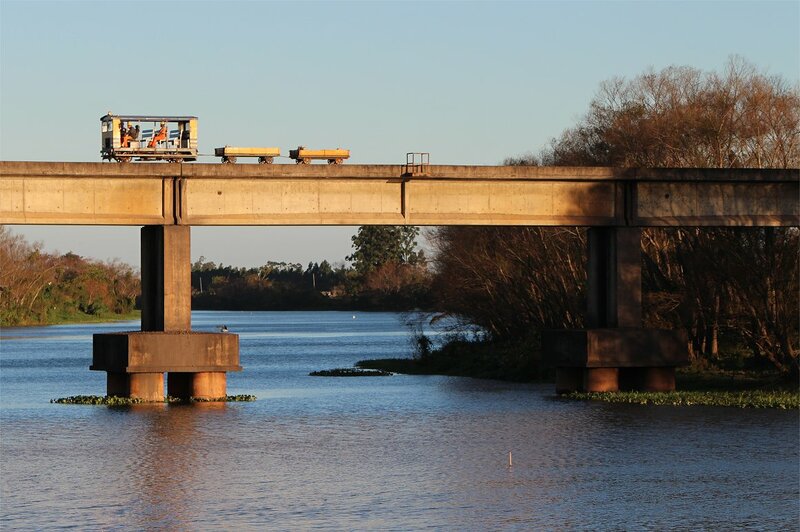 As timeless as this seemed to us, it is a scene that will not last much longer as work has just started on a new four lane motorway bridge which will cut a new path across the lagoon and straighten the route of the BR101. 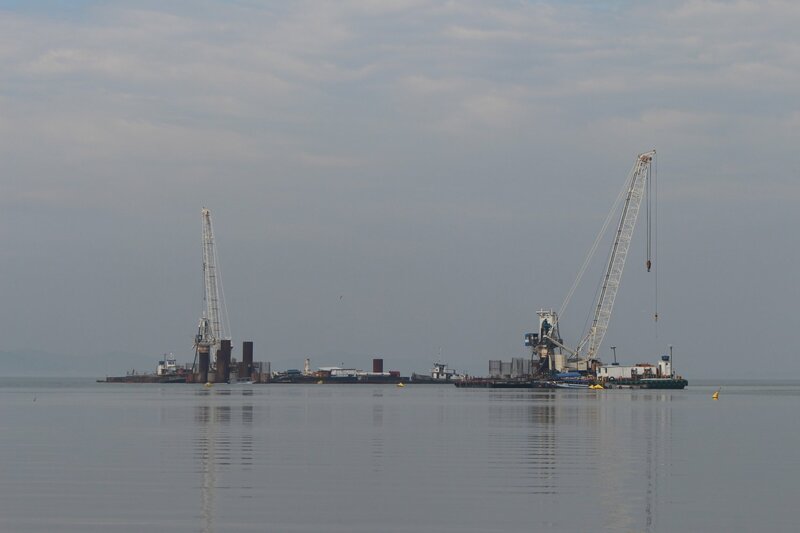 The new bridge is intended to eradicate the bottlenecks that we have seen build up all too easily on the approach to the existing bridge. 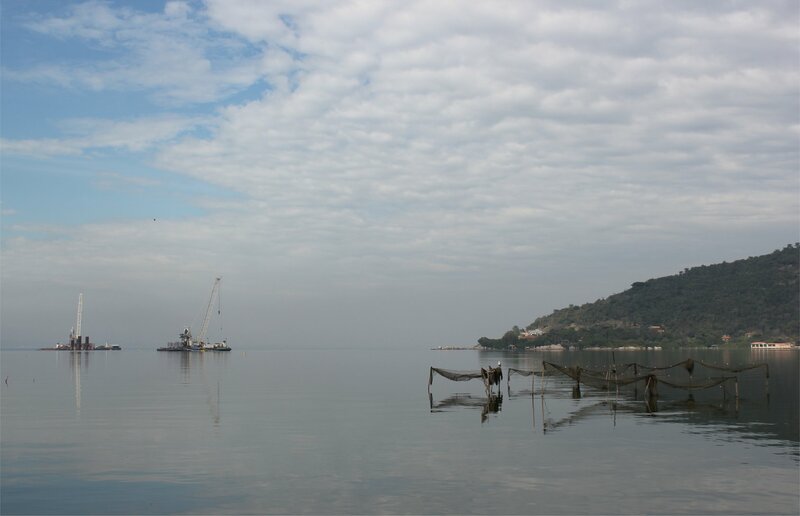 The footprint of the new bridge can be clearly seen in this artist’s visualisation of the lagoon with the bridge and a short video on youtube qives a flythrough of the new bridge showing just what a dramatic difference this will make to the local landscape. 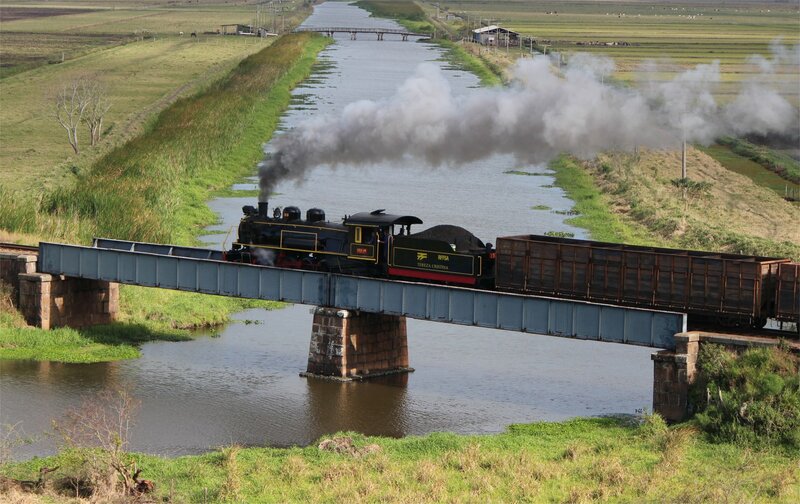 The railway first bridged the lagoon in the late nineteenth century, connecting the mainland to the Imbituba district with a 1430m long lattice-girder bridge. 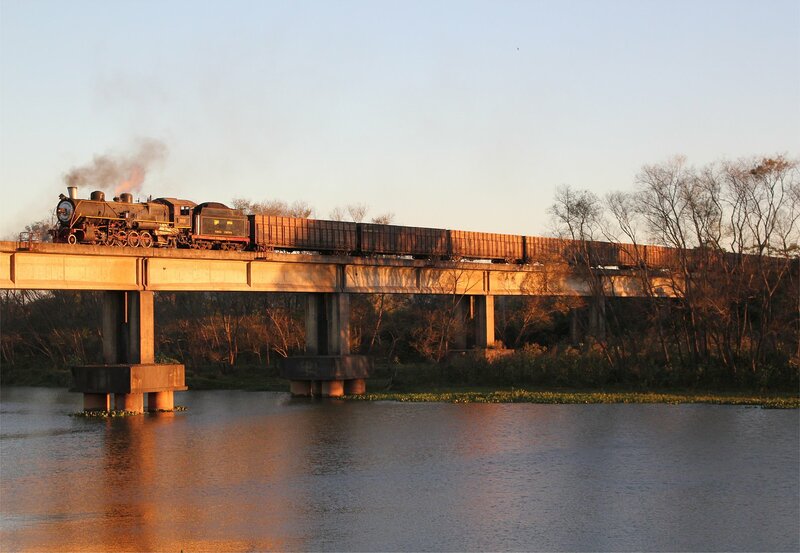 At the time it could justifiably claim to be the longest bridge in South America and, remarkably, it still stands to this day (albeit heavily corroded). 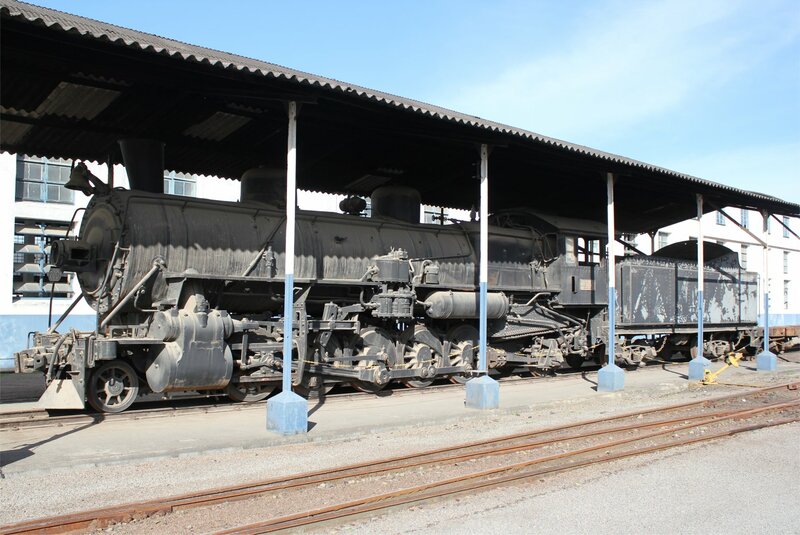 A few sections have fallen away, but apart from that it is largely still intact – though I don’t think I would want to test its ability to hold up a heavy steam freight even were it to be possible to get one up there! 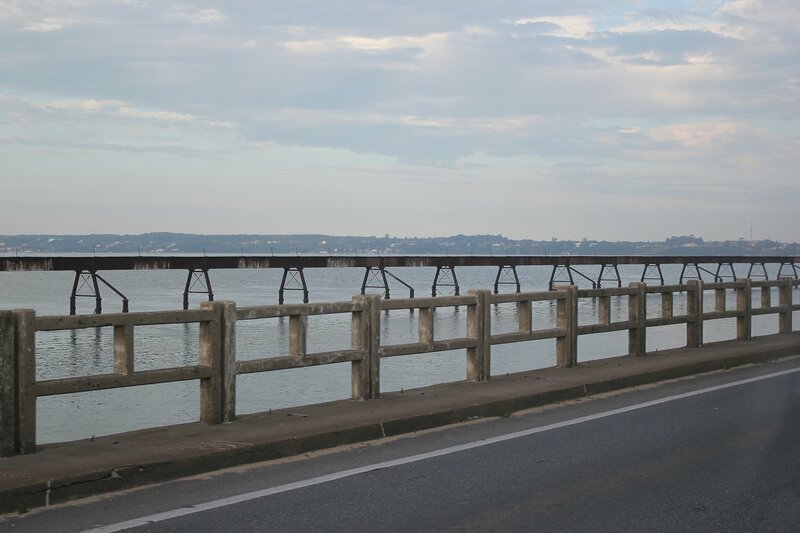 The original bridge was replaced in the 1930s by the Ponte Henrique Lage which was part causeway and part bridge. 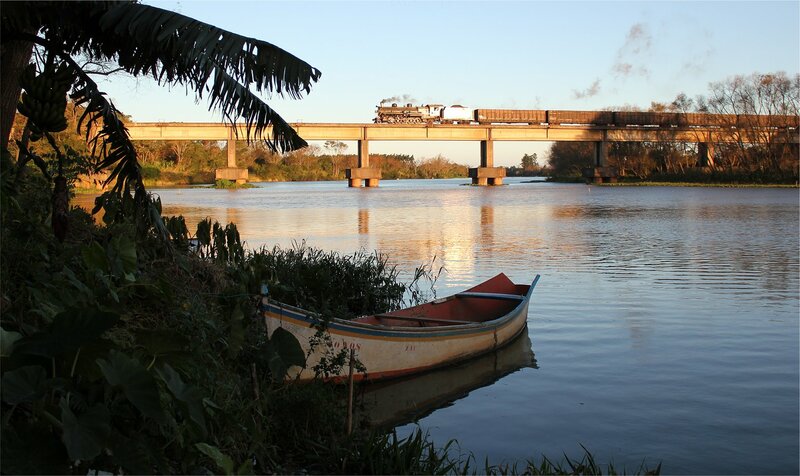 Although the new bridge better suited the heavier trains on the line, it came at the cost of environmental damage to the lagoon. 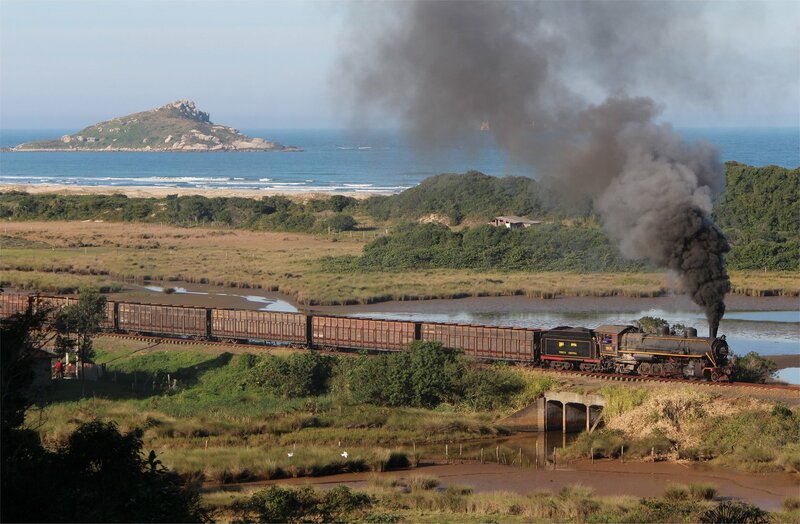 The bridge still carries the railway line to Imbituba to this day – though it is a rare sight to see a steam locomotive racing the traffic on the adjacent highway. 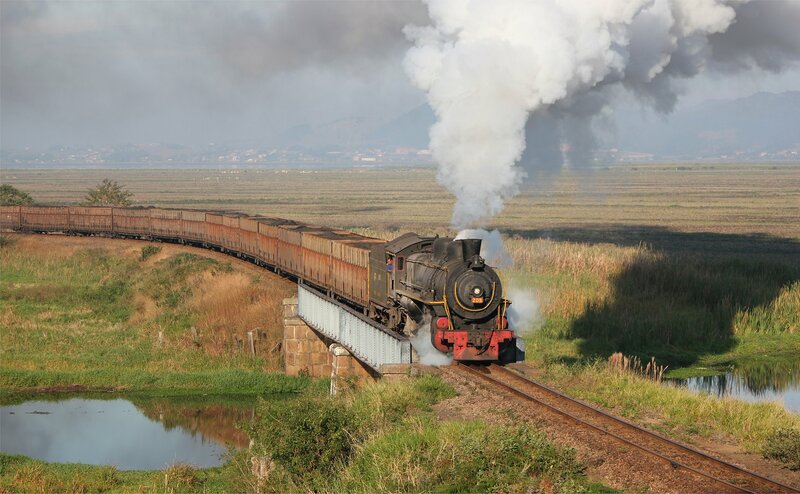 The history of the existing bridge may have its critics but there is no denying that the sight of a steam freight working its way across its length is incredibly impressive. 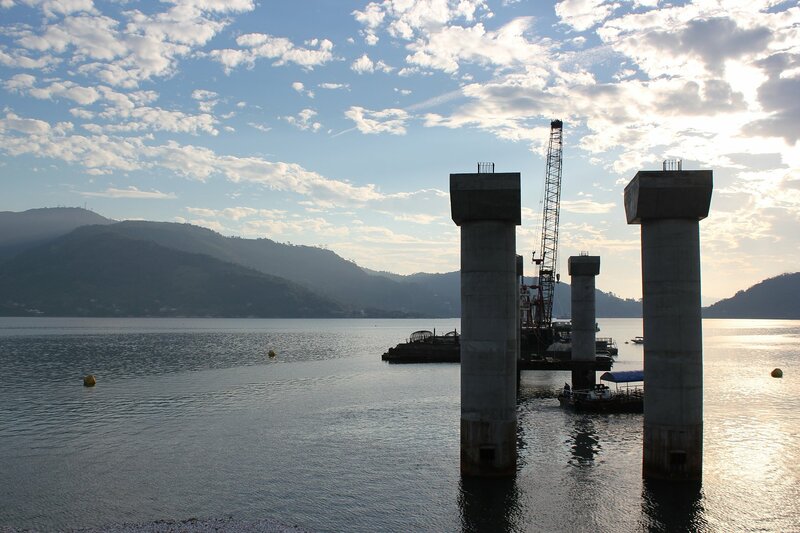 I don’t expect to return here but it will be fascinating to see the photographs of the completed bridge. The day dawned with thick fog surrounding the hotel, but this burned off surprisingly quickly and led us into a rather glorious morning. Even better, there were no more problems. 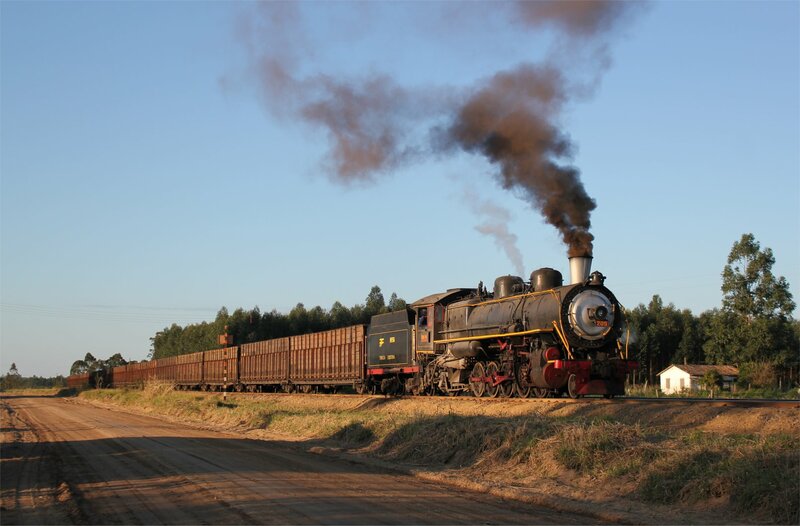 An early start brought us back to the much photographed Ponte de Congonhas to watch a loaded steam freight cross the lowlands in the direction of Imbituba, which looked perfect in the morning light. 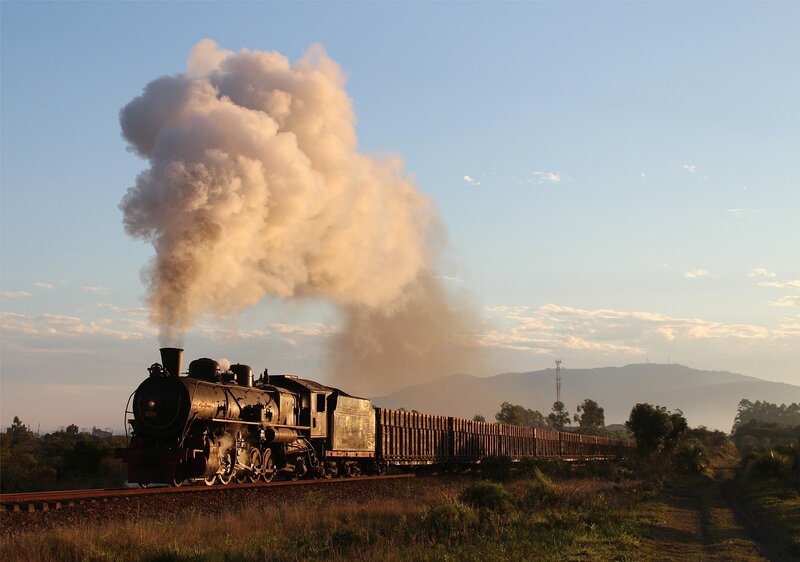 One of the marvels of photo-charters is the the flexibility to run in the best locations at the right time of day, banishing the exasperation of being at a beautiful spot in a valley before the light has climbed high enough to illuminate the track. The other delight of the photo charter is the ability to re-run the shot, usually to get an improvement in the light or to try a different position. 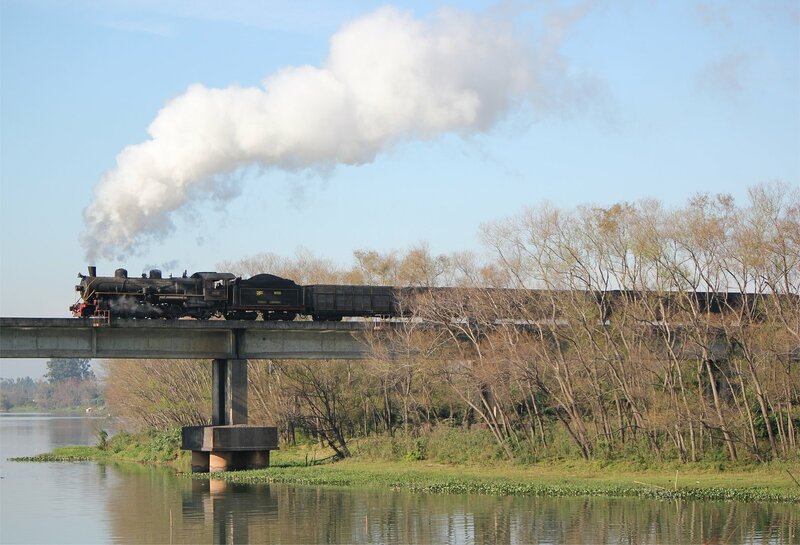 The opportunity to repeat the shot of the steam freight across the bridge was irresistible and allowed us to try a position much closer to the track. It was just as wonderful to watch for a second time. 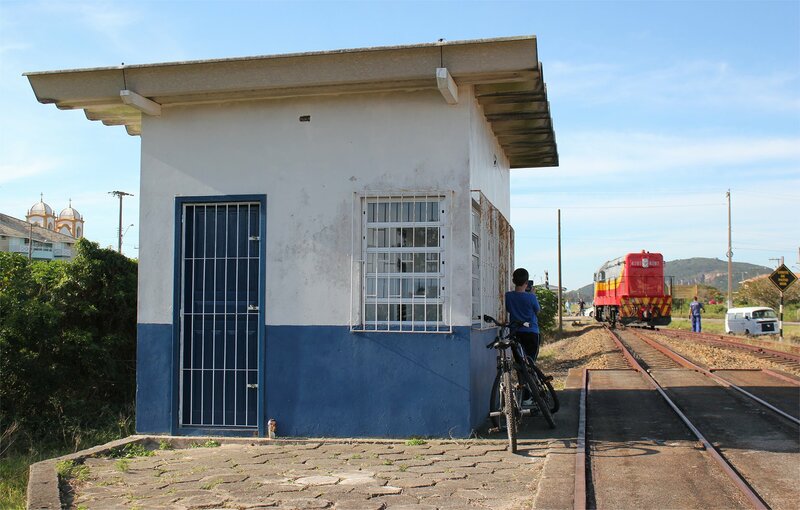 After leaving Congonhas our morning took us on to Capivari Bridge, Capivari Power Station, Capivari de Baixo and finally a small level crossing near Santiago. 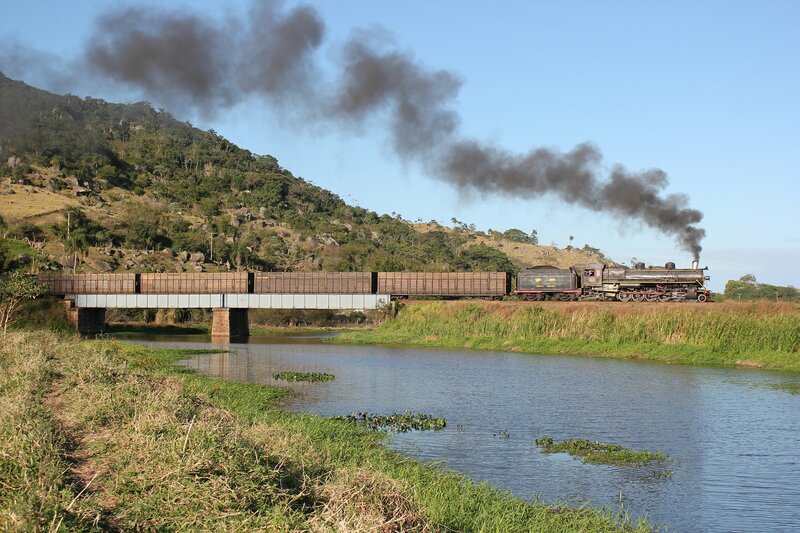 In the afternoon we continued the journey from this point, photographing the steam freight from a footbridge not far from Bananal and then jumped out at the Ponte Henrique Lage to watch the loco work its way across the lagoon. 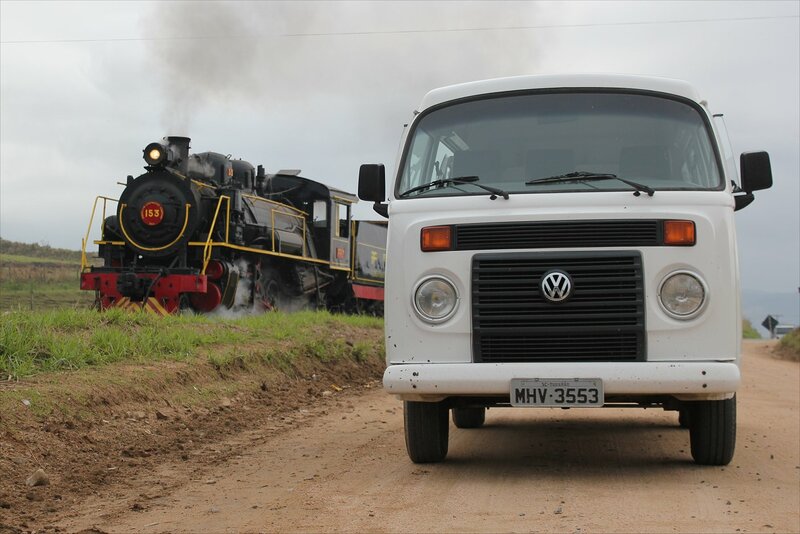 Finally we tested the minibuses by taking them down a sandy track at Cabeçudas and into the shifting dunes that had proved such a challenge during the construction of the line. Inevitably, our minibus got stuck directly over the line and didn’t have the traction to get over. Figuring this was not such a great place to be with a steam freight on its way, we helped to push it back over the tracks before a second attempt succeeded. It was worth the effort as the last shots of the day offered a wonderful glint. 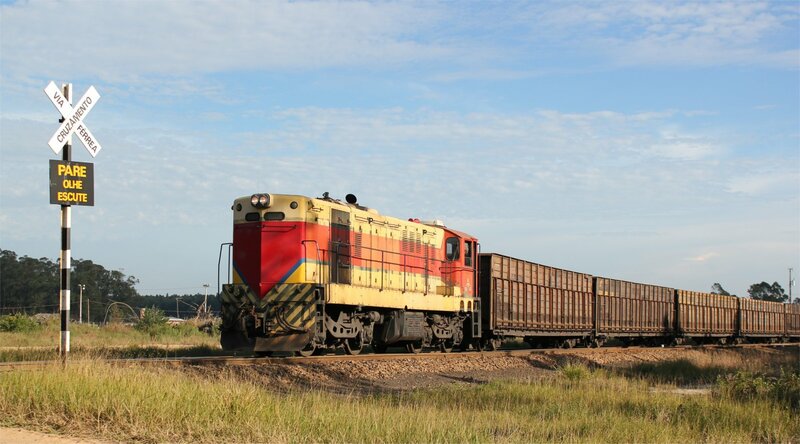 The modern railway uses wagons with a white stripe, but in the 1980s the railway used stripeless wagons. 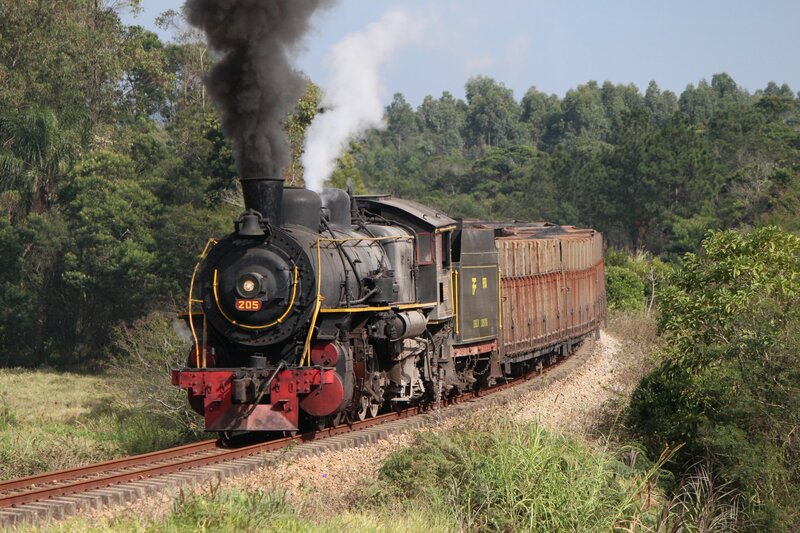 To give us a historically accurate picture the railway had agreed to remove the white stripe from the wagons we would use for the nine days of our trip. 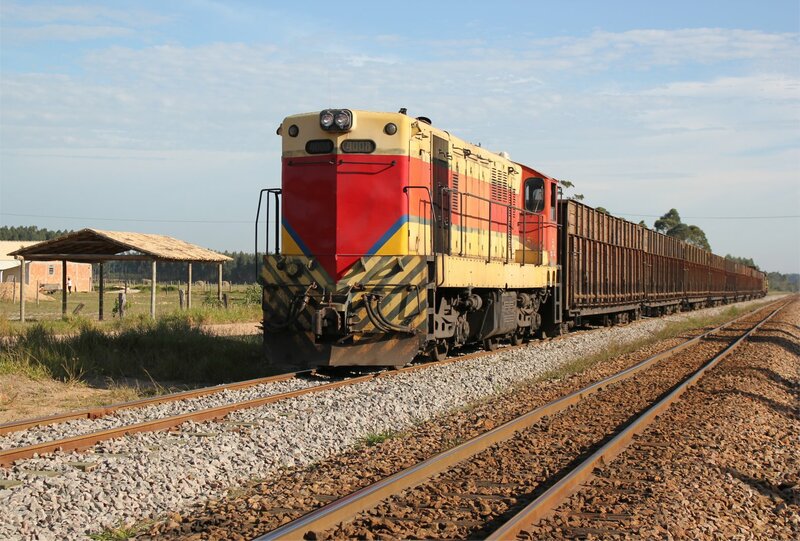 However, the stripeless wagons that we loaded in Rio Fiorita had accidentally been discharged on their return to Tubarão and were now dispersed across the system. 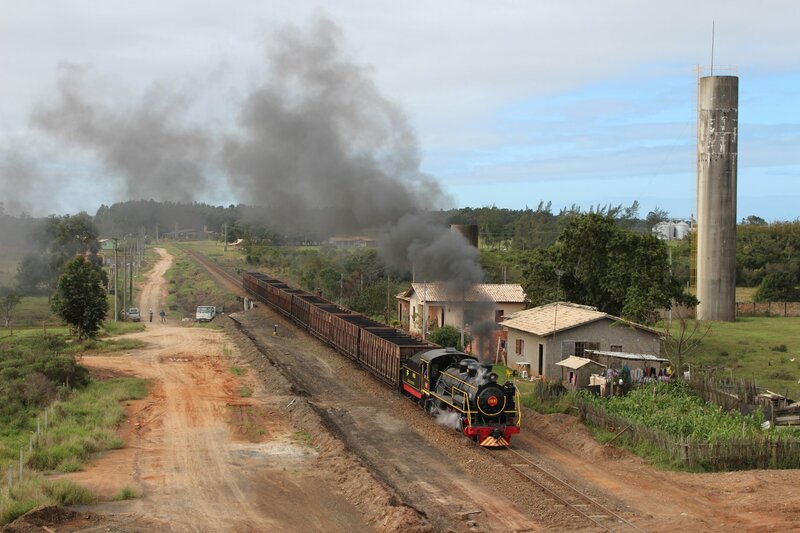 All the railway could offer us for our run to Imbituba were wagons with a white stripe. I must confess that I am not absolutely devoted to historical accuracy, so I could have lived with a white stripe but this would have been anathema to purists. 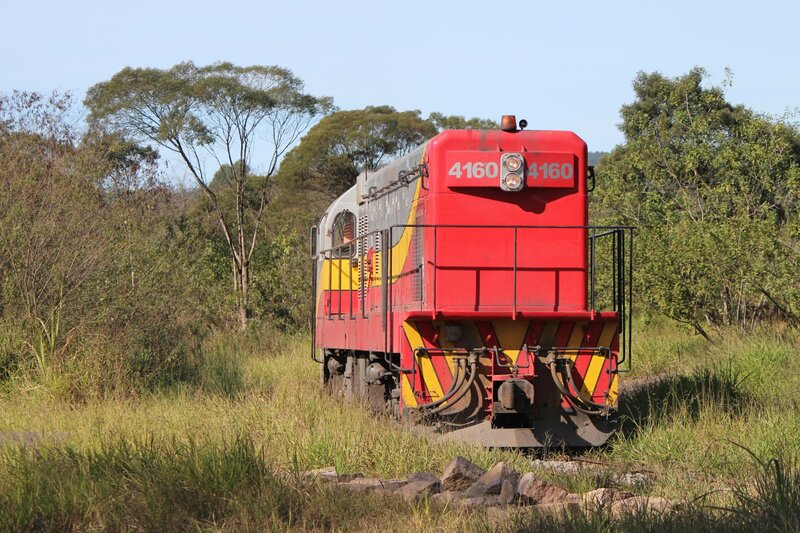 After some considerable discussion a compromise was reached – the railway agreed that we could paint out the white stripe on the wagons they could supply to us! It seemed a small price to pay to get things moving again. 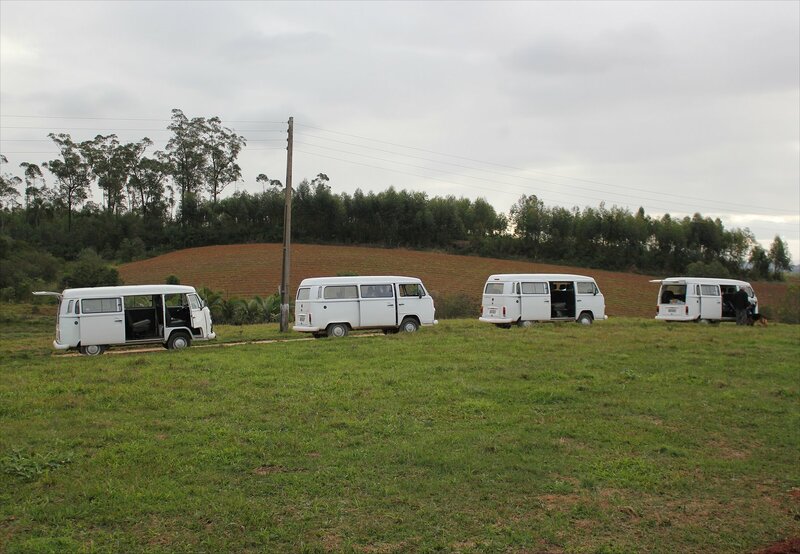 Our convoy of minibuses rolled out of the museum grounds and headed for Imbituba, via the local paint shop. My talents do not lay in wagon painting! The paint job was finished surprisingly quickly which was down to everyone playing their part and getting stuck in. 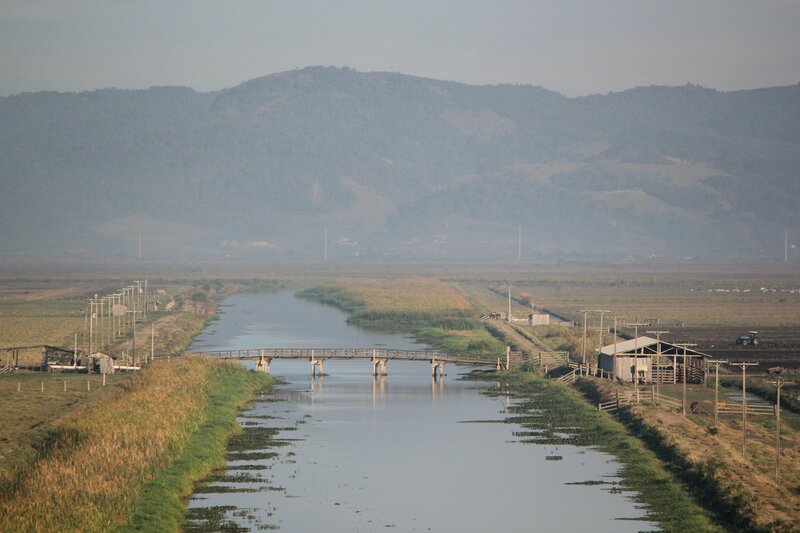 We returned to the minibuses and headed to a roadside spot looking down on the line, the lagoon and the ocean beyond. 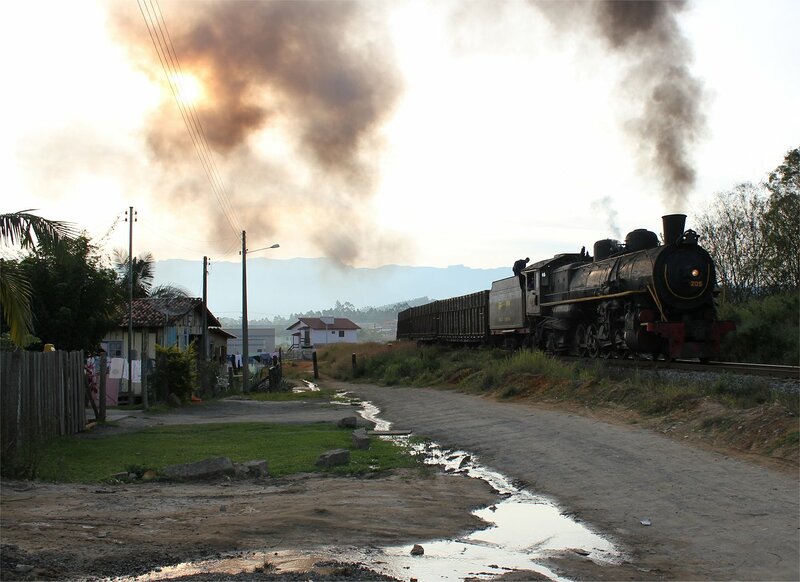 It was a stunning backdrop for our freight train and a scene that I wouldn’t have missed for anything, no matter how mad the build up had been. I fear that for all our efforts we only succeeded in replacing an inauthentic white line with an inauthentic shiny brown line, but I didn’t care a hoot by this point. A beautiful moment had been captured. 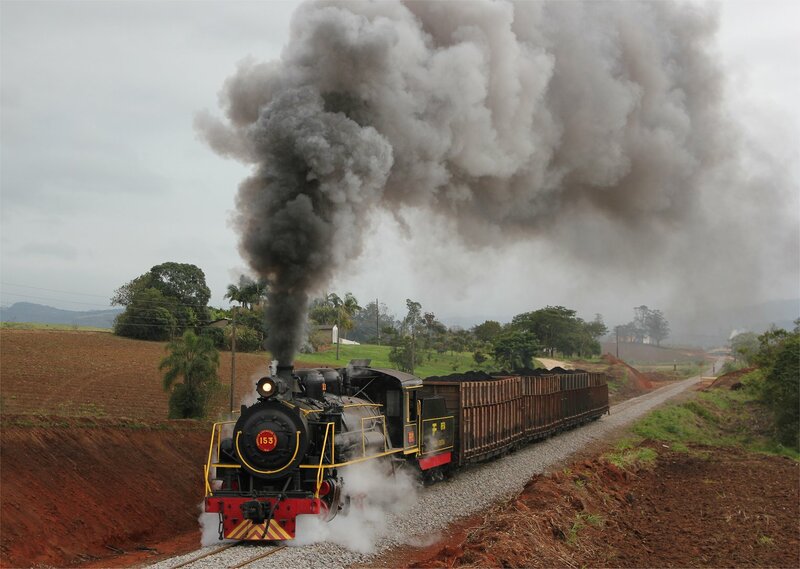 We could relax a little now, enjoying a couple of shots further down the line as we headed back to Tubarão. 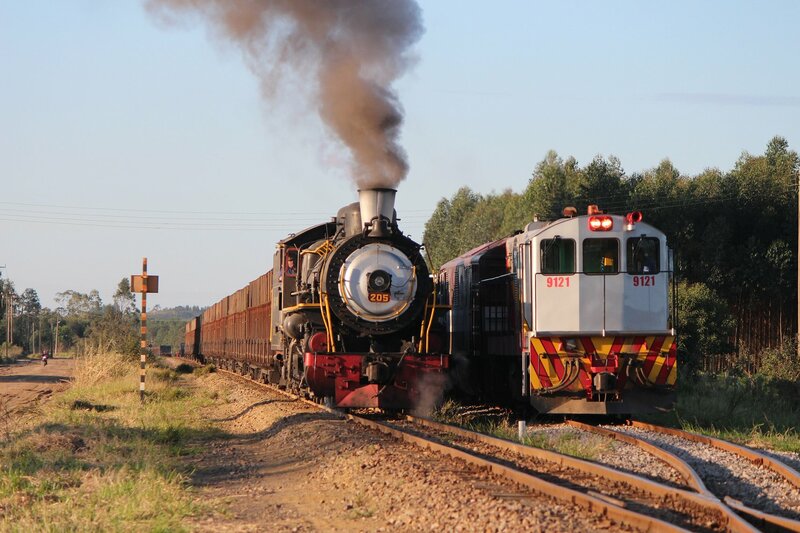 The motorway was heavily clogged with traffic, but when we got going again there was a memorable stretch of driving running parallel to our freight train – exchanging friendly waves. Finally, we ended our day near Cabecudas where we grabbed a last shot before the light faded. The story of the day was that, once again, victory had been clutched from the jaws of defeat. It was something of a surprise to find that the expected disaster had not materialised and that Santa Fe no. 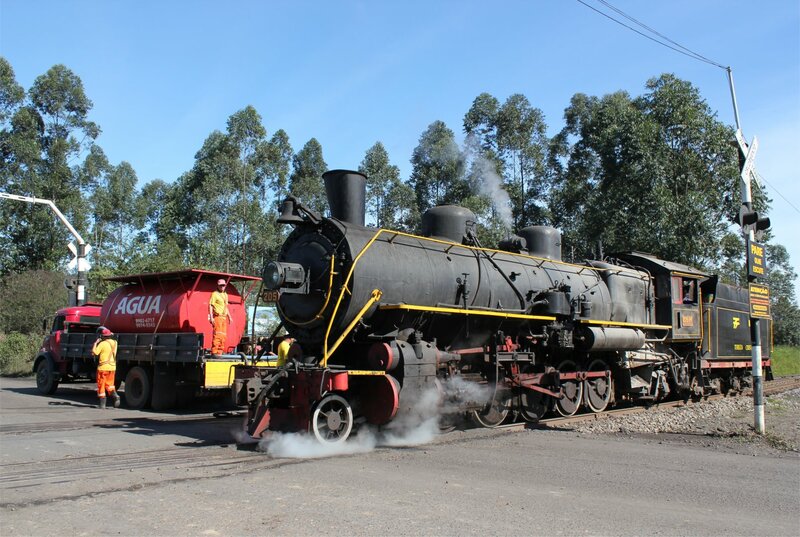 205 had been successfully hauled back to Tubarão by diesel after failing outside Siderópolis yesterday. 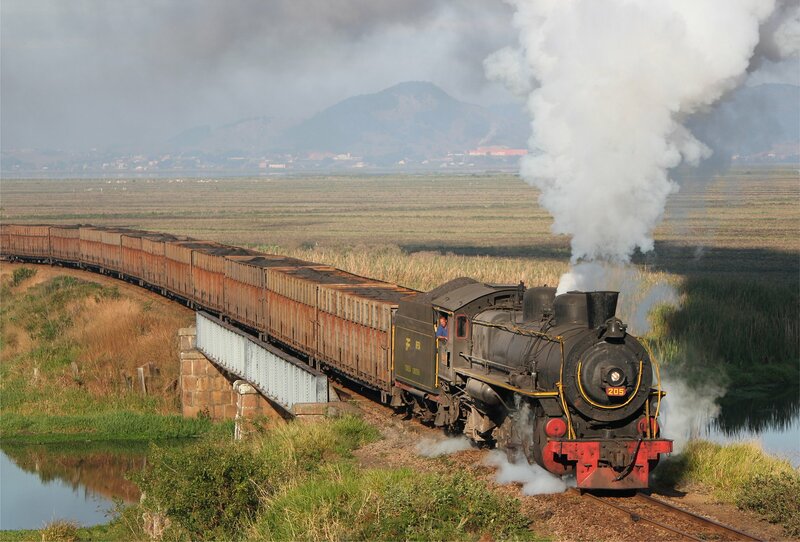 On the down side, not much remained from the supply of the good coal. 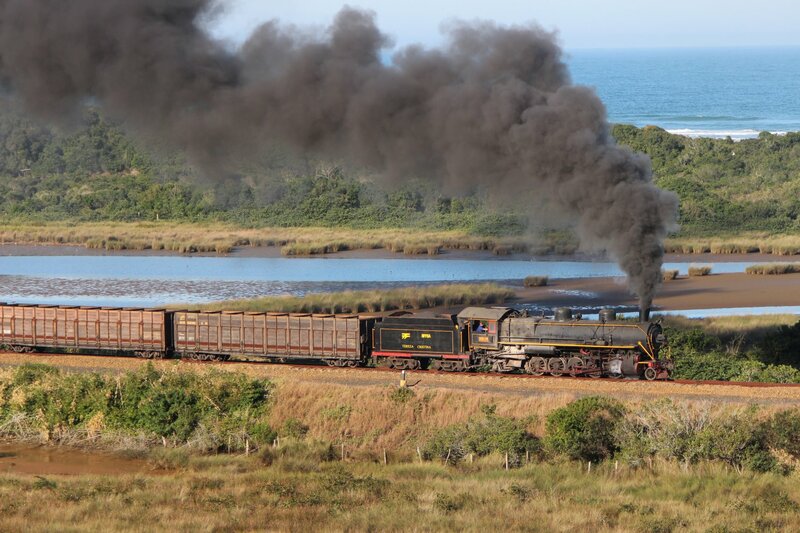 A digger helped load what little remained and we just had to hope that this would be enough to see us through the day, particularly as we were going to try to get to the most scenic spot on the network at Imbituba. 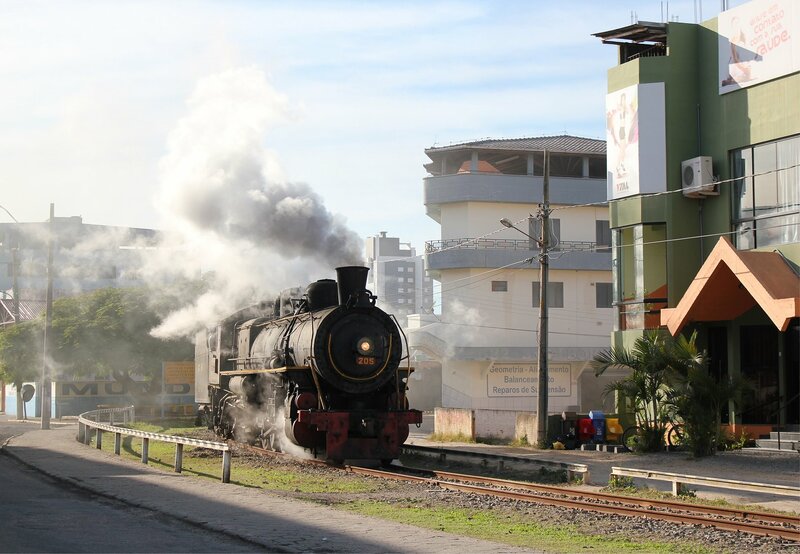 After the tender was fully loaded we followed the locomotive through the streets of Tubarão as it worked light engine to the diesel workshops to take on water. 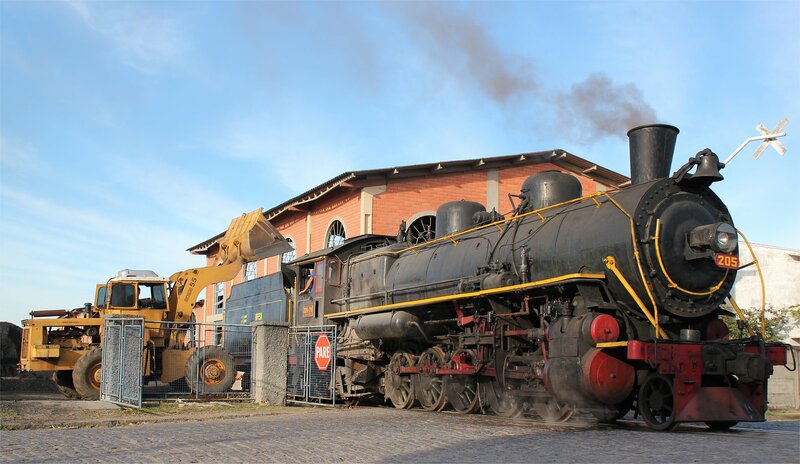 We were given permission to enter the workshop grounds where two stored steam locomotives could be seen under cover – 200 2-10-2 Skoda 1985/1949 (ex-Ferrocarriles Argentinos 1355) and 210 2-10-2 Henschel 23592/1937 (ex-Ferrocarriles Argentinos 1337). 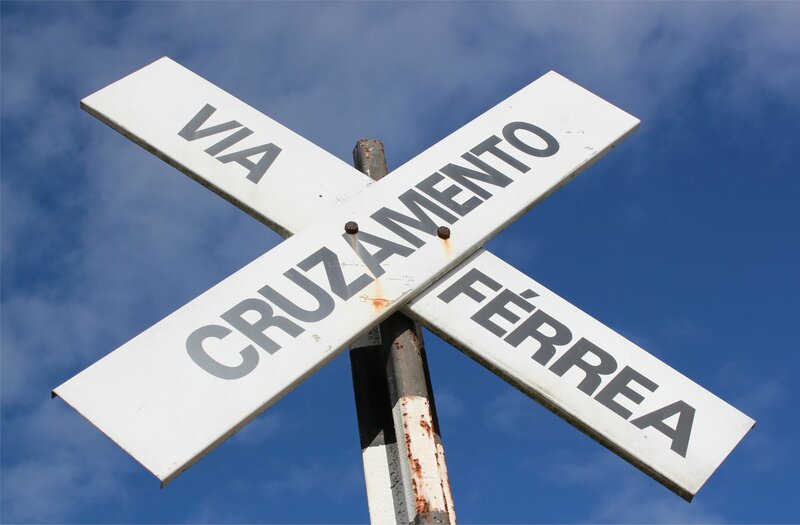 At the workshops we were met by an official from the Ferrovia Teresa Cristina (FTC) who helped us understand the ambition of the railway, which wants to extend the existing line to Araquari to the north and to Cel. 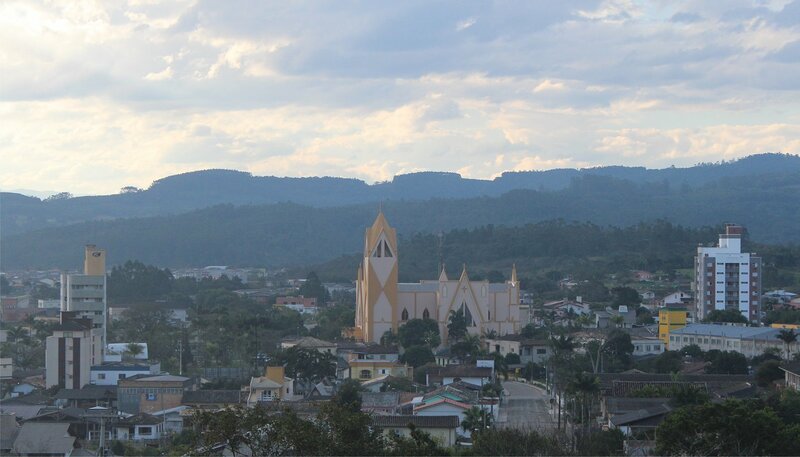 Freitas in the west. 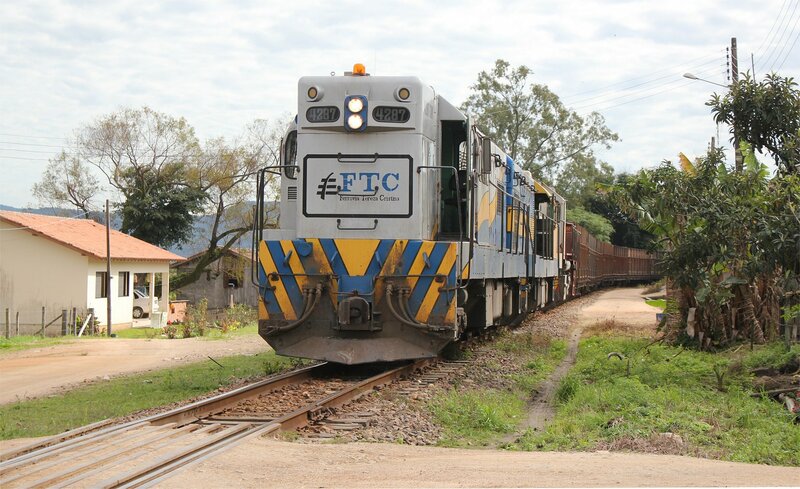 This development would connect the isolated FTC network to the national network and create a rail cargo corridor through the state of Santa Catarina. 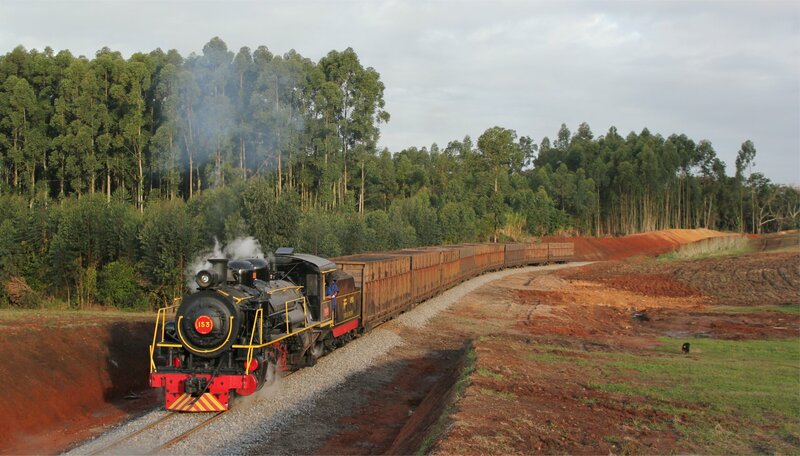 If successful in this endeavour, the railway could carry everything from ceramics (a key product of the state) to containers between the interior and the ports. After our little jaunt to the workshops we headed back to the museum, expecting to be on our way again before too long. 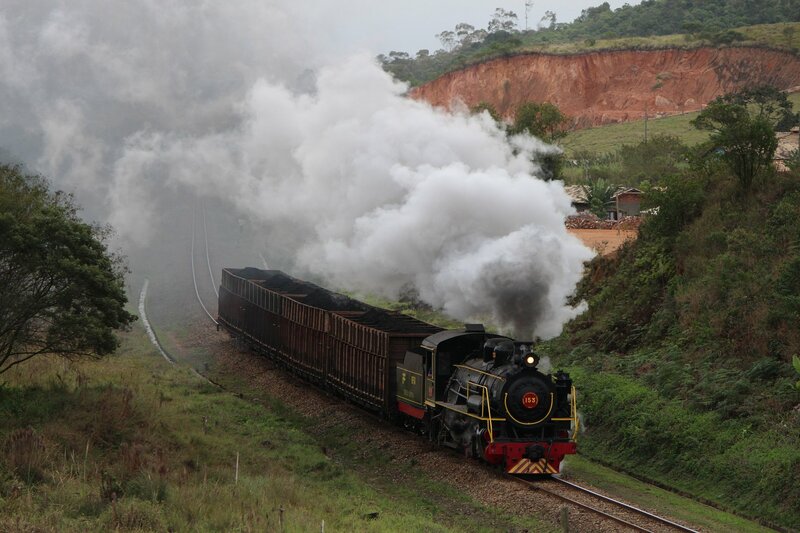 The plan seemed to be that our train would be hauled by diesel to Imbituba and then detach for the steam freight to work back towards Tubarão – a sensible plan given that we only had enough coal to get one way. However our confidence slowly drained as time passed. 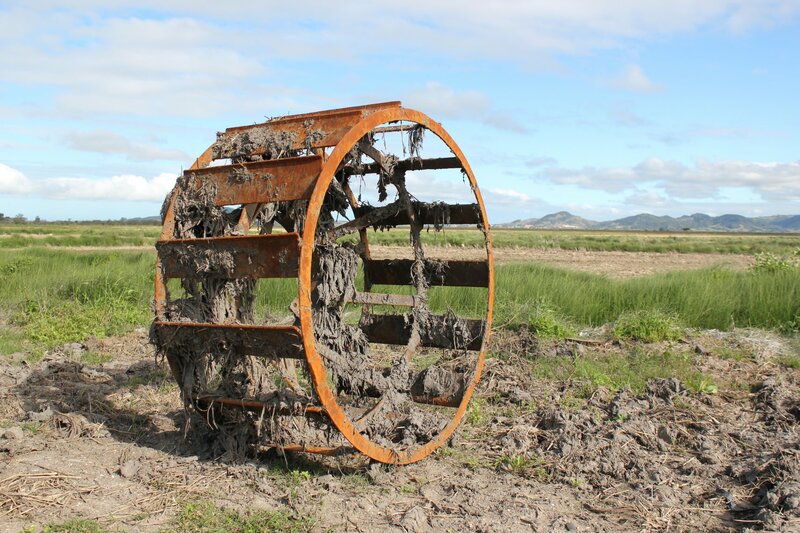 After two hours sitting around in the grounds we could only be sure of one thing – a new problem must have arisen! An early morning drive down the motorway brought us to Eng. 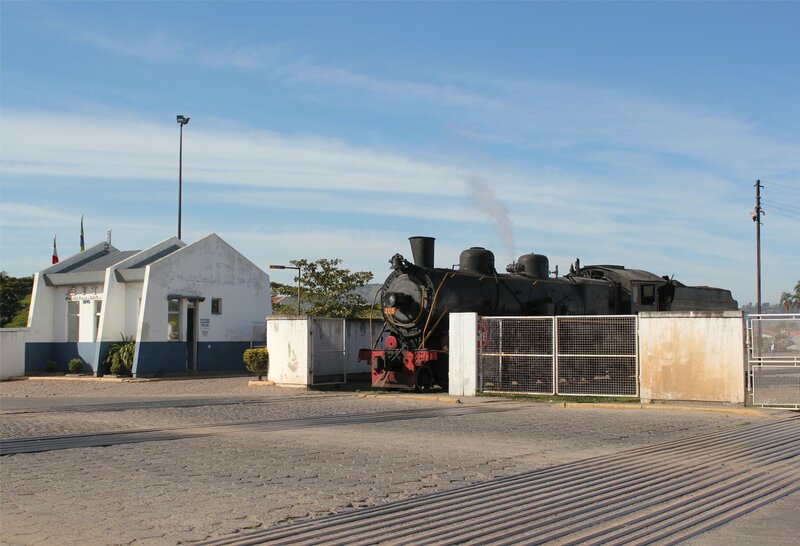 Paz Ferreira station (Criciúma, Santa Catarina) for an early start with Santa Fe no. 205. 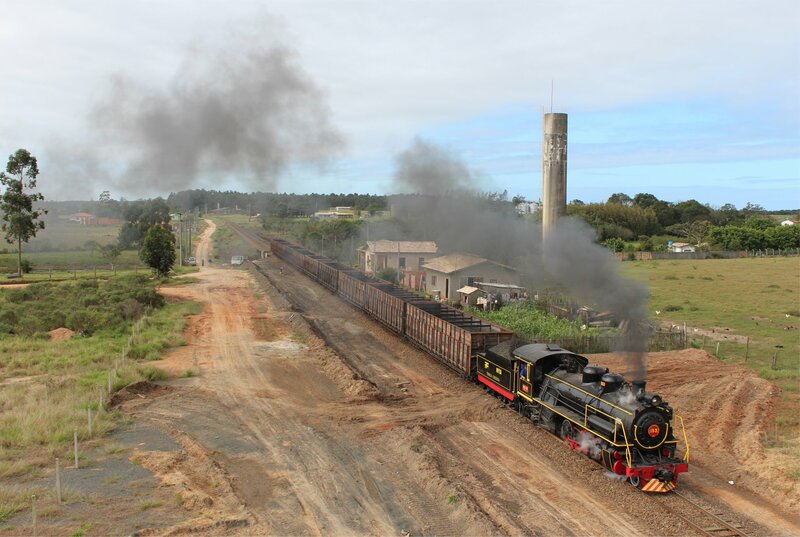 The locomotive underwent something of a transformation in the yard with the smokebox and chimney painted black to give it a more authentic look (something that we particularly appreciated after last night’s video screening showed how things looked in the 1980s). 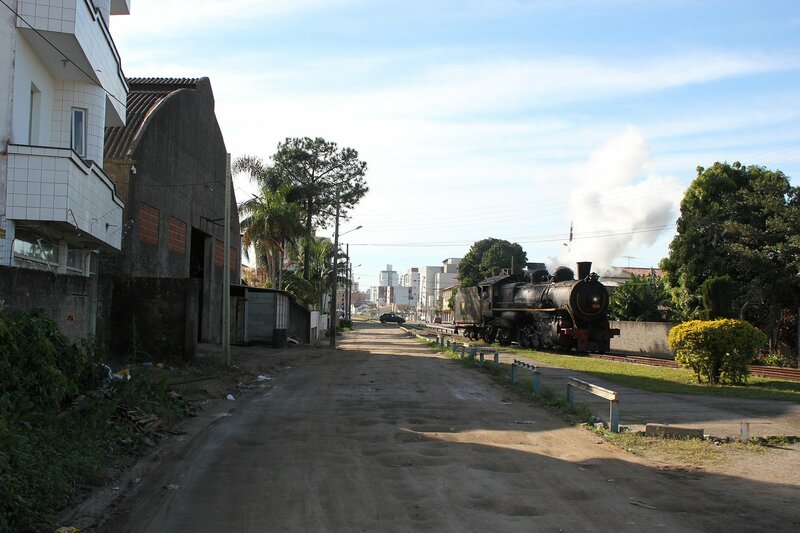 There are some areas of Criciúma that are not particularly safe for tourists to wander into but it so happens that this is precisely where the line goes – cutting a path through an area that was described to us as the ‘backyards of drug dealers’! It didn’t look too threatening when we turned up but we heeded the warning not to venture in, watching as Santa Fe no. 205 steamed through. 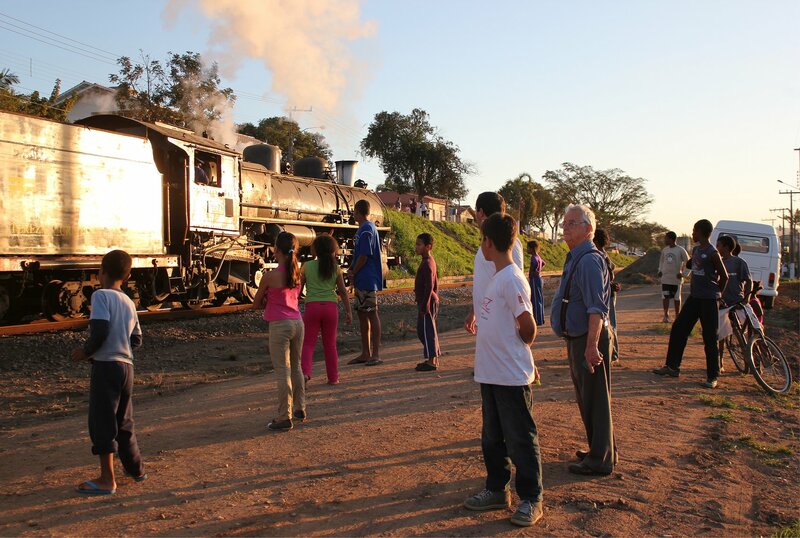 The locomotive attracted plenty of attention, with locals coming out from their homes and workplaces to get a closer look. 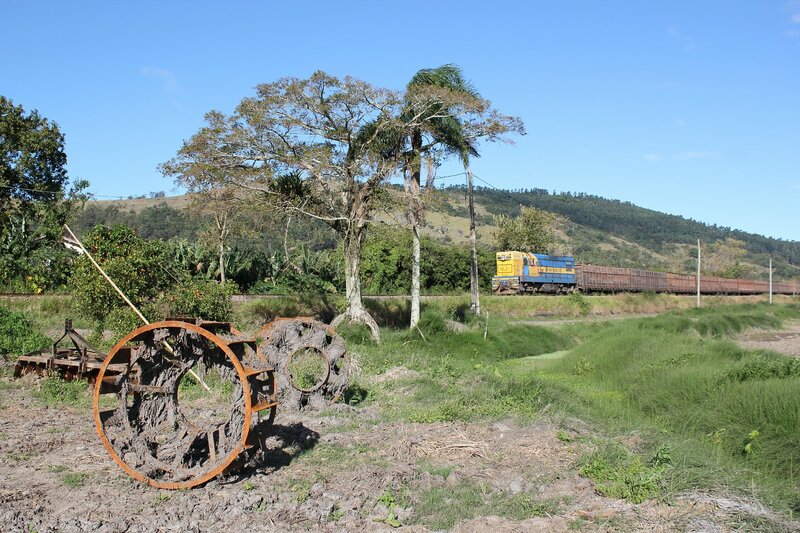 As the crew answered questions from their loco’s new admirers we drove on to the next position – a long abandoned loading point that looked rather splendid in its crumbling state. 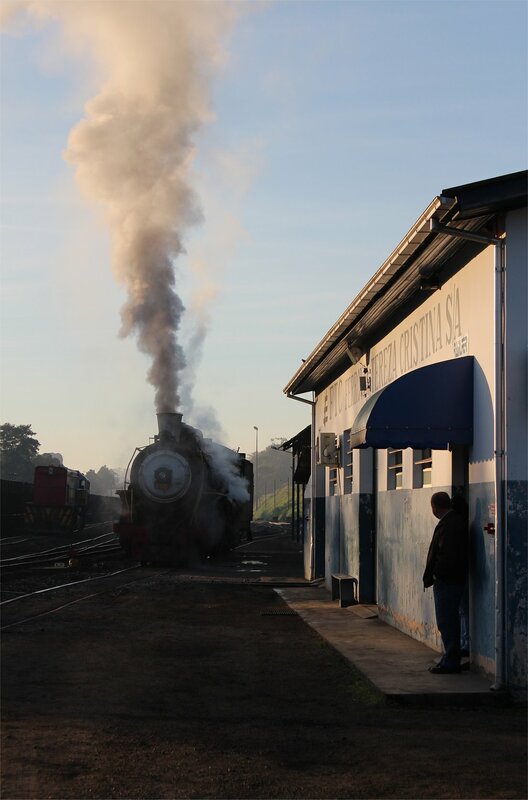 The next stop, on a gradient, gave us one last magnificent burst of steam power before Rio Fiorita. 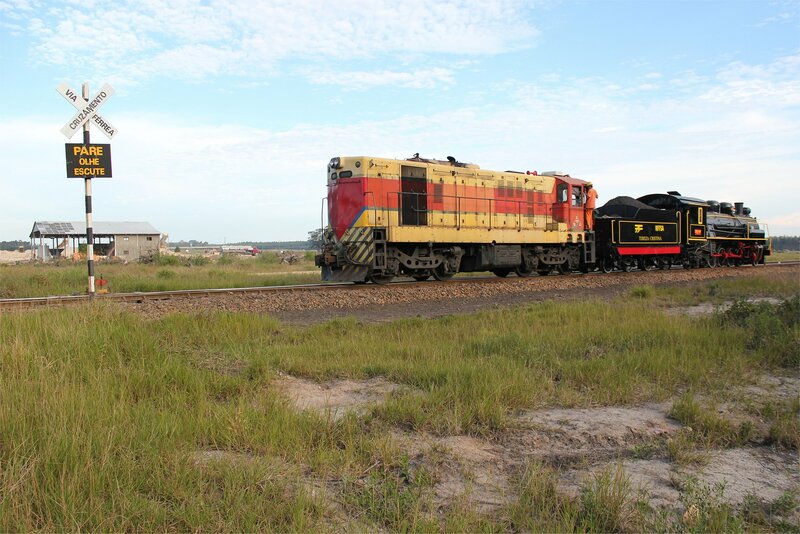 The locomotive had to pass through without stopping as it needed to clear the line for the diesel freights coming out. 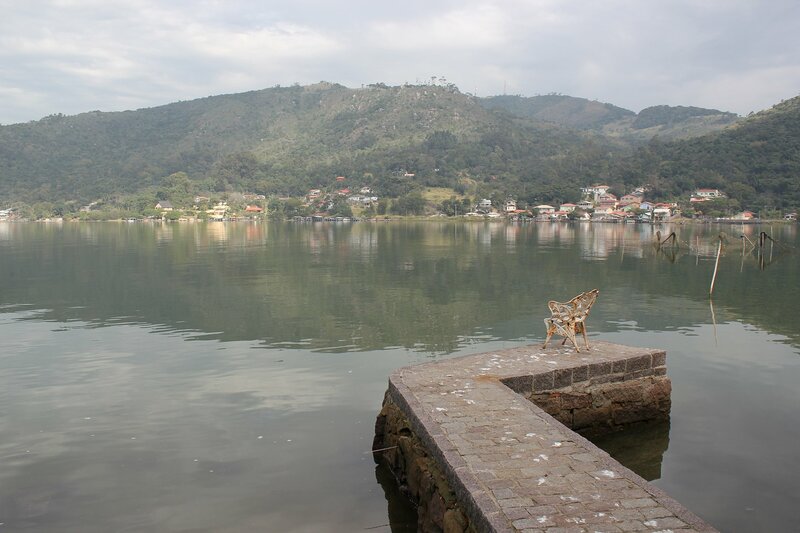 Finally, we made it to Rio Fiorito in late morning. The midday heat made the loading facility a somewhat unforgiving location to rest, with little in the way of shade, but we had no choice but to wait it out. 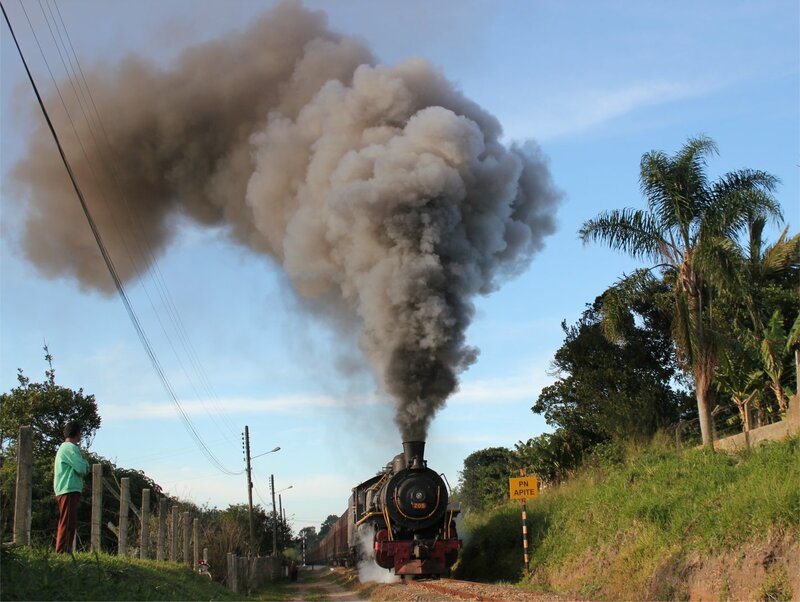 In the meantime, a local journalist from Radio Siderópolis turned up to gather material for the strange story of the foreign tourists visiting Siderópolis, admittedly not a well known tourist destination, in search of steam. 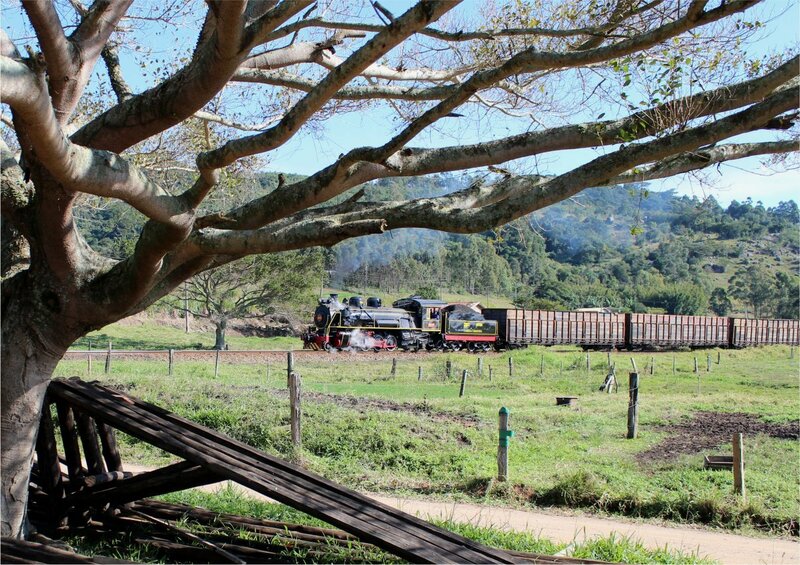 The resulting story and photographs can be seen at Turistas visitam Siderópolis para conhecer a „Maria Fumaça“. 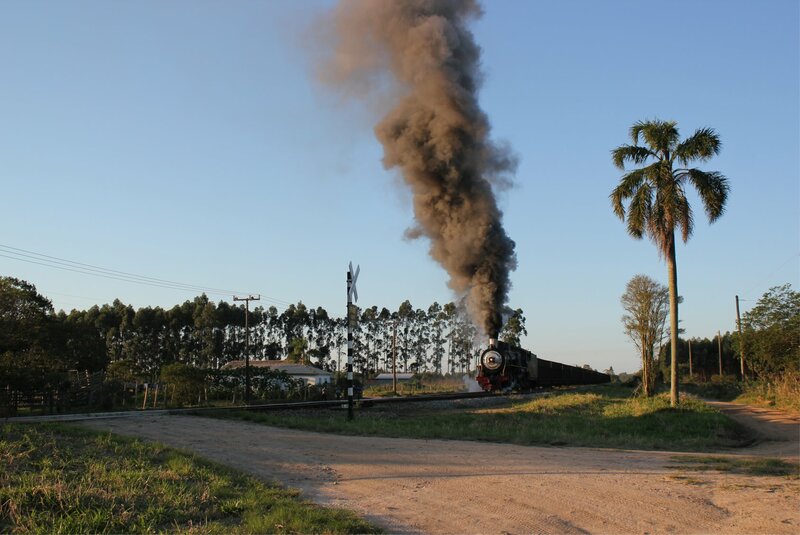 A water truck organised by a Brazilian railway enthusiast turned up at 1pm and solved our first problem with impressive speed. 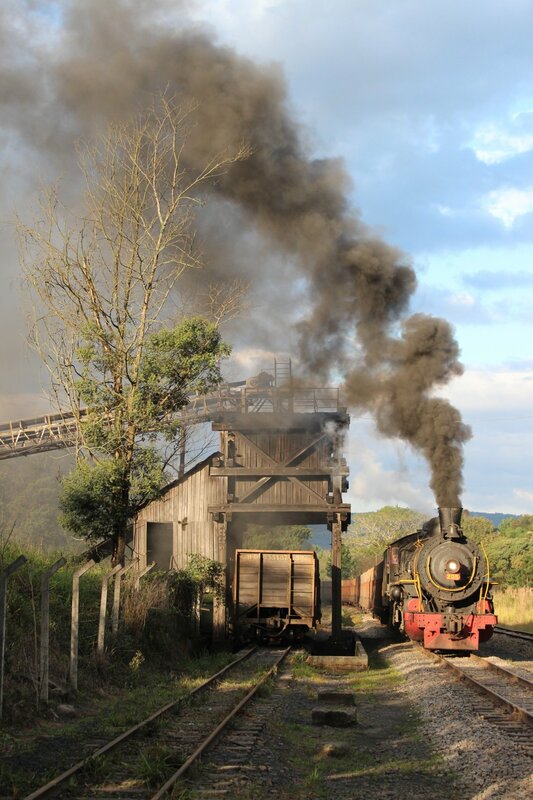 As all this was taking place the trucks continued to deliver coal and by the time we were ready there were sufficient supplies to load our train – a process that has now been captured from every conceivable angle by umpteen photographers. 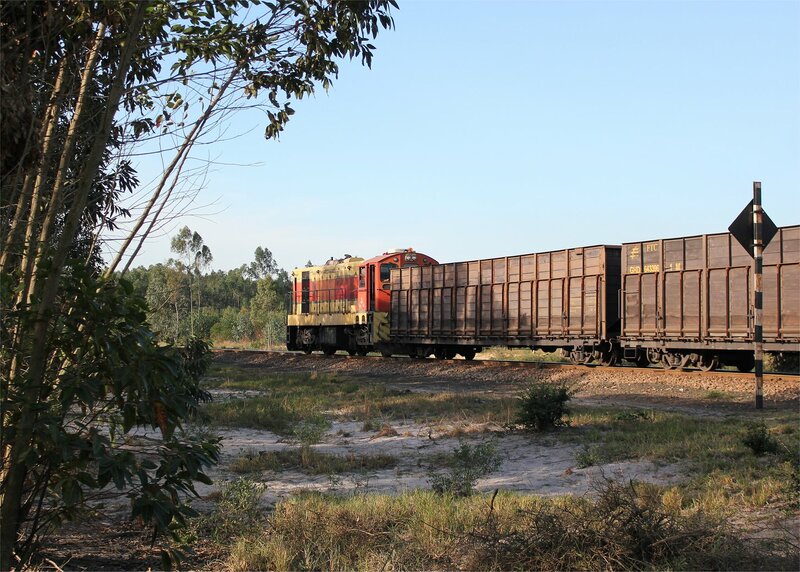 The process took a while but by the end we had 14 full wagons, giving us a load of approximately 1120 tons. A path was available to us, meaning that we could finally make our escape from Rio Fiorita – heading off in our minibuses around 3pm. 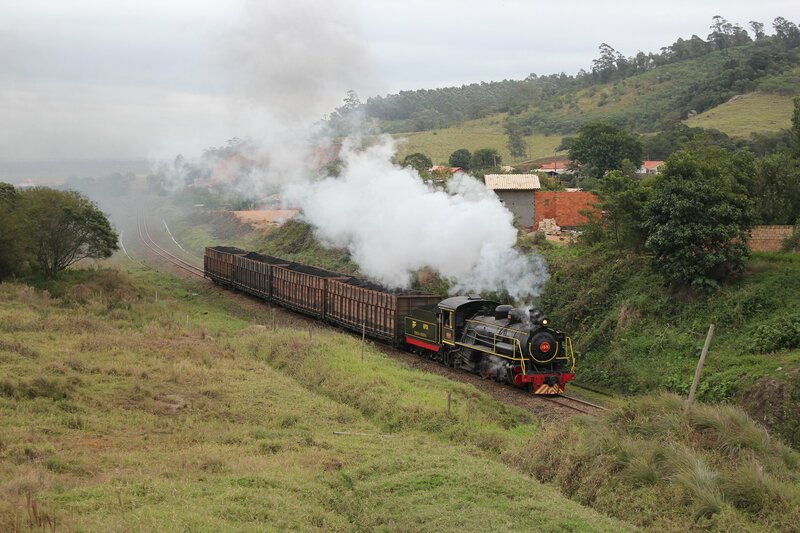 Our destination was a gradient on the approach to Siderópolis where we saw our freight train struggle with her load before finally stopping 800 metres from the tunnel. 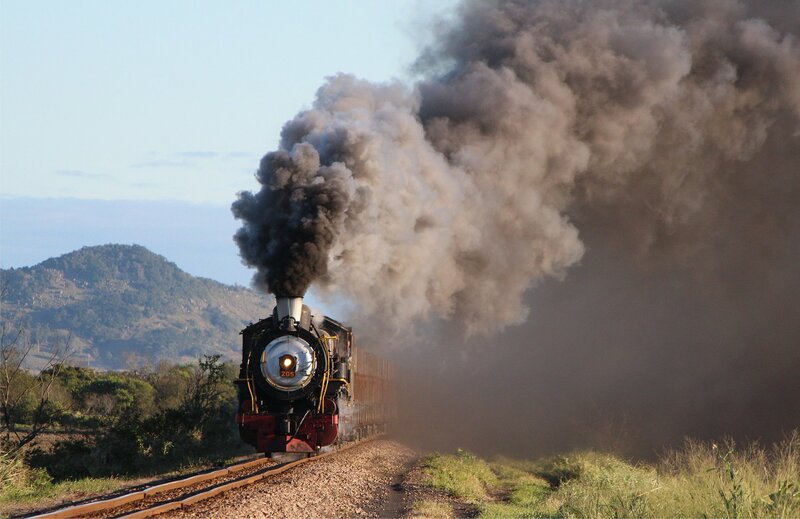 It might have been a different story in the days of real steam when the locos were in much better condition but today, with not enough of the good coal left, it was just too much. 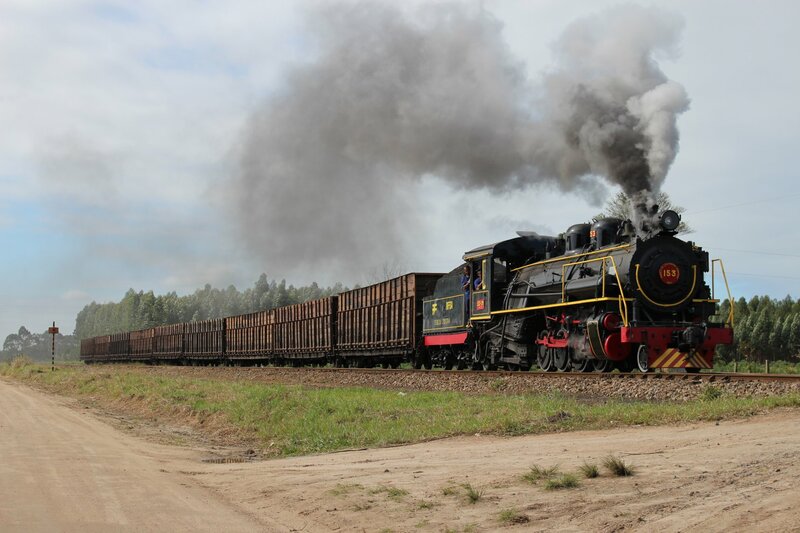 When asked what he would do differently next time, our tour leader said he would take 13 loaded wagons! The crew asked for a diesel to come and assist, whilst once again an admiring crowd looked on. It was clear that our day of photography was at an end so it was time to relax a little before the long drive back. No-one needed to be told that tomorrow was likely to be problematic. 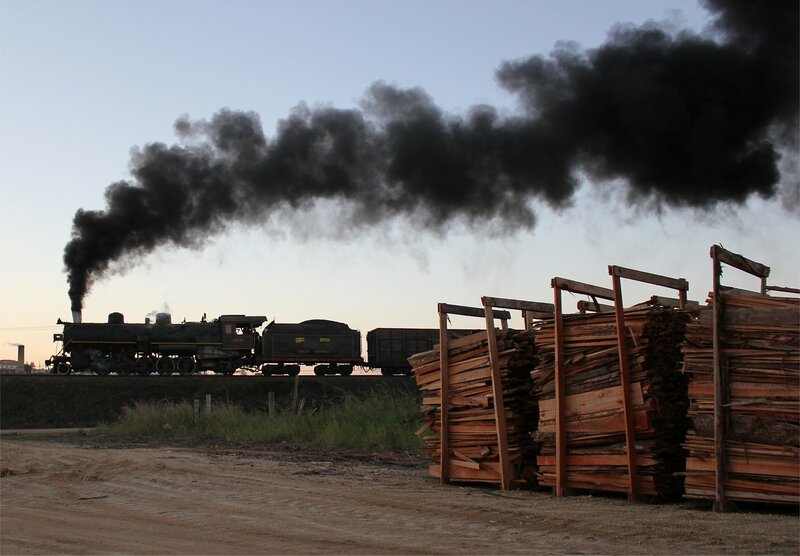 The new supply of coal was loaded and it was time to get back on the road. 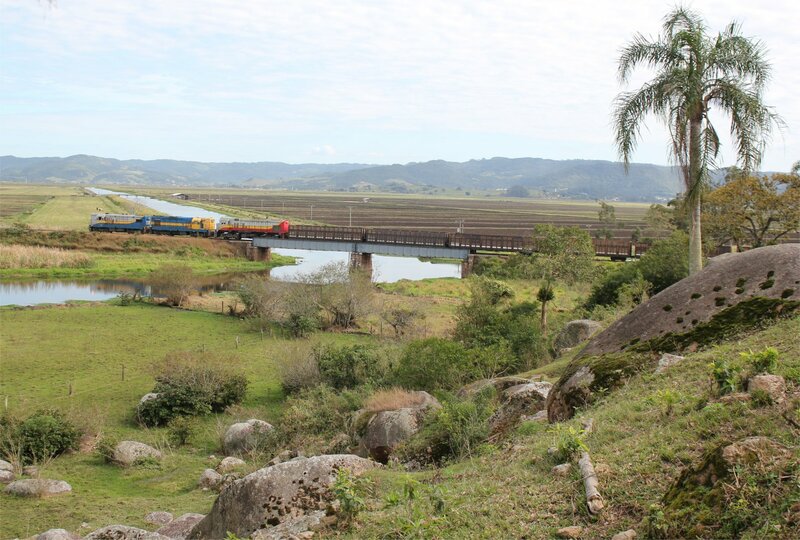 Our first port of call was the Congonhas Bridge, a spot now very familiar to us, but this time we were down in the fields rather than up on the hillside. 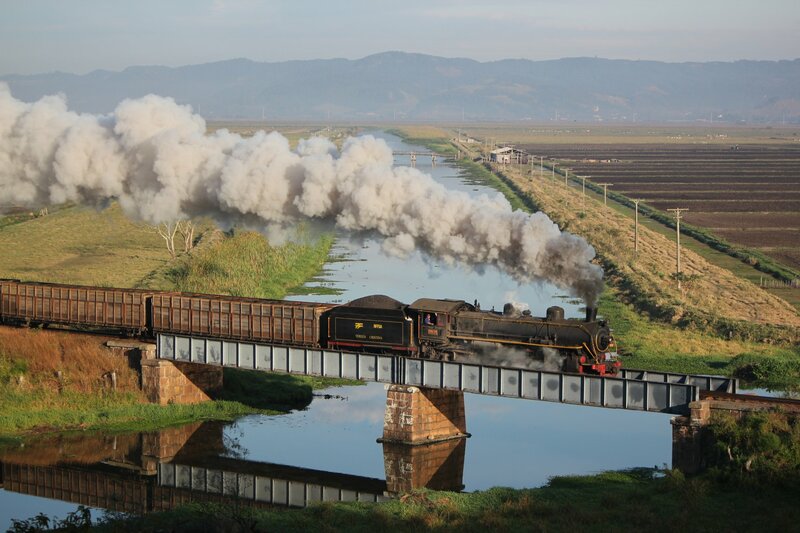 The route to the perfect spot involved crossing a wooden footbridge, skirting a field and then walking a short distance along the riverside – all of which was rewarded by a magnificent view. 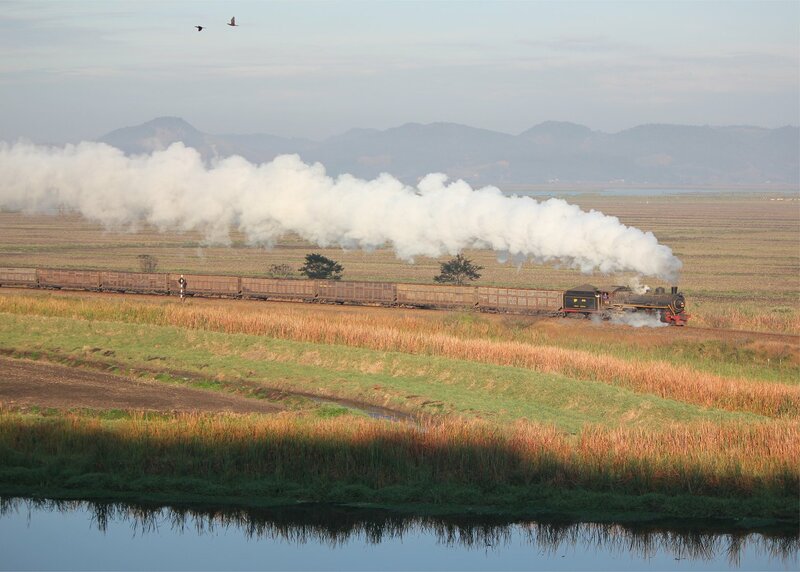 The view was terrific in its own right but when combined with a steam freight made for a very special moment. It struck me as being the highlight of the trip to date, so I hope I managed to do it some justice! Now we had to re-trace our steps in a frantic dash back to the minibuses. The railway had agreed to hold our train on the line for 15 minutes but no longer. One by one the minibuses filled up and disappeared in a dust cloud, heading across the lowlands at speed (no mean feat given the incredibly bumpy dirt road). 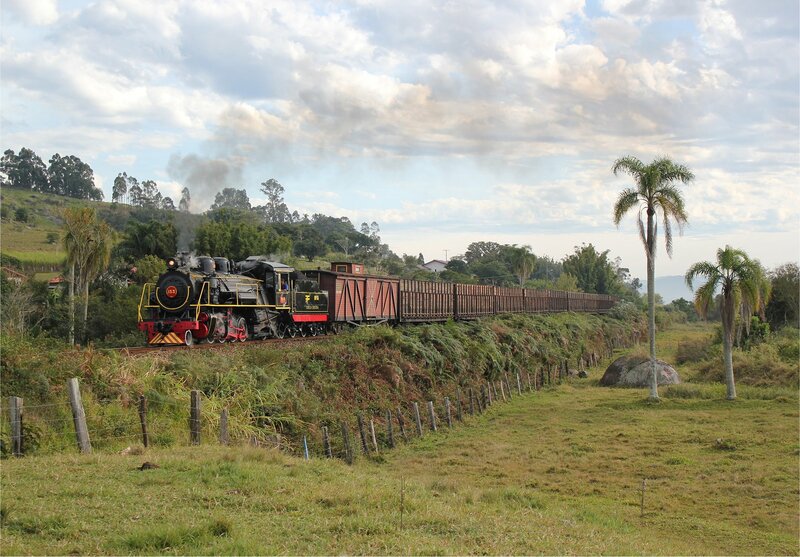 At the other end we emerged in time to watch our freight train cross the lowlands, passing a farmstead that looked no different on the outside than it did in photographs from the 1980s. 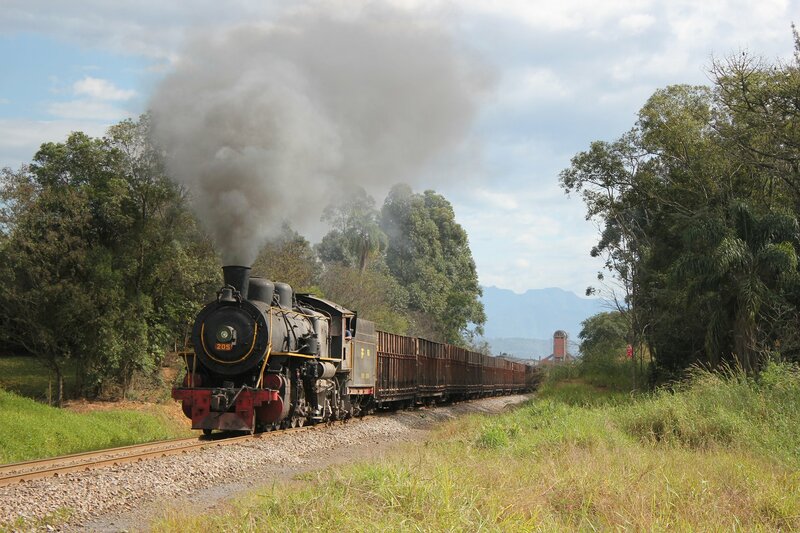 Our freight train made it to the loop between Jaguaruna and Morro Grande where diesel freights in both directions were threaded past. 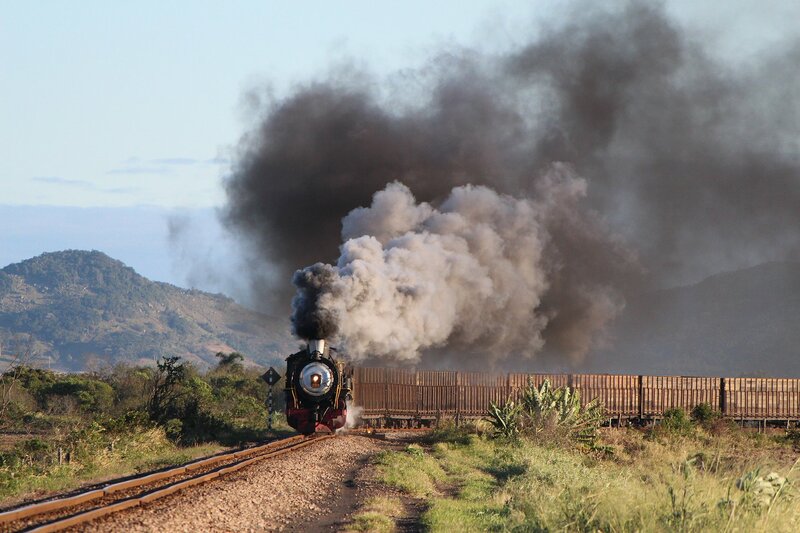 A moment like this reminded us that the modern railway had to be applauded for their flexibility, it must have been incredible tricky to find a path for our train given that traffic has doubled in recent months. 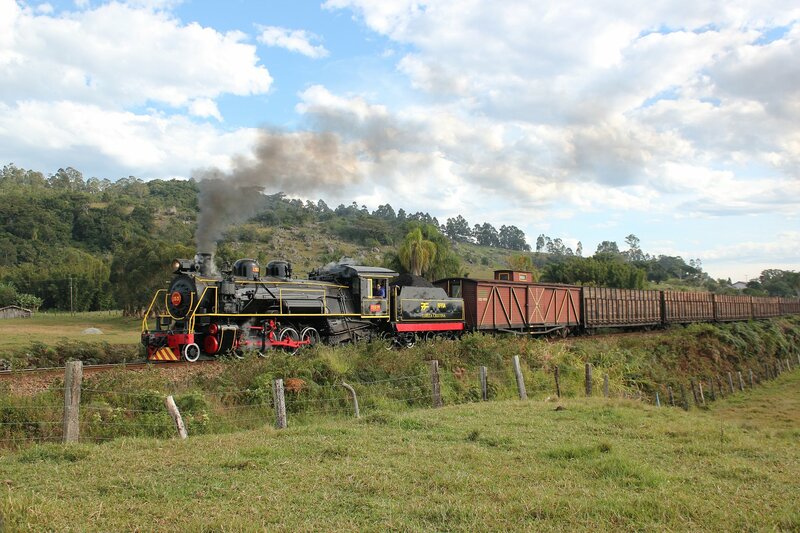 After both diesel freights had passed we continued on to Morro Grande, where the Santa Fe attracted much attention from locals by the lineside. The final shot of the day came at a factory by the motorway. At first it seemed a little bit of a head-scratcher but in the end I settled for a contre-jour shot with some of the wooden stacks in the factory grounds. I was a little unconvinced as I was setting up but quite like the end result! In the evening we had an impromptu viewing of the museum’s CD of the line in the 1980s. 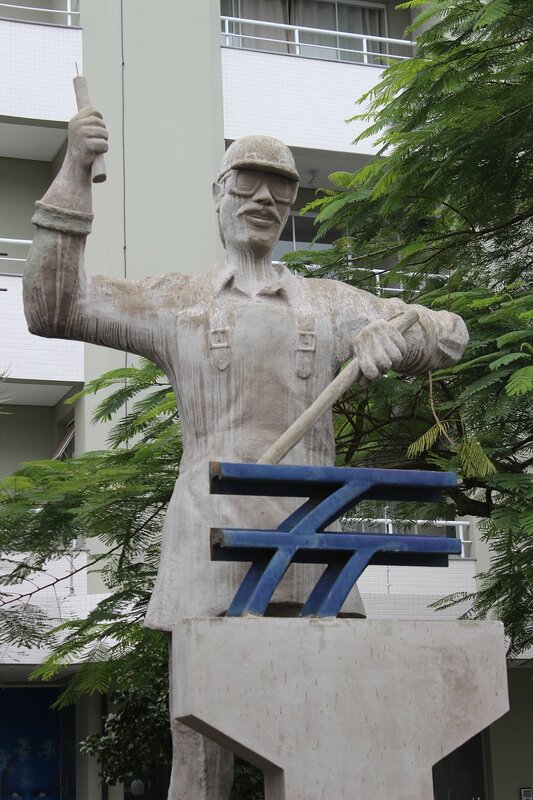 It is an incredible record of how things were under real working conditions – quite remarkable footage. The CD is available for sale from the museum and is well worth every real. Our delivery of coal was expected first thing in the morning but none of us were terribly surprised to awake to the news that it had not arrived. 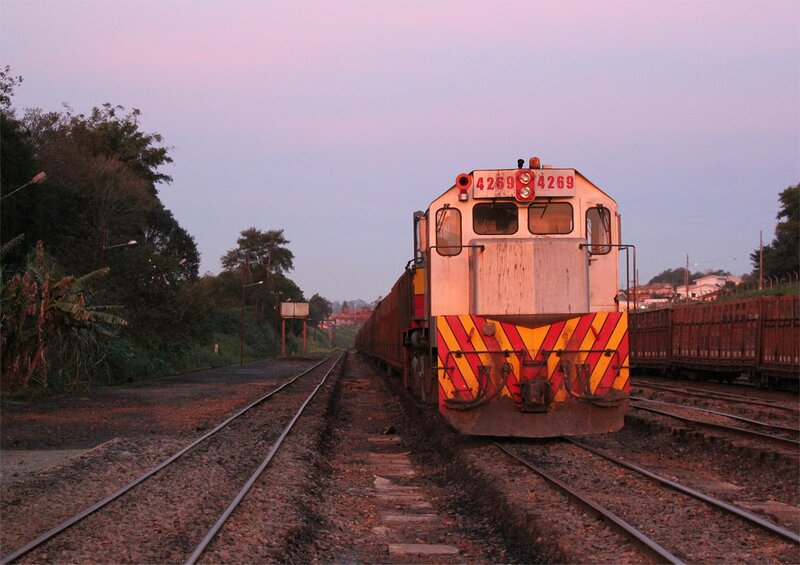 Nevertheless, we were re-assured to hear that the driver had set off from the depot at 6.30am. 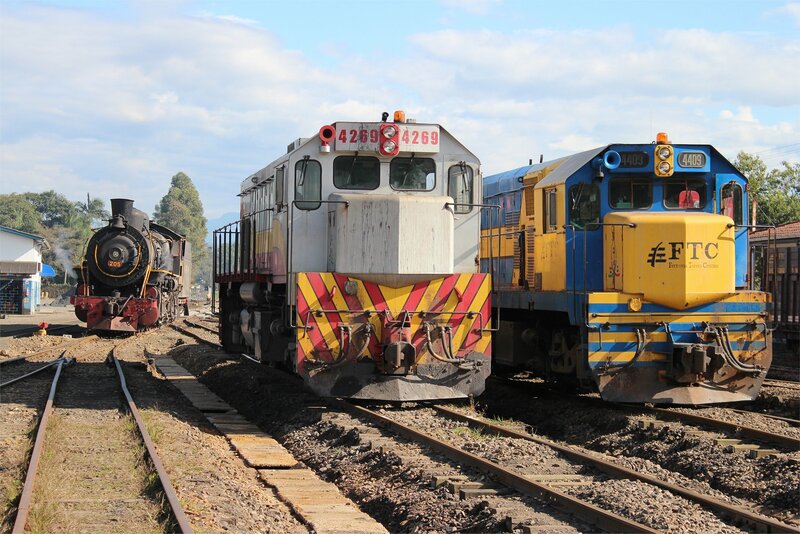 The diesel freight was impressive when it turned up – a triple headed working with about 55 wagons. 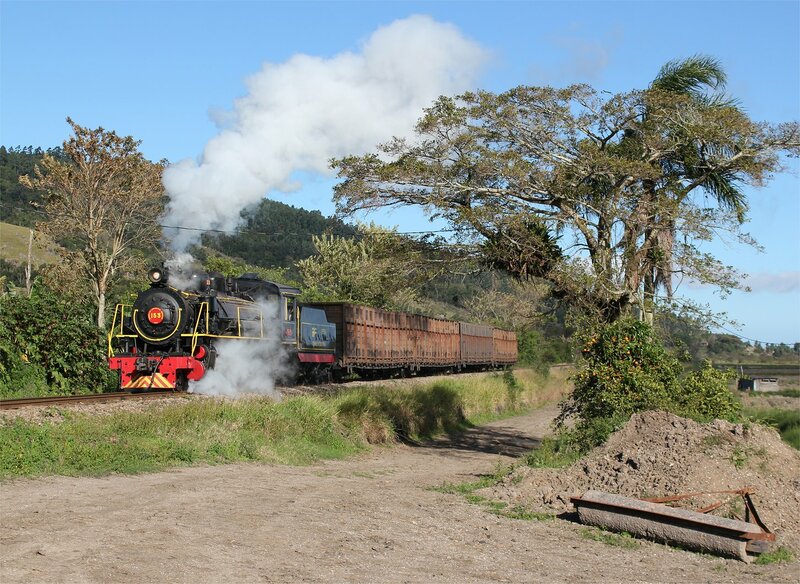 Although this would normally have passed straight through, the railway had kindly arranged to stop the train so that we could drive a short distance to a different spot to get a second photograph. After our diesel interlude we headed back to the museum where we were unsurprised to learn that the coal had not yet arrived. We started to wonder what the next news would be – the driver has lost his keys? lost his licence? Nothing could be ruled out! 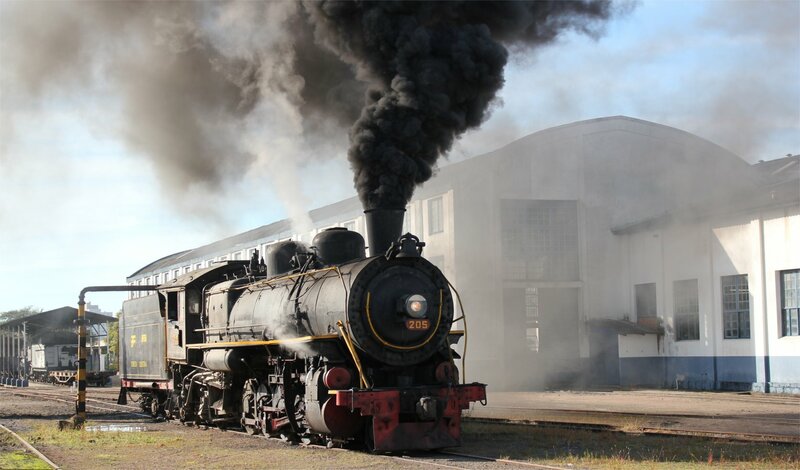 The good news was that the museum was 100% ready for the delivery, having already emptied the tender of the wrong coal. 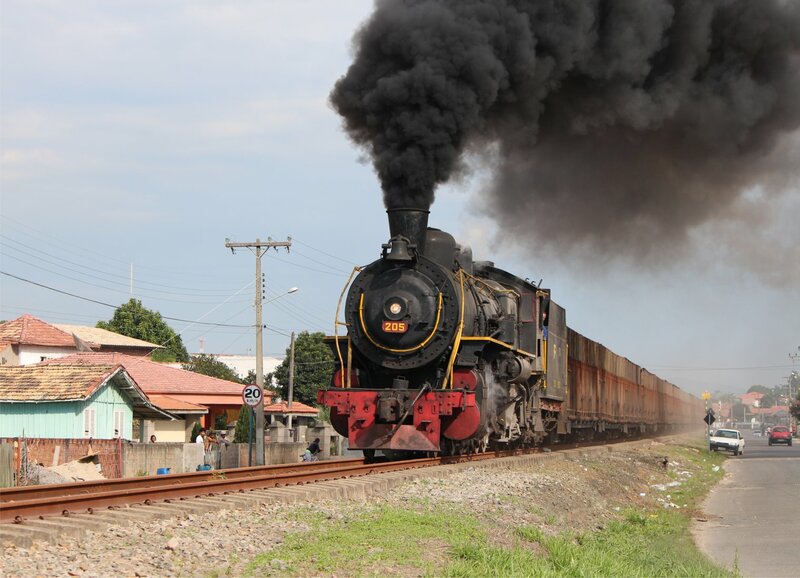 Our loco (Santa Fe no. 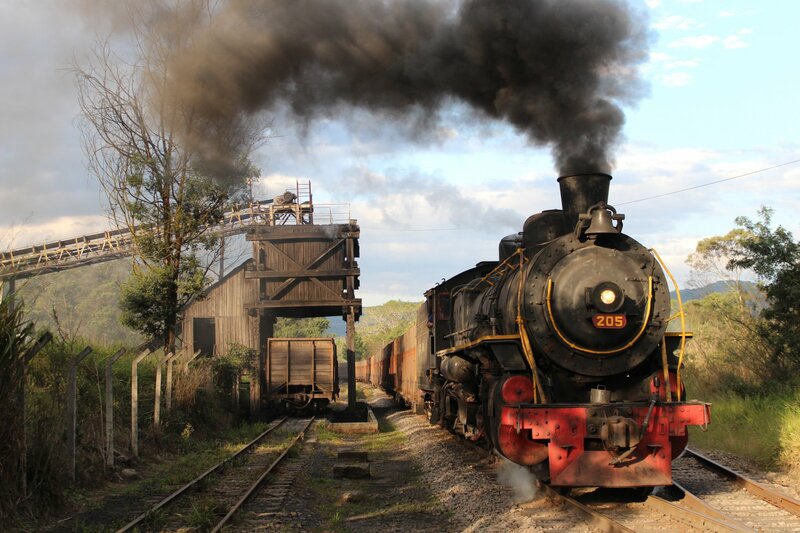 205) was in light steam and a loader was primed to tackle the coal when it arrived. It was just a waiting game now. A long lunch at a local buffet helped to pass the time, though there was still no sign of the delivery when we returned to the museum. 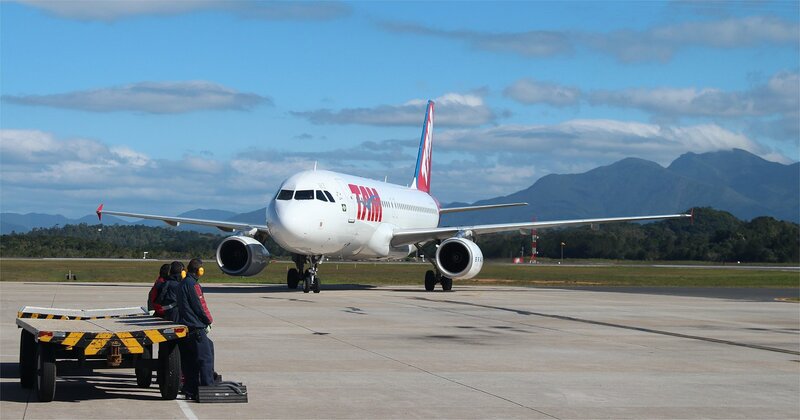 We started to wonder whether the driver was coming all the way from Sao Paulo or some other far flung spot. Finally, the coal truck arrived just after 1.30pm. 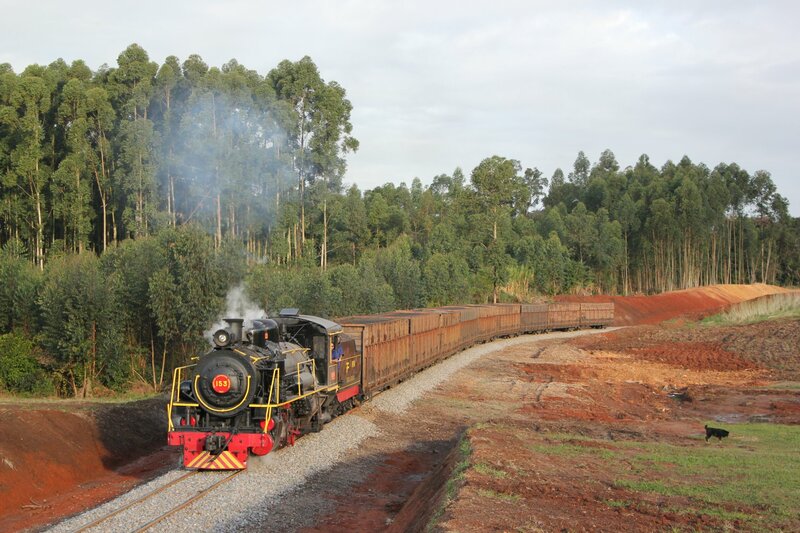 Our day started to unravel around midday, starting with the planned crossing of the two steam locomotives. 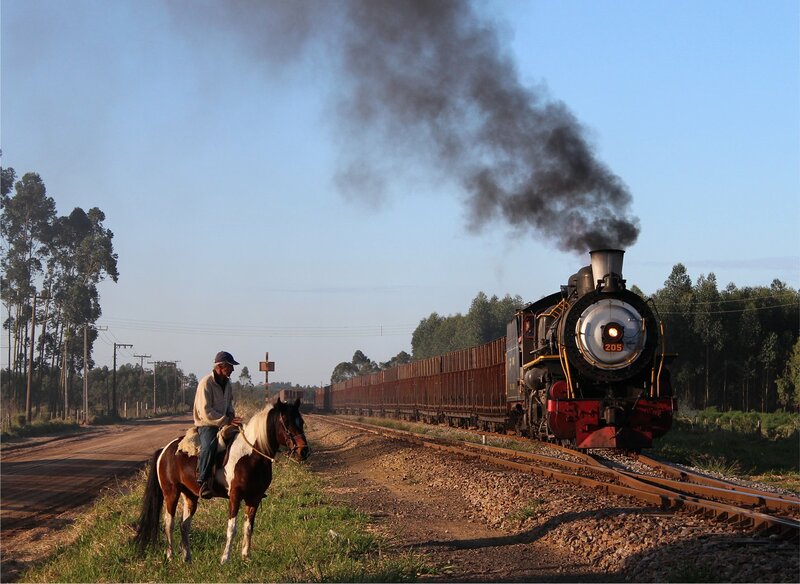 The crew of the second locomotive (Santa Fe no. 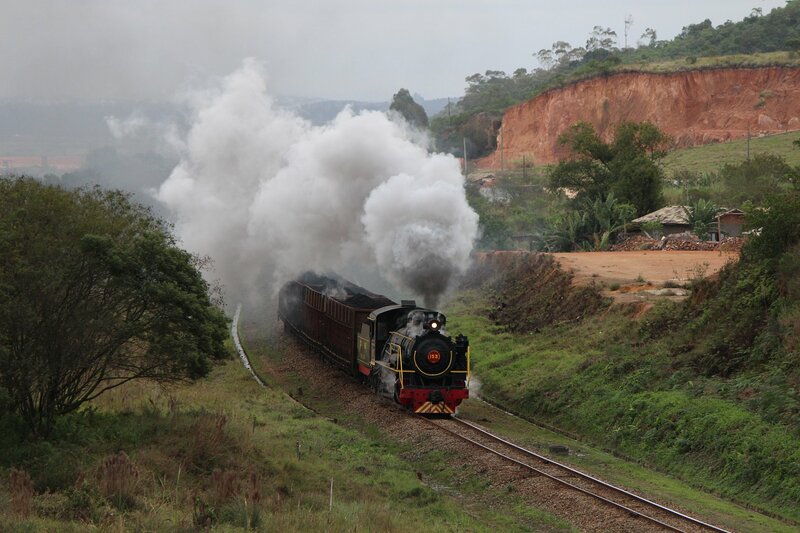 205) had made it from the museum to the junction with the main line but couldn’t go any further. After a while it became clear that they had forgotten the key needed to unlock the points. The only course of action was for someone to bring a key out to them, either by road or on a speeder. After some time a key materialised, but this didn’t appear to be the end of the problems. 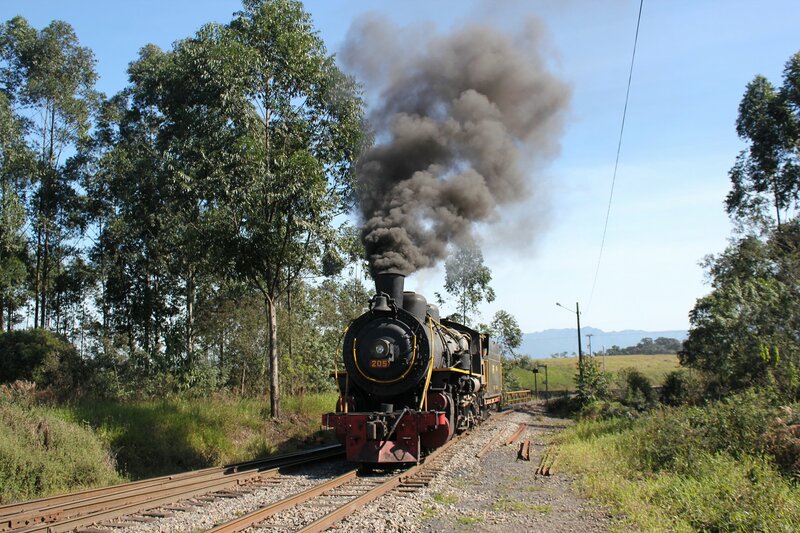 It appeared that the crew were afraid to take the loco out onto the line for fear of blocking it. 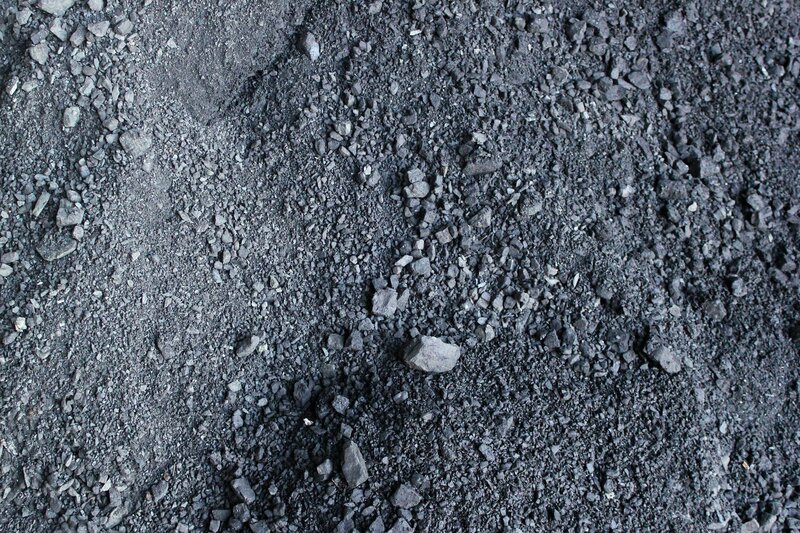 The cause of their concern was the coal they had been given to use. 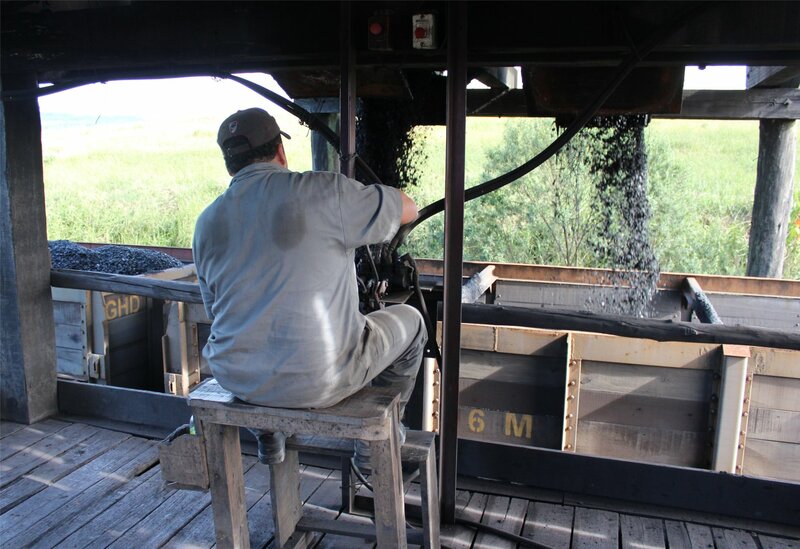 The coal that had been donated to the museum was powerplant grade coal which was not well suited to being fired in a steam locomotive. 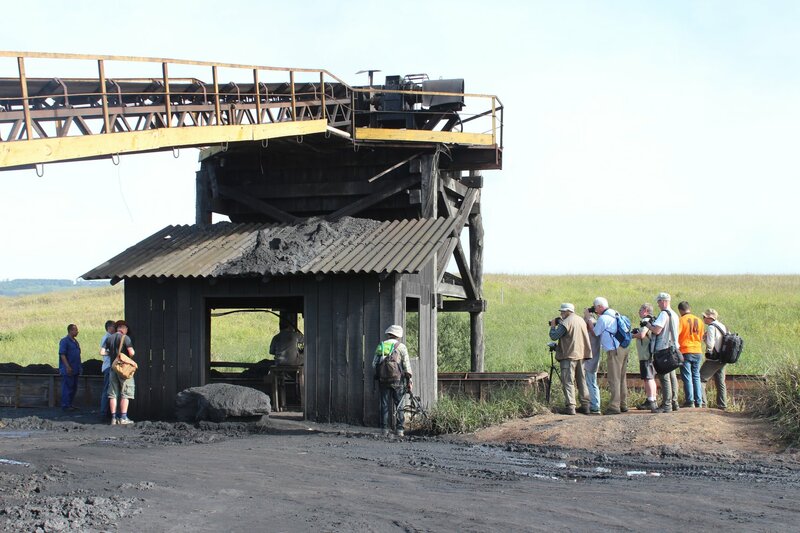 The powerplant grade coal was heavily crushed and just falling through the grate. 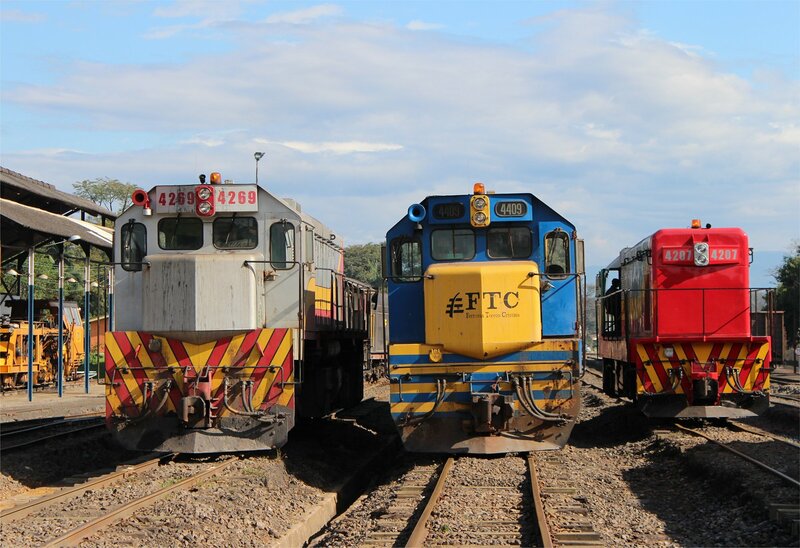 The crew on Alco no. 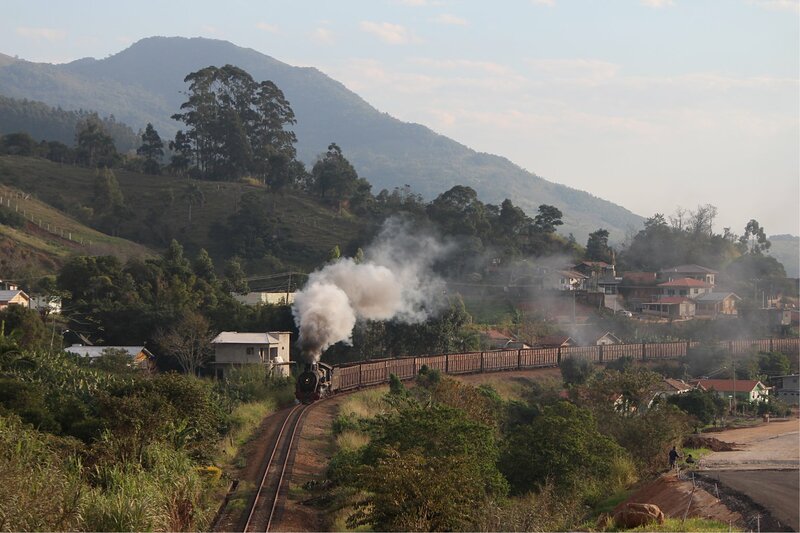 153 (who had been working for 48 hours without a break) had enough experience to get their loco steaming properly with this (although, at times even they too struggled -perhaps explaining the problems we saw with the loco on the gradient earlier today). 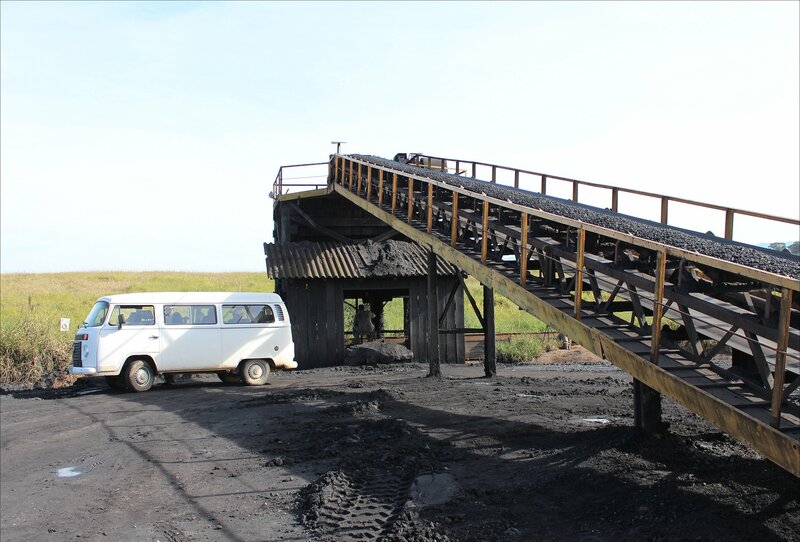 The only option for the days ahead was to buy better coal if we were to stand any chance of making it to the other locations in our itinerary. Meanwhile, the plan for today had to be rewritten. 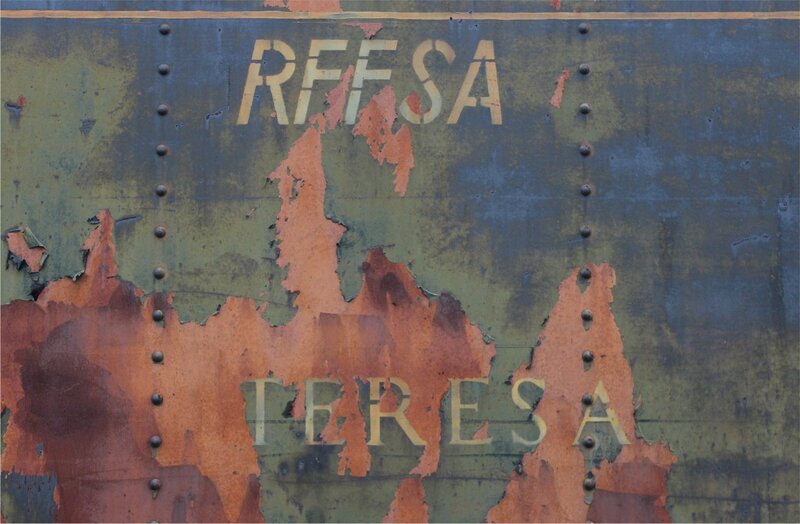 One of the Ferrovia Teresa Cristina’s diesels helped to drag Alco no. 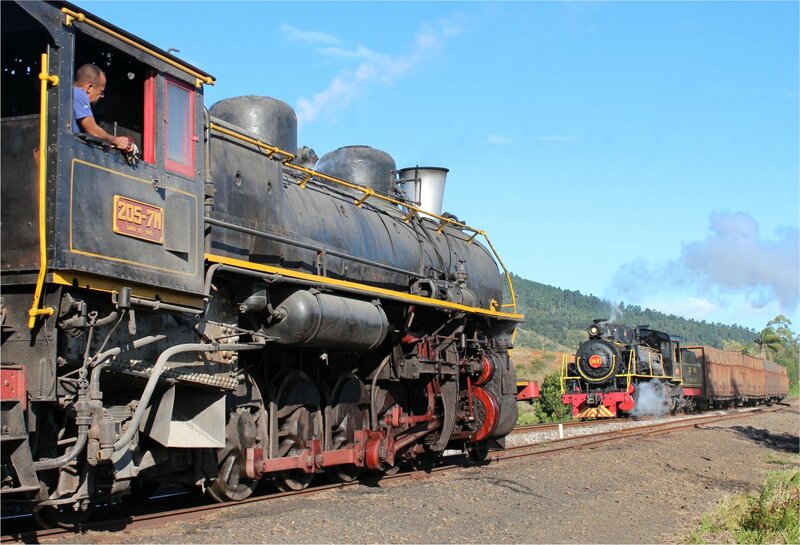 153 back in and then detatched, allowing us to grab a shot of the two locomotives crossing. It was a relief to be able to move on after spending far too long at this spot, slowly going ever more crazy and desperately taking naff shots of abandoned farm machinery! 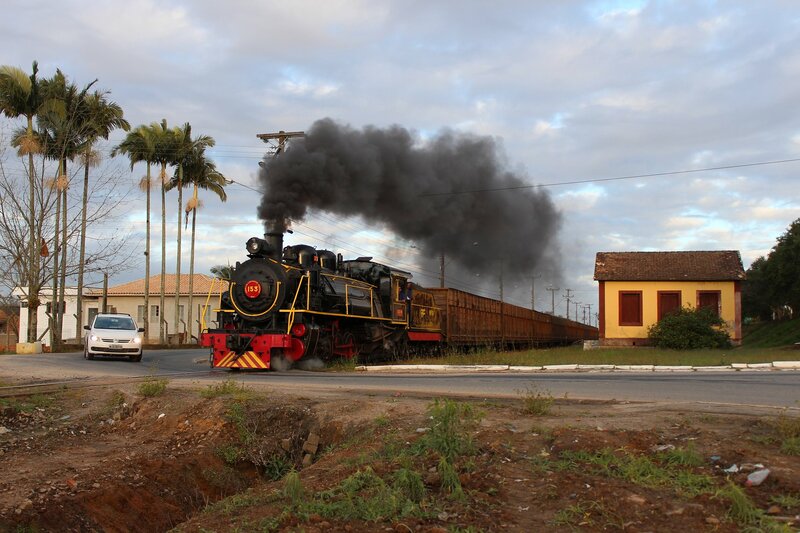 In the little time remaining in the day we headed to the level crossing just outside Tubarão and waited for Santa Fe no. 205 to arrive. First there was a bit of gardening to be done! 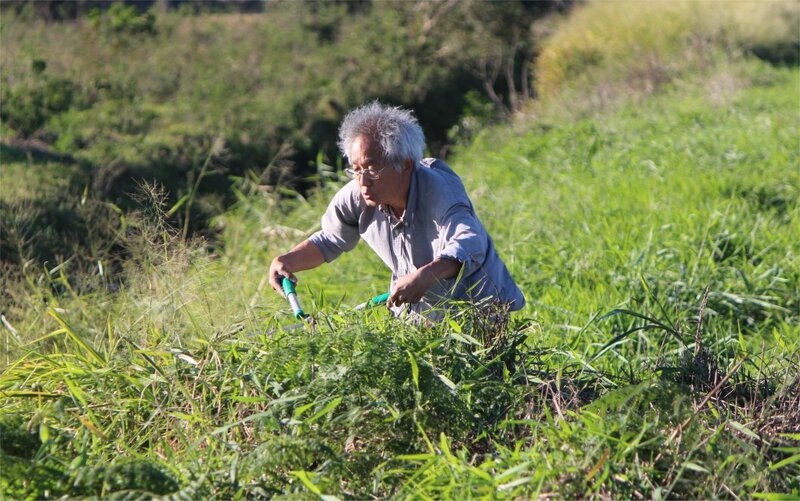 One of the Japanese guys got his shears out and started wildly chopping down the grass stalks that would interfere with his photograph – a wonderful moment of light relief after so much frustration. 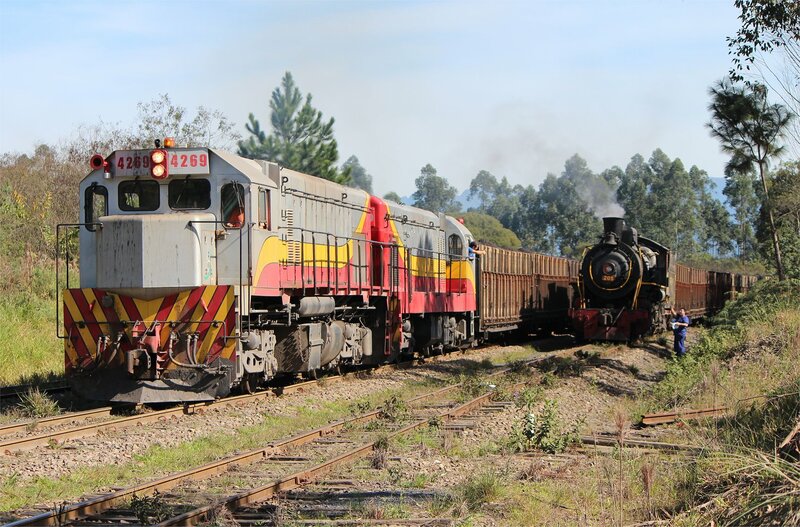 Finally, we watched the beautiful sight of the Santa Fe coming round the curve and bringing her freight cars over the level crossing. It was well worth waiting for this. Yet again it was a moment that snatched victory from the jaws of defeat. 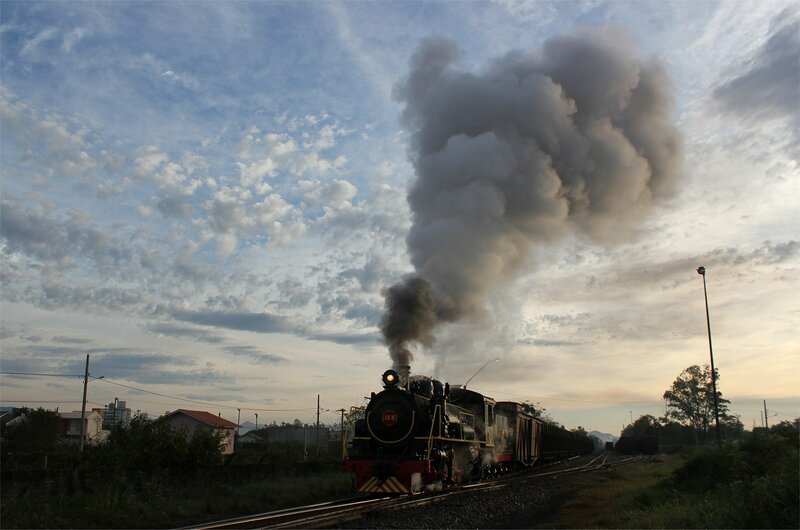 Our day finished at the Capivari bridge with a glorious sunset that glinted perfectly on the locomotive as it crossed. 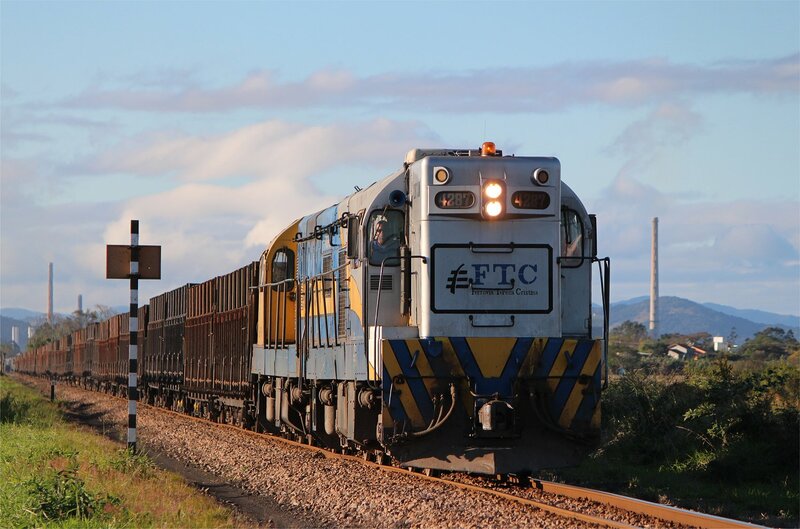 Hopefully the delivery of more suitable coal tomorrow morning will put us in a better position for the remainder of the tour though I think we are all coming to realise that the only certainty is that there will be new problems ahead! The early morning wake-up call was probably the last thing anyone wanted to hear after a late night shoot, but it was just so good to have things finally working smoothly enough that we could start so early. At least we got to sleep in our own beds which is more than could be said for one member of the crew, who stayed with the locomotive all night (in a box car). 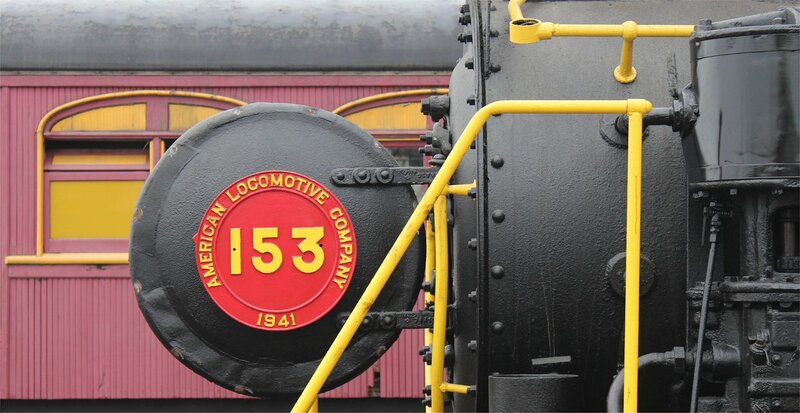 Our locomotive, Alco no. 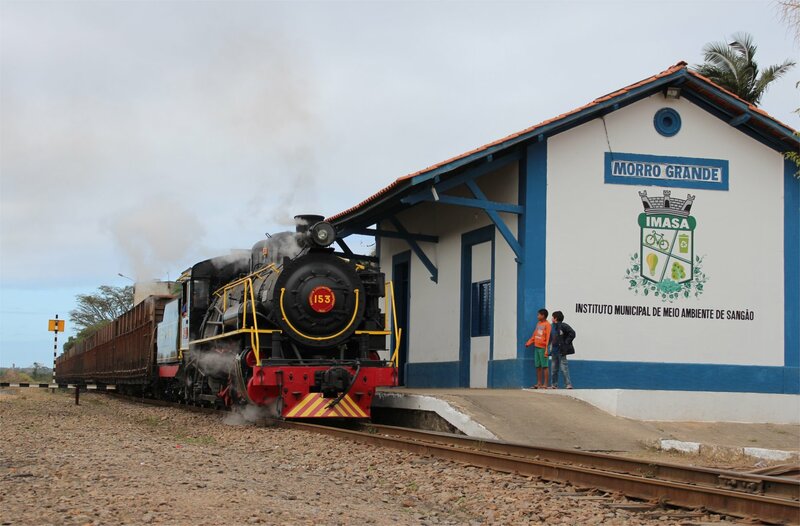 153, had spent the night at Urussanga and the plan was to work this back to Tubarão where it would cross with the second locomotive, Santa Fe no. 205, on its way to Eng. Paz Ferreira. Our day would start with no. 153 and then switch to 205 when they crossed. 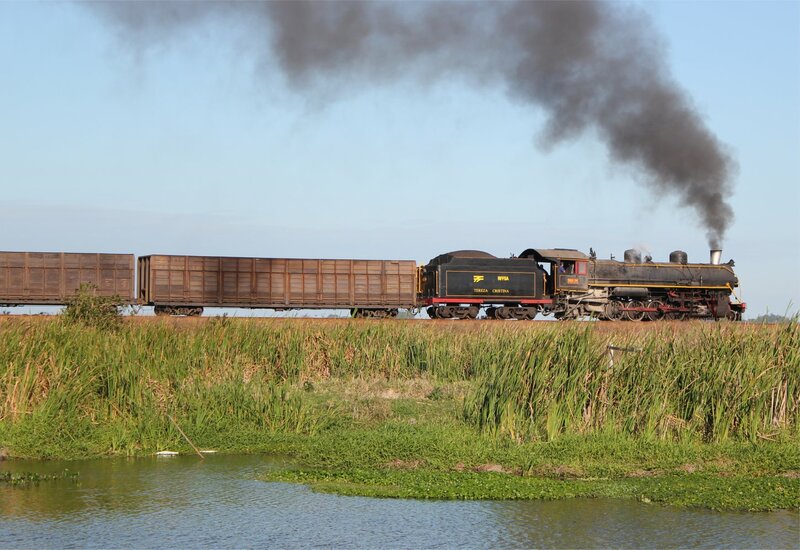 The picture we shot at Urassanga with the wooden coal loading facility and a Volkswagen beetle stopped at the crossing could so easily have been a moment in the 1980s when steam was in everyday use here. 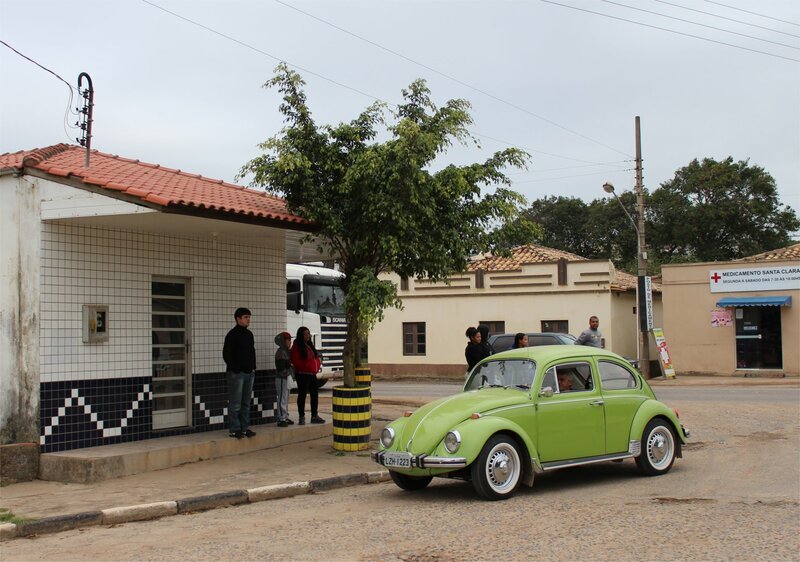 In reality, the owner of a VW beetle had been persuaded to join us for a staged scene with the car carefully parked in the optimum position for photographs. The owner assumed this was enough but who abandons a car at a level crossing!? No, we needed a driver… the owner laughed, got back in the car and then showed that he too could add his own touch of authenticity by pointing out that he would put his seatbelt on too! 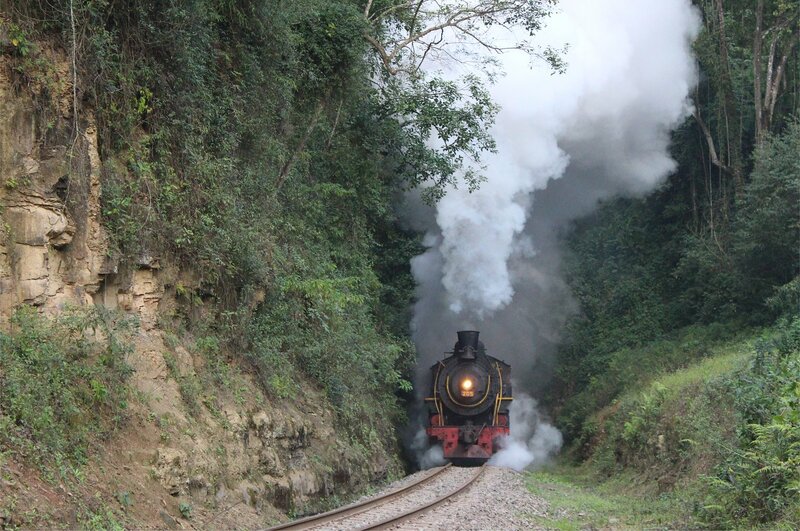 After the eccentricities of the staged scene at Urussanga we followed our train back down the line, taking shots at a cutting en route to Esplanada and on a fairly uninspiring spot where the road runs parallel to the track (though this did allow me to grab a shot of our VW minibus with the loco passing by). The final shot of the morning came at a gradient near Morro Grande which provided a great view of 153 approaching from a long way out, although we had to wait a while on the hillside to witness that. The delay suggested that things were not quite as perfect as we had thought, though none of us could understand exactly what the nature of the problem was. I hoped that it was another small but ultimately insignificant problem. 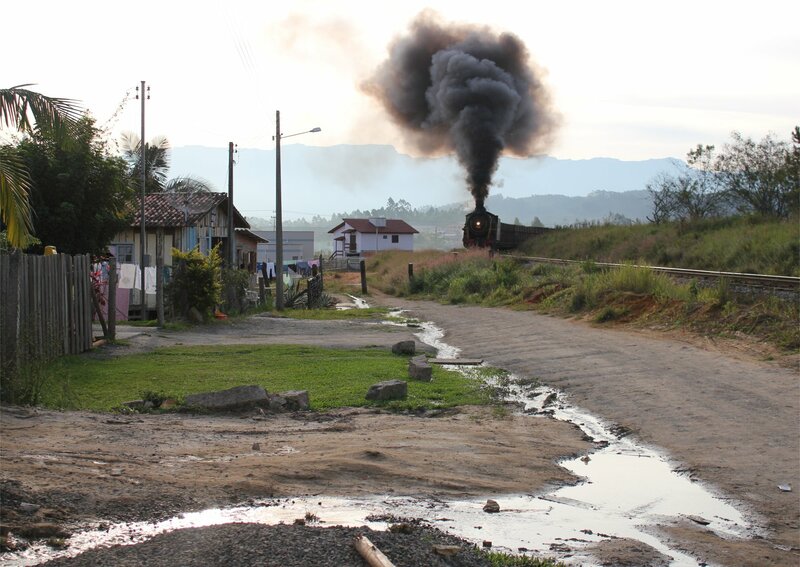 After a stuttering start to our tour, things started to fall into place today with an attempt to make it to Urussanga, albeit 48 hours later than originally scheduled. 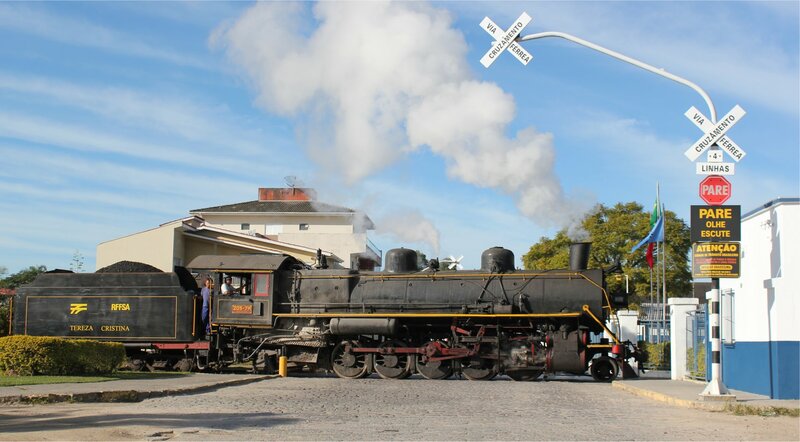 Our convoy of four VW minibuses rolled out of the hotel car park on time at 7.35am and in another part of town our steam locomotive (no. 153) was starting her journey. 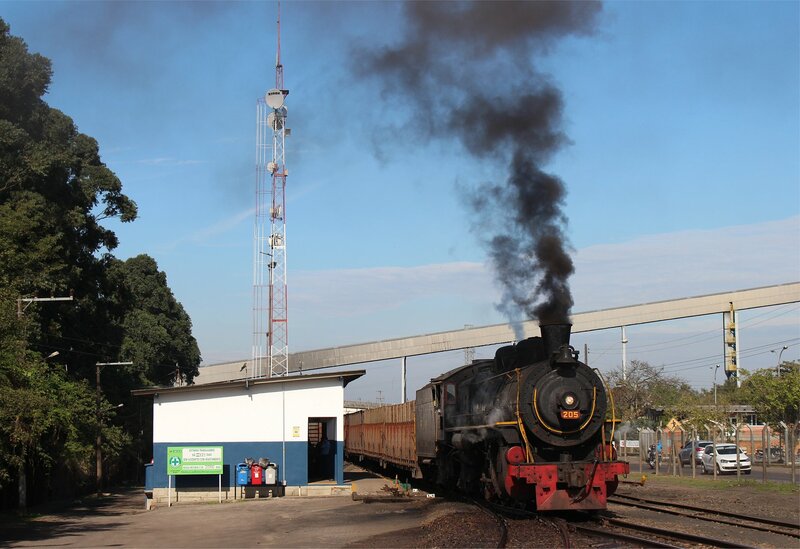 Our paths met at a level crossing before the Congonhas bridge where we handed over the radios that would be our vital line of communication with the steam crews during the day. 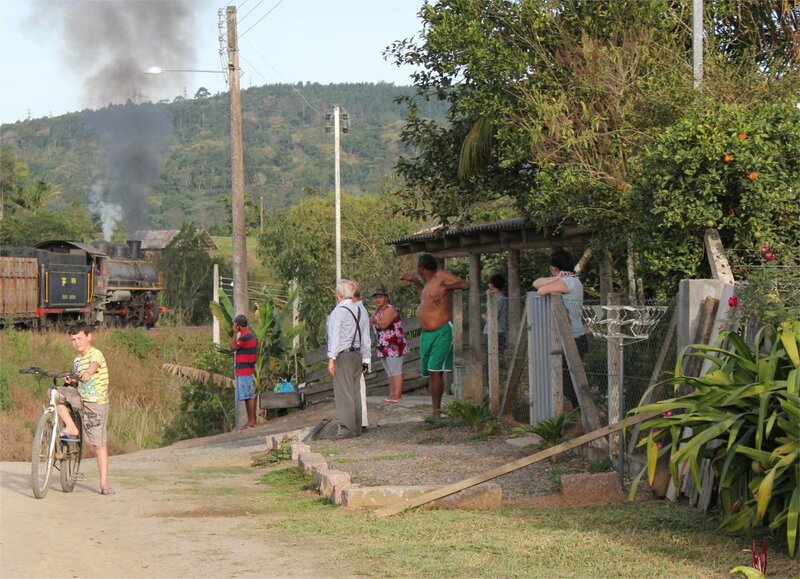 After a few shots on the stretches of line around here, including the Congonhas Bridge itself, our convoy set off in pursuit along the dusty local road, looking for all the world like some latter day re-make of ‘The Italian Job’ and attracting much attention wherever we went. 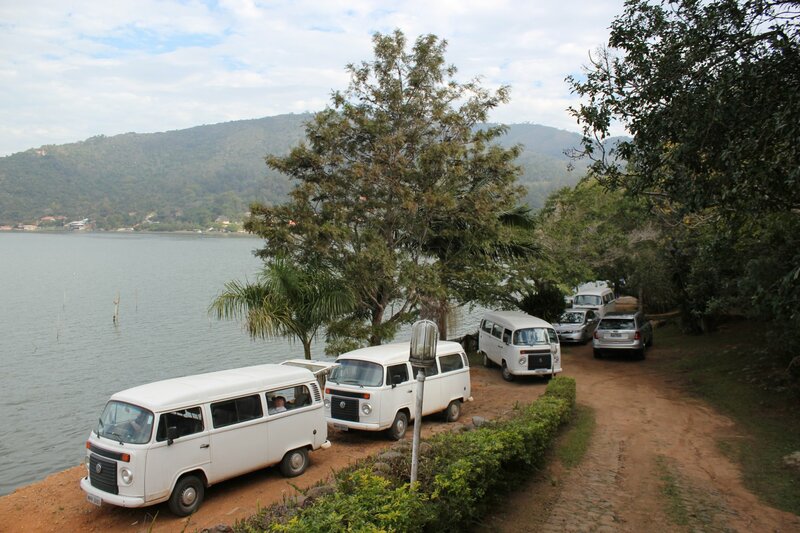 One local said that he had never seen four VW Kombis at one time! 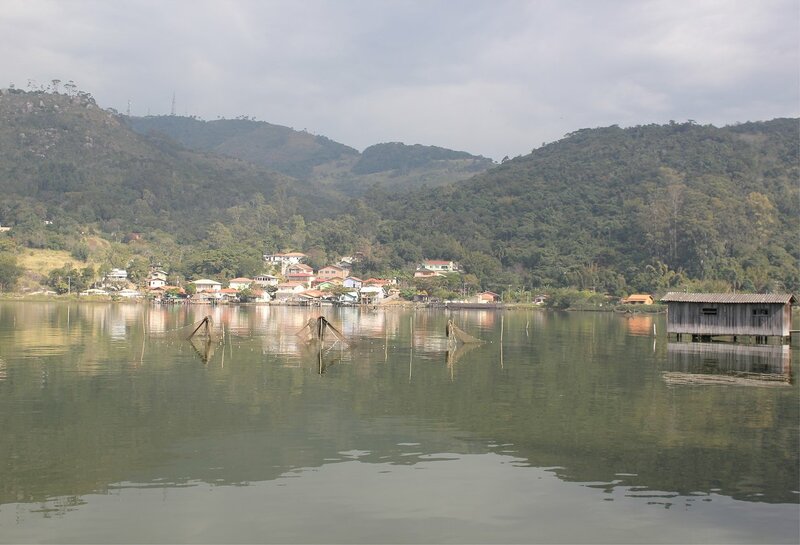 Our lunchtime stop gave us an opportunity to wander round the streets of Jaguaruna, a town of around 15,000 inhabitants set in a fertile landscape of lakes, lagoons and green fields. 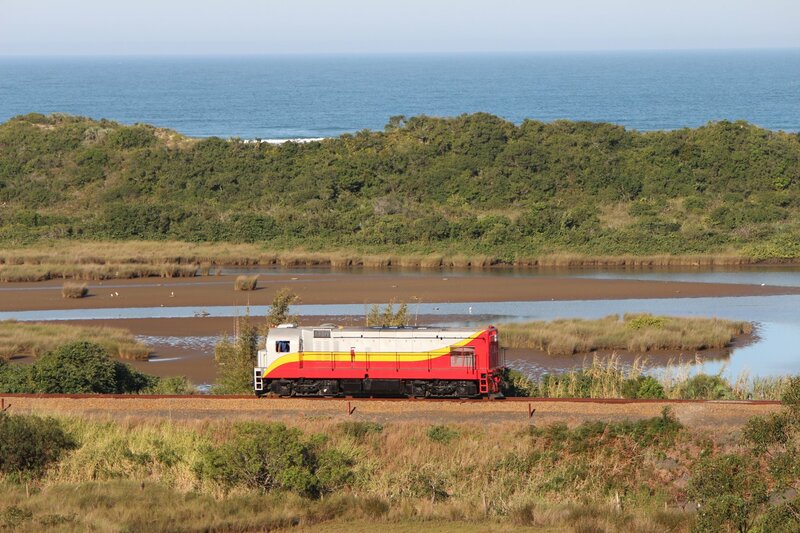 However, it is the proximity of the town to the atlantic ocean that draws most tourists to the area, with 18 vast beaches along a 37km stretch of coastline and an active surfing scene. Alongside this, the area has some vast sand dunes which are a popular destination for sandboarders. 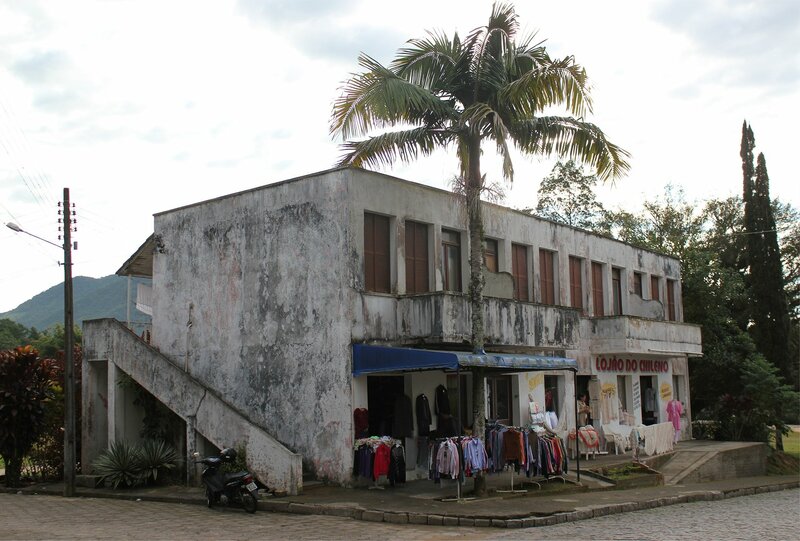 The town itself has an incredible variety of small shops with not a chain store in sight, selling everything from wool to surfing gear (at least two surf shops can be found on Rua Duque de Caxias). The local car dealership was, rather wonderfully, selling Jaguars. 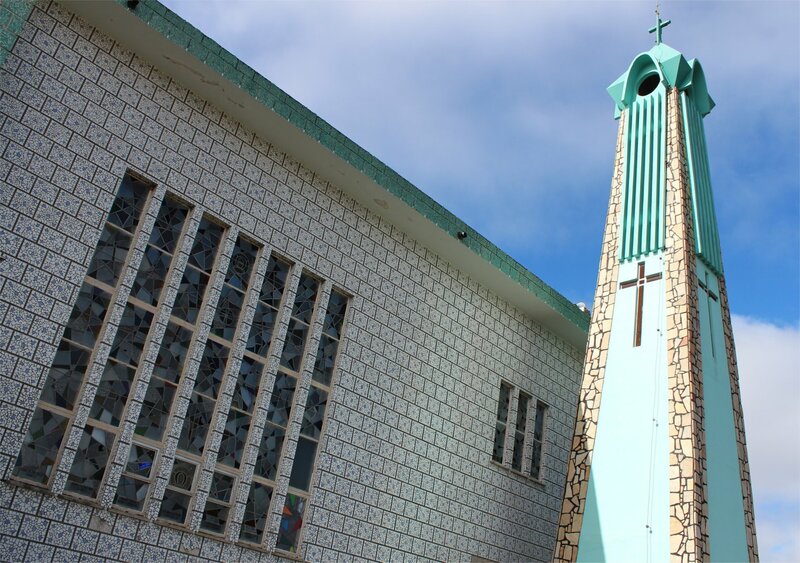 Sights in the town include the striking church and tower of Nossa Senhora das Dores (our lady of sorrows) which was constructed in 1968, the old railway station (now a tourist information office) and the modest Museu Cidade de Jaguaruna which had an unexpectedly busy day with foreign visitors. 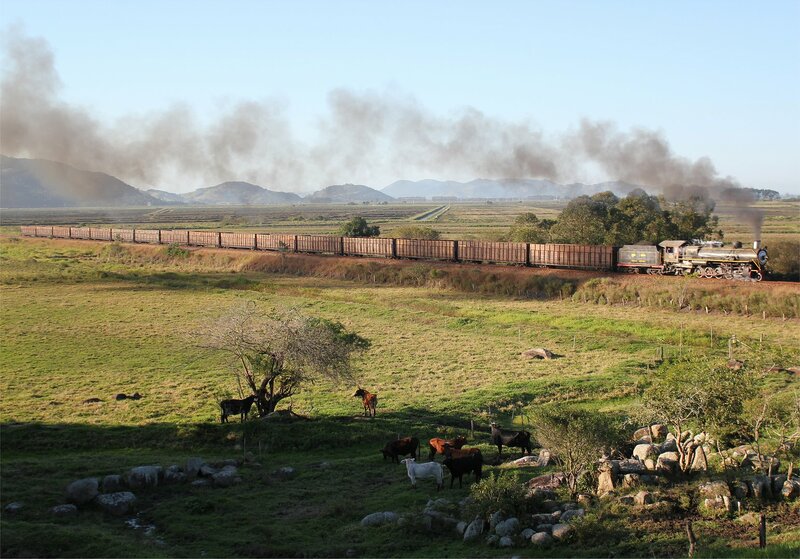 Our chase resumed in early afternoon as we headed out on the road to Morro Grande. A short drive brought us to the spot where 153 failed two days back, but today a different story was being written. 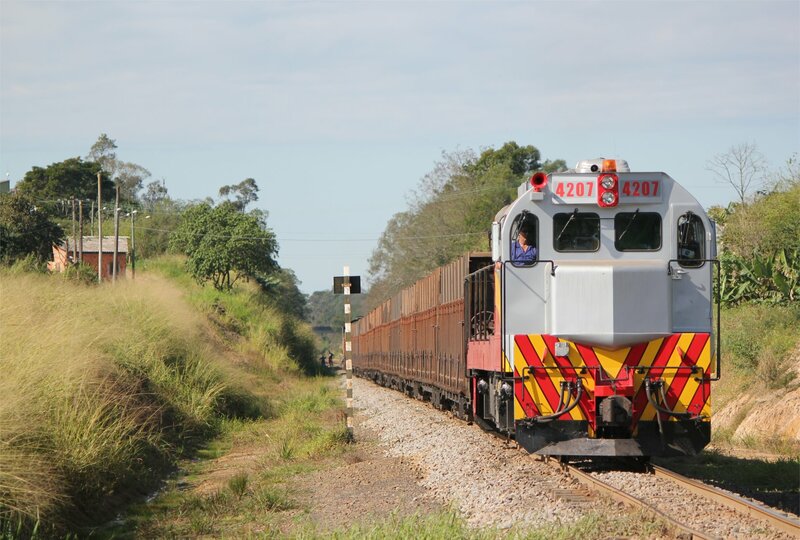 We photographed the departure of our train and then hurtled along the road to a busy road bridge which afforded a great view over the line (the picture comprising a work gang repairing a small railway bridge, a couple of houses and a concrete water tower). Alco no. 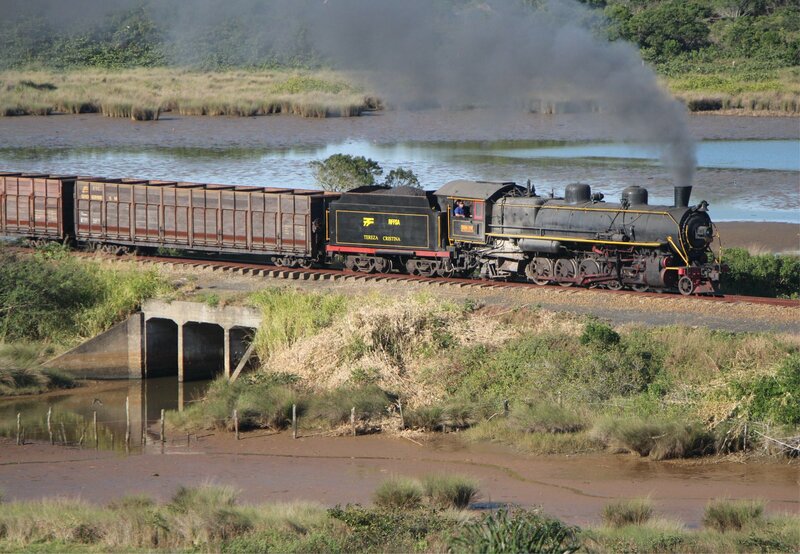 153 looked quite magnificent as she passed, though not at full steam on account of a speed restriction placed on the bridge while it was under repair. 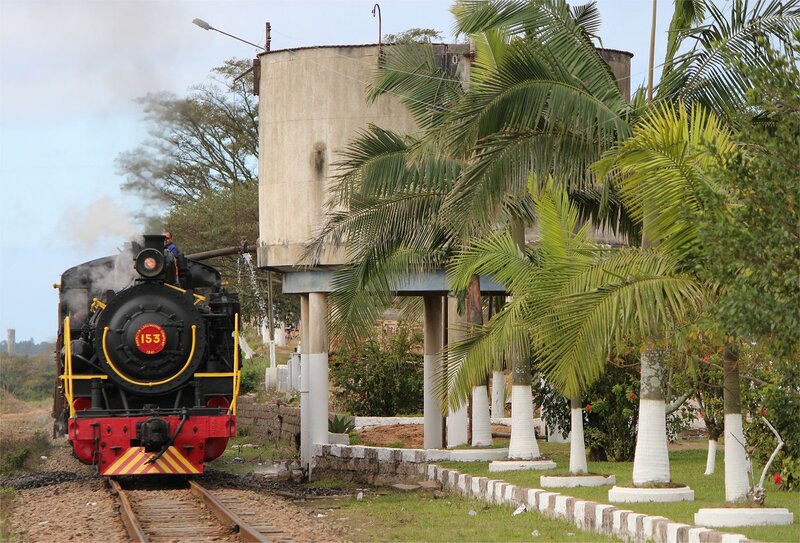 At Morro Grande the loco took water and attracted a large crowd of fascinated locals who soon became sought after additions to our photographic compositions. A similar story unfolded at our next stop, Esplanada, where a local VW Beetle driver was persuaded to re-park his car in a suitably visible position to add to the local colour for a runpast! 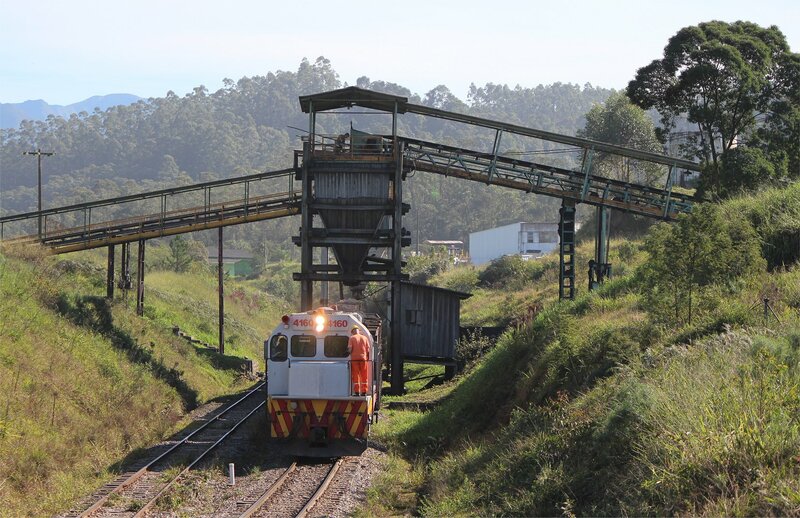 Our luck had held for such a long way, but here we learnt that the line to our intended destination, Urussanga, had just been blocked after a diesel had collided with a car at a level crossing! No-one could believe that we had come so far only to face falling short yet again. Thankfully, this proved to be less of an obstacle than it first sounded and we were able to set off again at about 3.30pm. 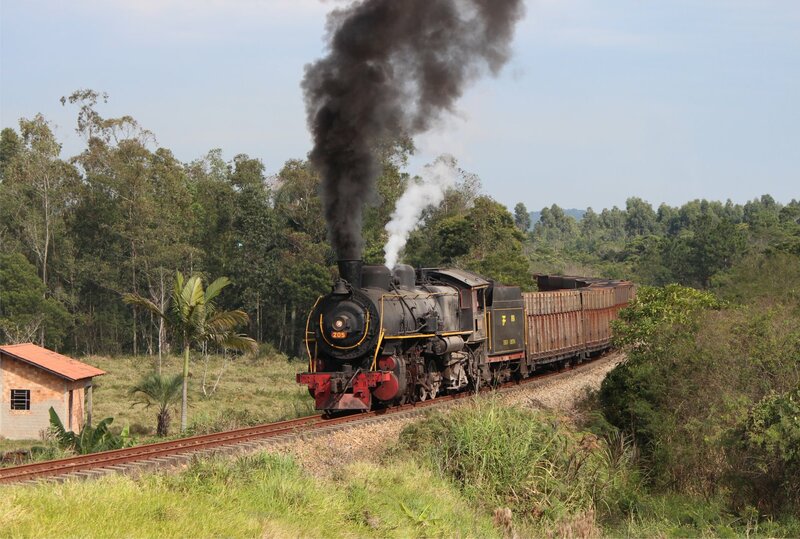 The next stop was a cutting not too far out from Urussanga where we settled down to wait for the sun to make an appearance and prayed that our locomotive would be able to set off when conditions were perfect. Thankfully this all went to plan. I figured that we were due a bit of good luck! 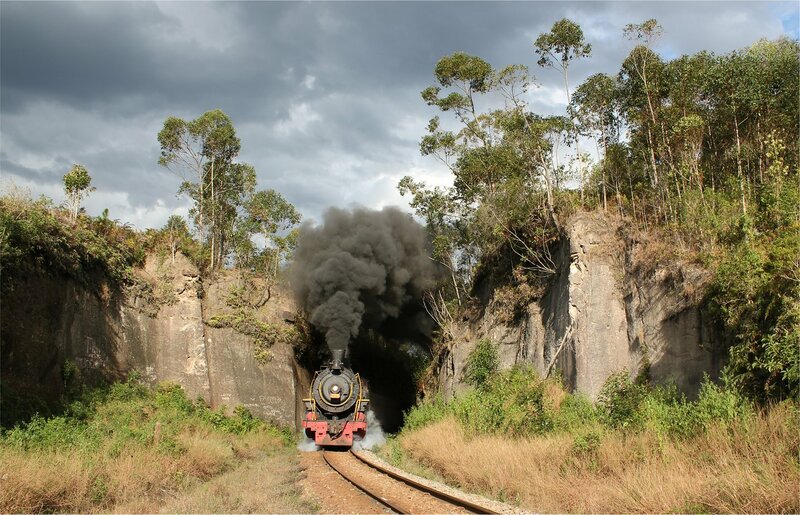 From this point on our train would not be able to stop until it reached Urussanga, but some speedy driving ensured that we were able to take a few more shots – each stop followed by a quick dash back to the minibuses and some speedy driving to overtake the train on the parallel road before repeating the process. 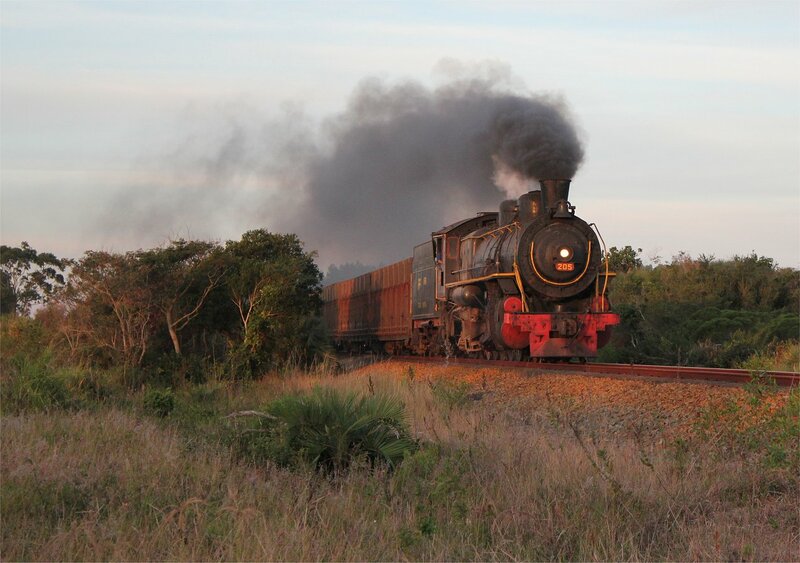 The glow of the last light of the day was quite special, particularly as Alco no. 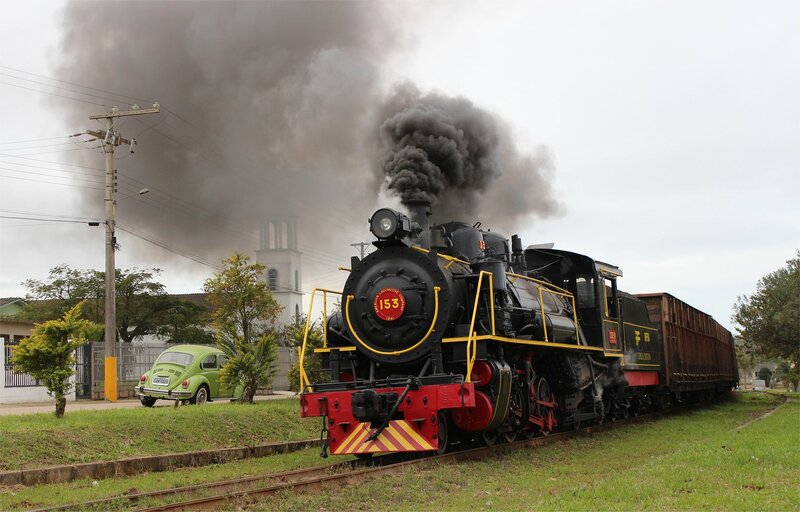 153 steamed through Morro da Fumaça. Finally, we made it to Urussanga as the sun set. 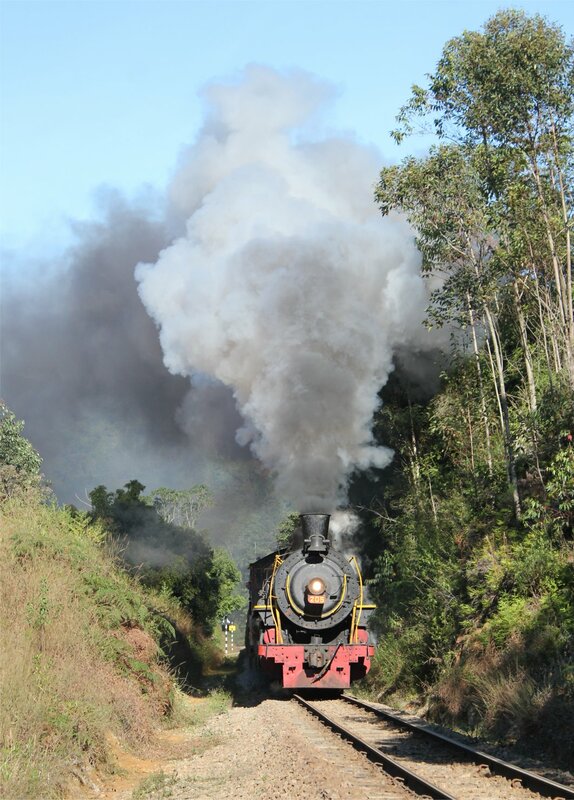 This was by no means the end of the day, merely the signal for a pause – we headed off to a local restaurant whilst the crew were scheduled to turn the loco at Esplanada. Naturally, nothing about this trip could ever be straightforward. 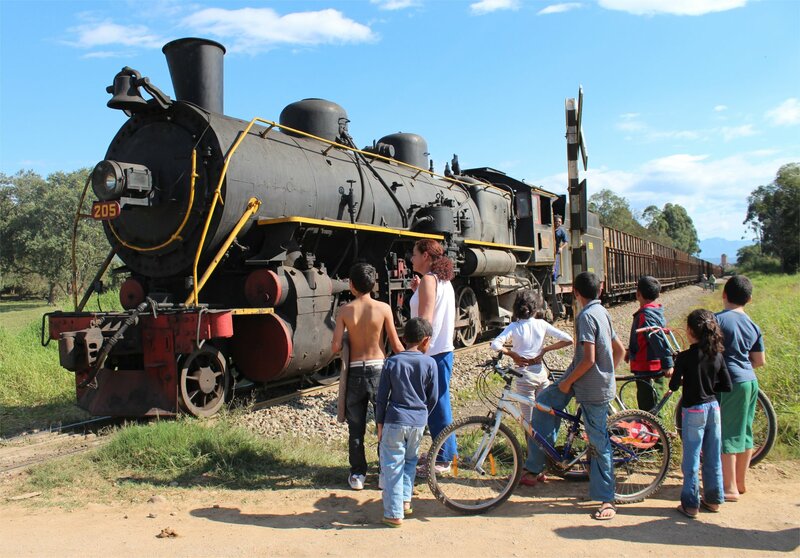 The locomotive’s light had failed and this had to be fixed before they could set off, delaying proceedings a little whilst they waited for the repair team to arrive by road. 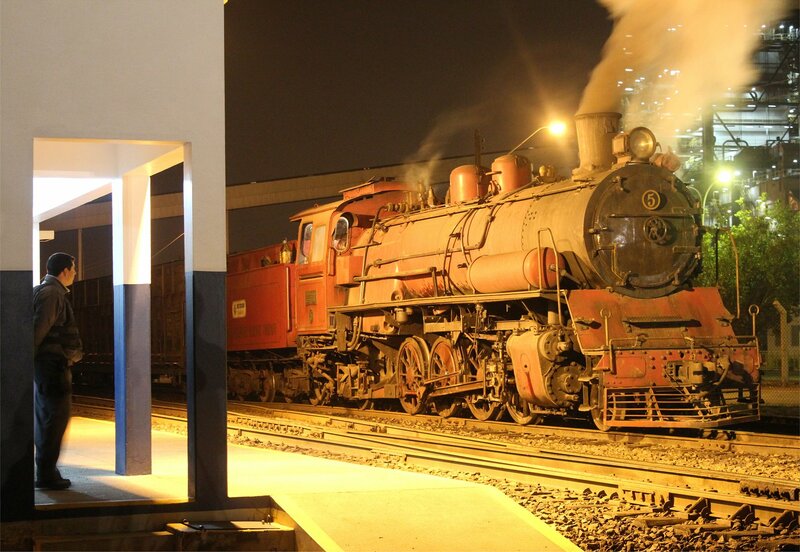 It wasn’t until 9.45pm that the locomotive returned (after yet another problem on the way back). 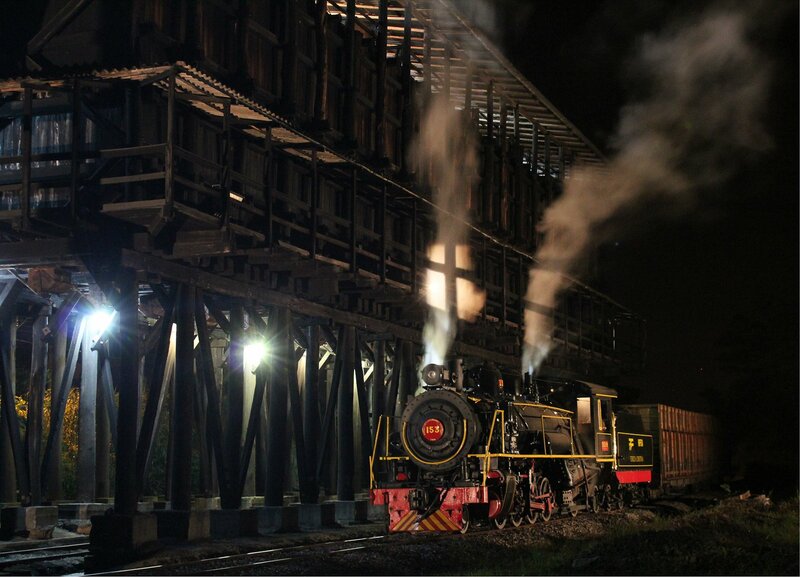 It took about forty-five minutes for all the lighting to be rigged up for our night shoot and even then the loco ended up on the wrong track. Finally everything was in the right position and I must admit that the wooden loading facility did make a stunning backdrop. 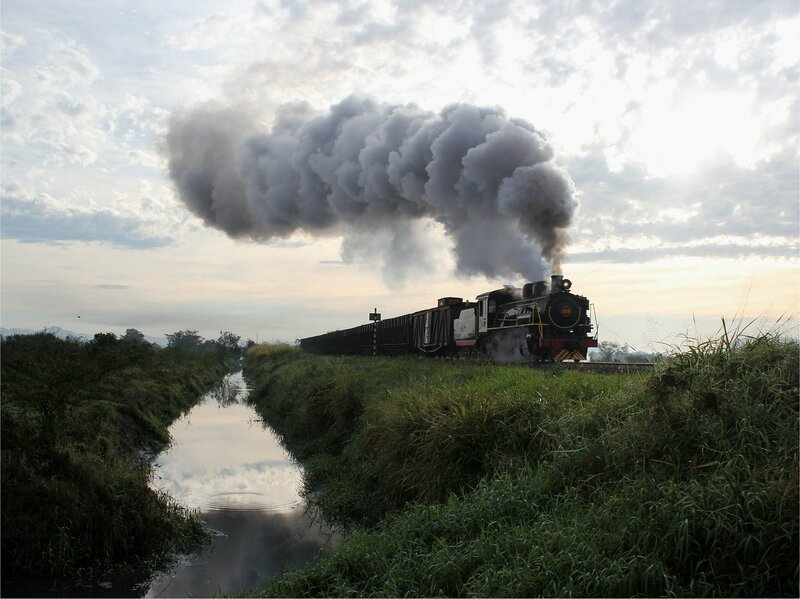 The final scene with the locomotive passing undermeath to be loaded with coal was incredibly atmospheric. It has to be said that the crew, the museum’s repair team and the specially arranged night shift deserved medals for their patience and co-operation in all of this madness! The sight of the red liveried 2-8-2 Jung in steam much sooner than expected was a welcome surprise when we returned to the museum. 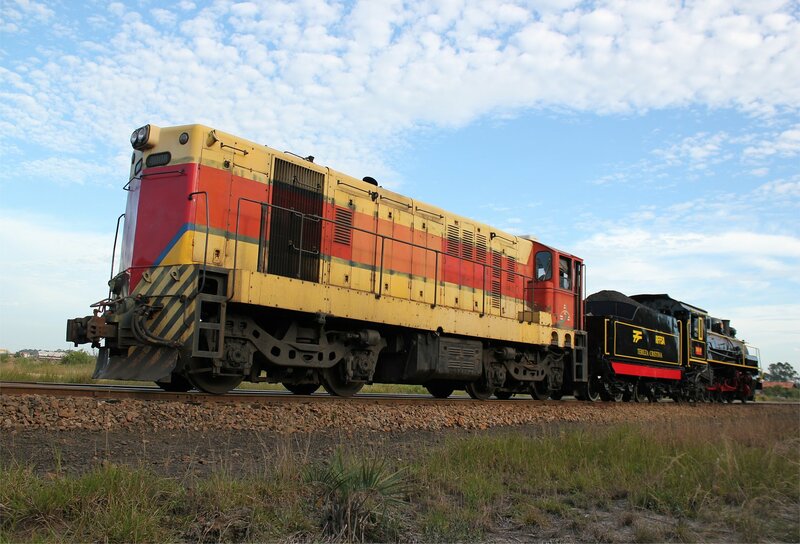 It wasn’t too long before the loco was surprising the locals too, as it made its way over the level crossing that separates the museum from the yard of the modern railway. Although there were only a couple of hour of light left in the day it was still a pleasure to watch as Plan C came together. 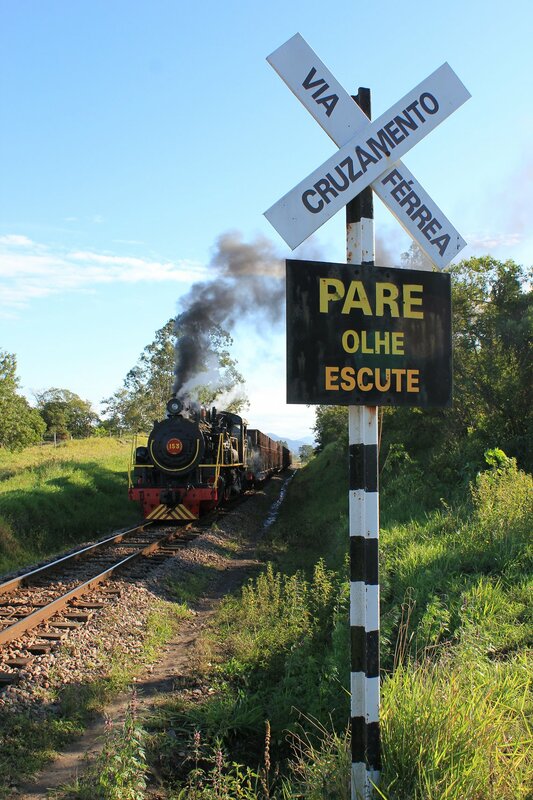 A short drive brought us to a level crossing just outside town where we watched the loco pass, hauling our wagons towards our next stop, the Tubarão river bridge. 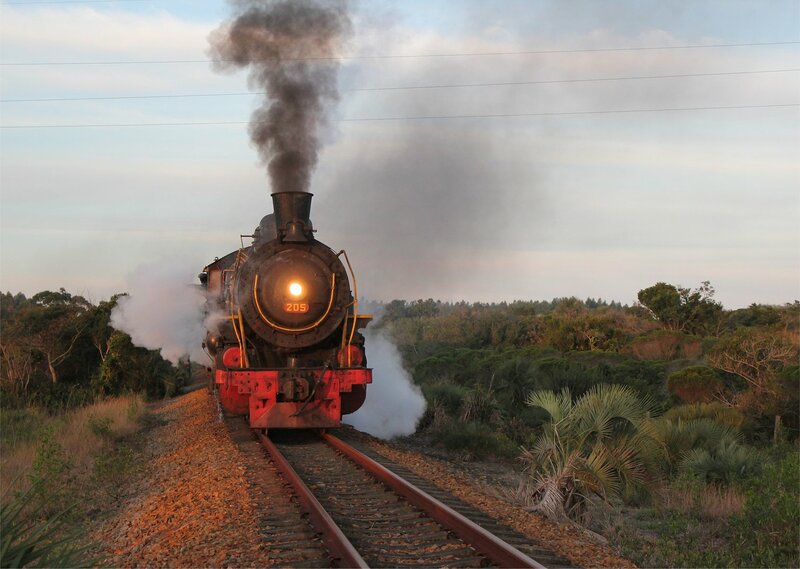 Finally, the loco made it to familiar territory in the shadow of Capivari power station with the light now fading fast. 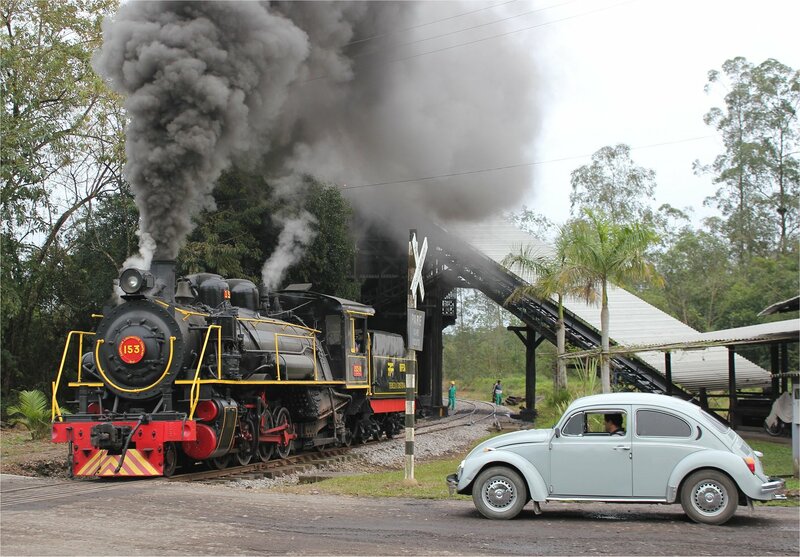 The security guard at the station seemed somewhat bemused by this unexpected train – let alone four identical Volkswagen minibuses packed full of foreign tourists! As night fell we improvised some extra lighting using the headlights of two of our Volkswagen Kombis which worked surprisingly well, though it must have looked a strange sight to the locals. 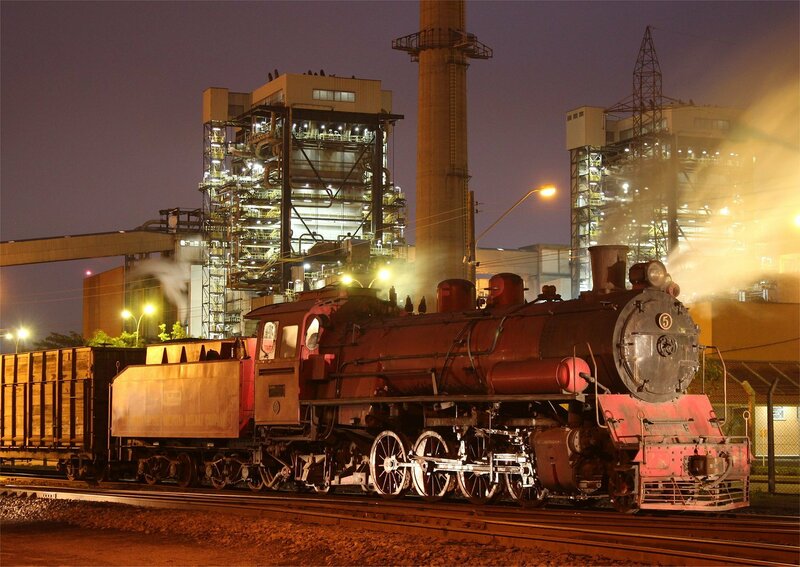 The location for our unexpected night shoot was highly appropriate as this locomotive spent its life shunting at Capivari coal washery, rather than out on the line. 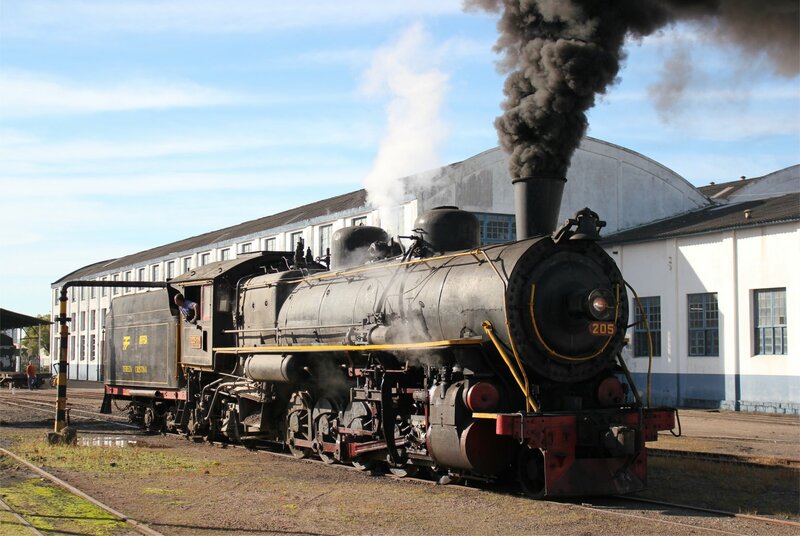 The Companhia Siderurgica Nacional owned a pair of 2-8-2 two cylinder superheated locos that it had acquired from Jung, both of which had been constructed in 1954 (works numbers 11943 and 11944). Both have survived into preservation, with no. 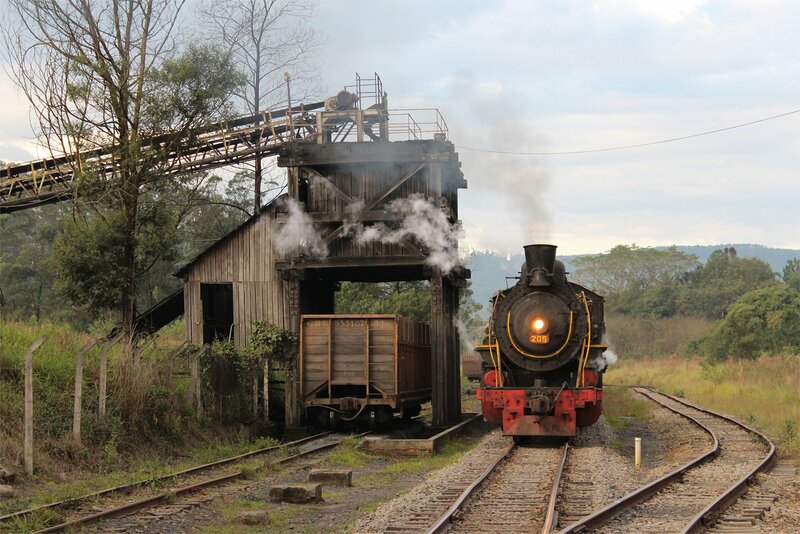 4 (11943) still in working order at Bento Gonçalves, Rio Grande do Sul, Brazil. The night shoot was good fun and rescued a day that seemed destined for defeat, even to the optimists amongst us! I hope that it augurs well for tomorrow, but I have given up predicting anything here. The sight of our tour guide in flip-flops told us all we needed to know about our prospects for the morning… though it really was no great surprise to any of us. 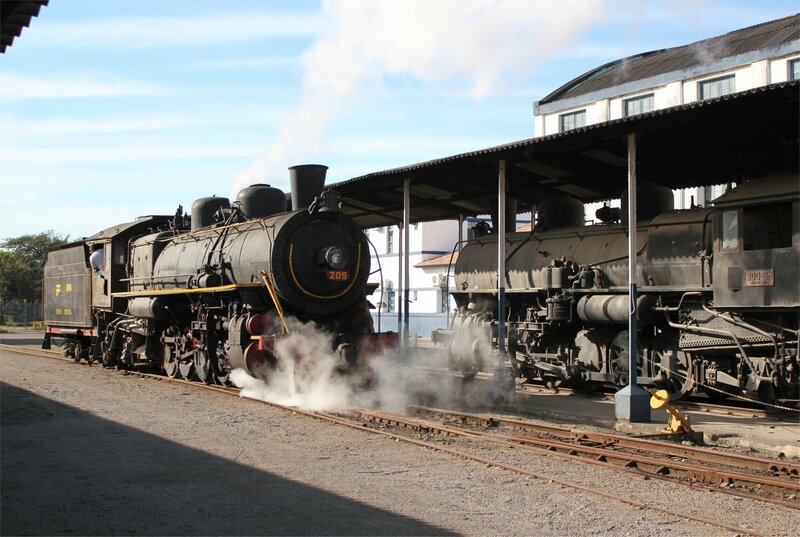 Even the most optimistic souls amongst us had struggled with the idea that either of our two locomotives would be ready today. 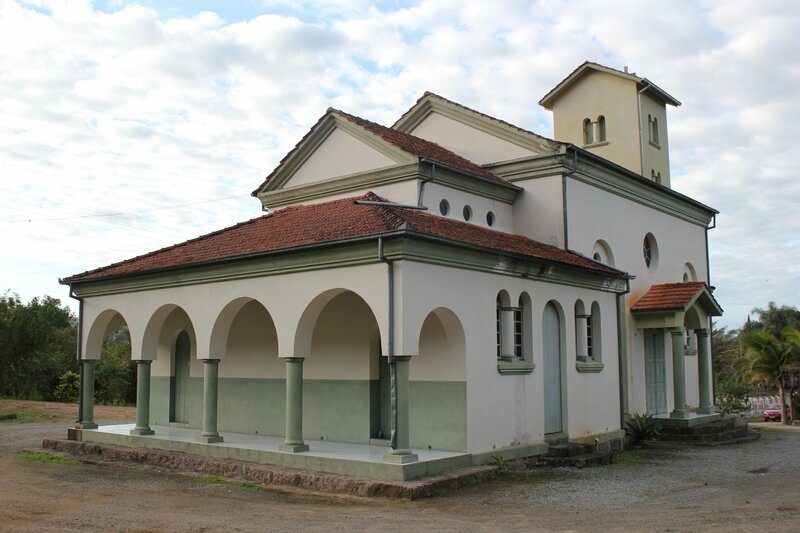 In the absence of a plan for the morning I headed off for a walk around our hotel at Termas da Guarda, five miles north-west of Tubarão. 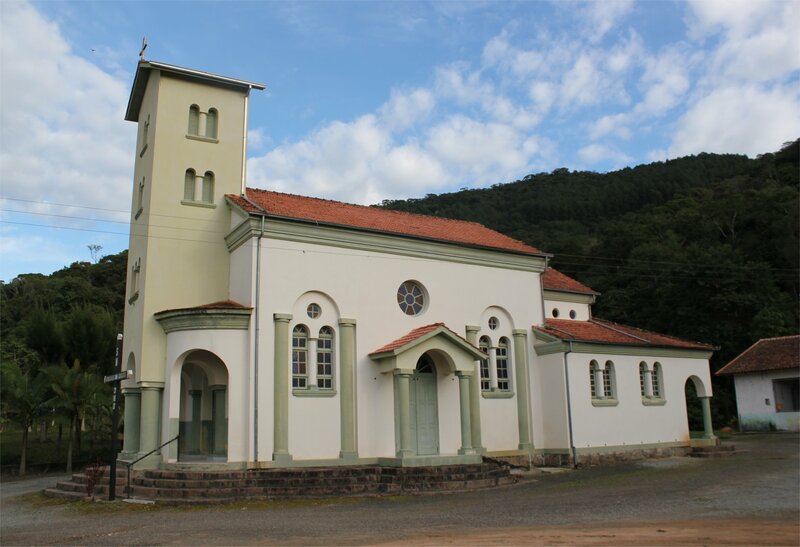 The village includes a church, school and three small clothes shops centred around a green public park. It would be hard to put a date on any of this but some historic photographs in the hotel suggest that many of the buildings (including the hotel) date to the early twentieth century. It certainly felt fairly timeless, with just the occasional satellite dish to remind you of the 21st century world. 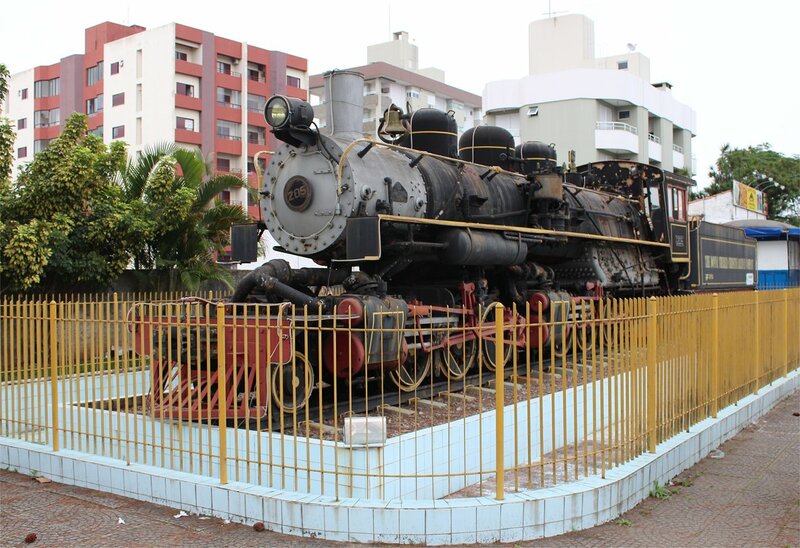 Around midday we headed in to town to take a look at a plinthed loco (a 2-6-6-2 Baldwin constructed in 1948) and the Museu Ferroviaro de Tubarão, home to an impressive collection of locomotives from the Ferrovia Dona Teresa Cristina. 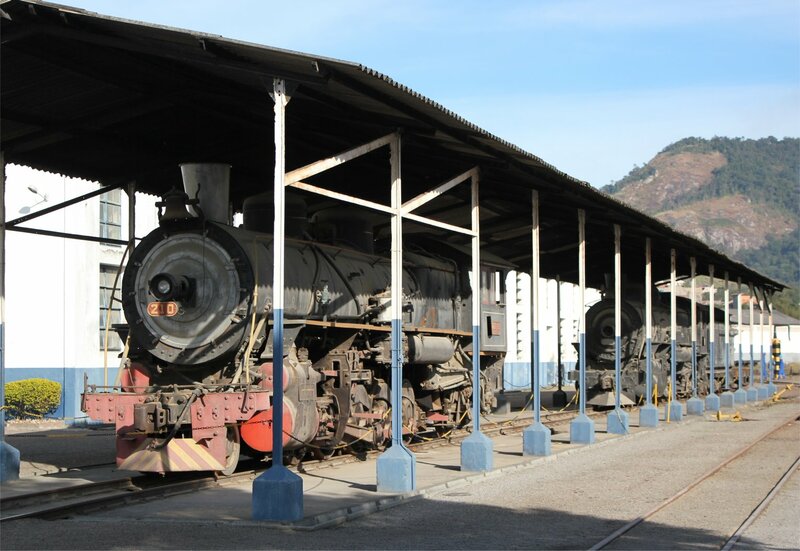 In stark contrast, the yard opposite contains a line of dumped steam locomotives that make a particularly sad sight with vegetation growing unchallenged through their rusting panels. 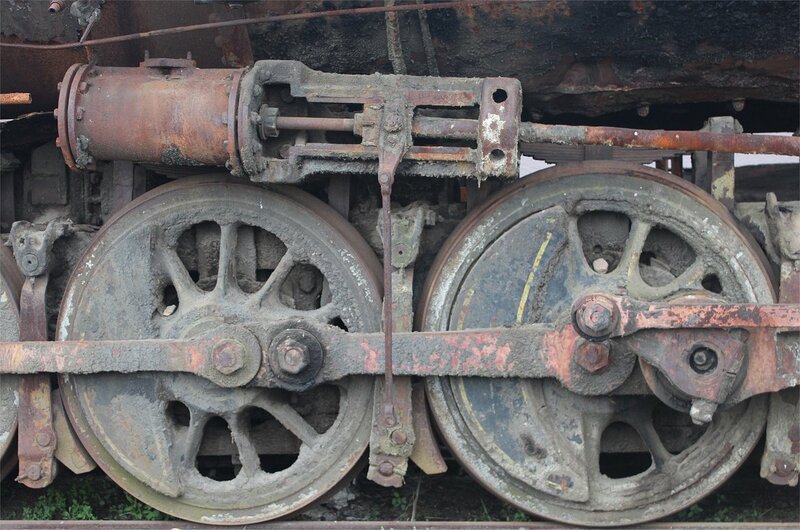 On our visit to the museum workshops it was quite clear that Alco no. 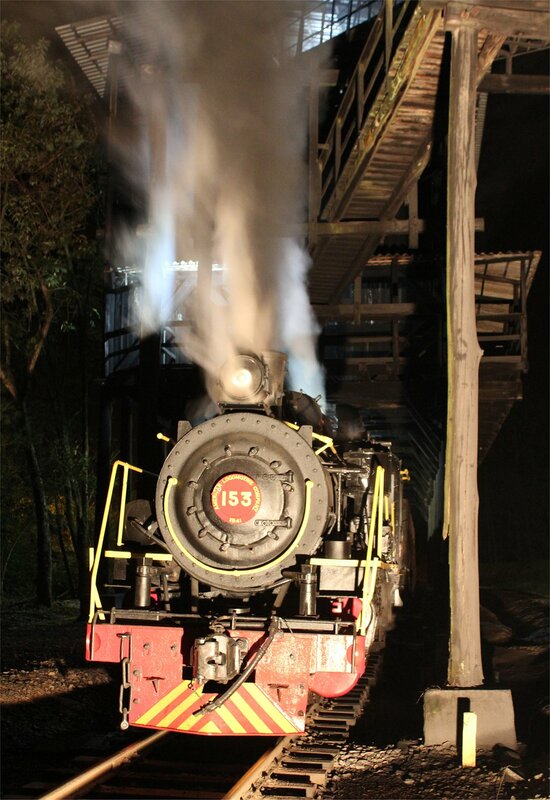 153 was not in steam yet, nor was there any sign of any repair work taking place. 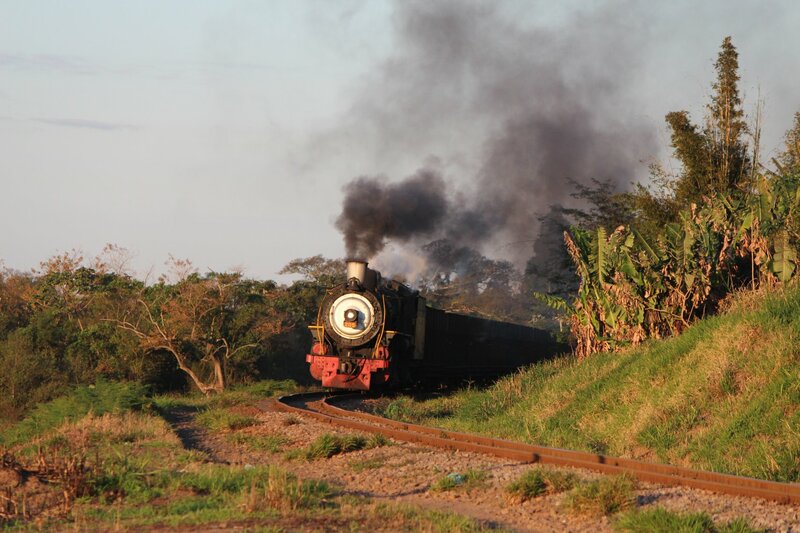 We soon learnt that this was because one of the fire bars had been lost when the loco was dragged back to the museum (it had been resting on the front of the loco) and nothing more could be done until it was found. 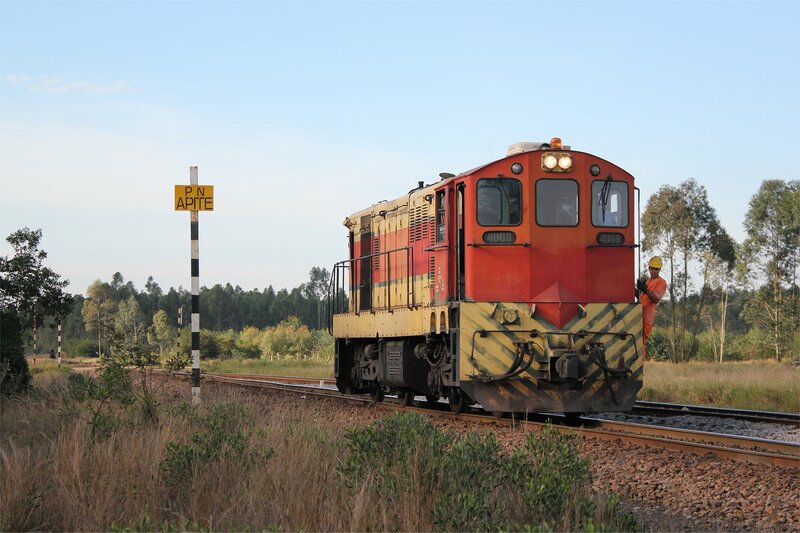 A speeder had been sent out to search for it on the trackside, so we could only hope and pray! 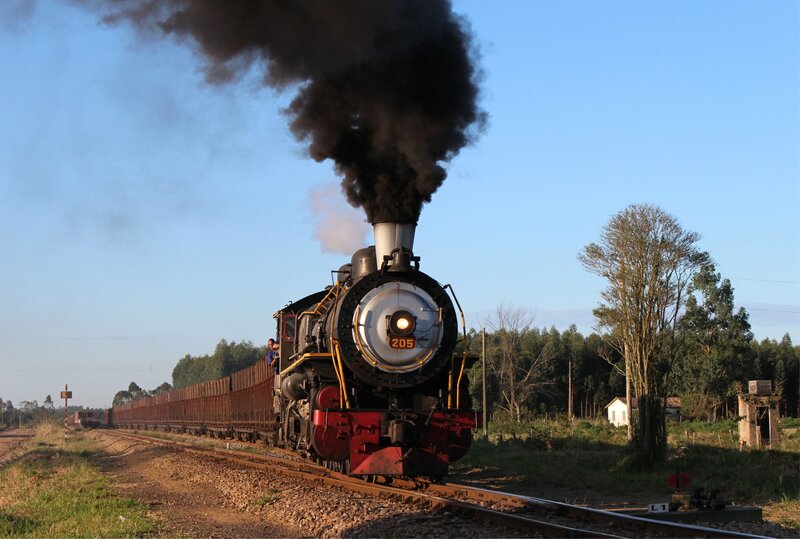 In the afternoon we set off for the loop where Alco no. 153 had dropped her fire. 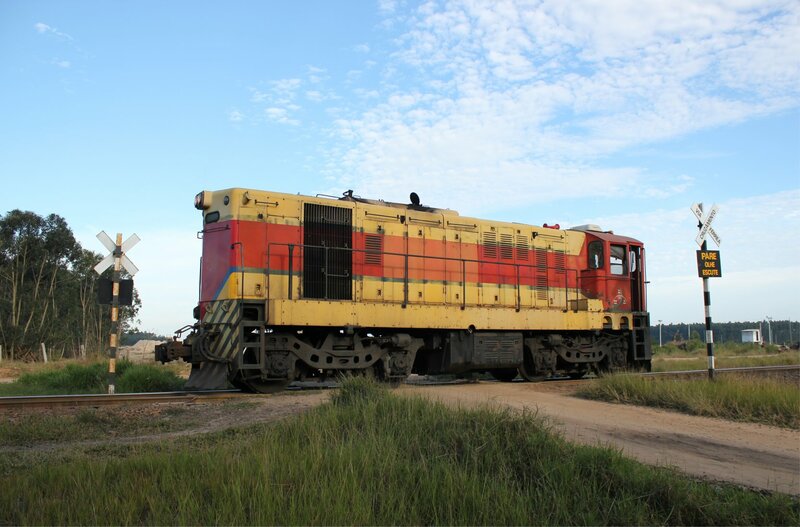 An EMD GL8 diesel-electric locomotive (no. 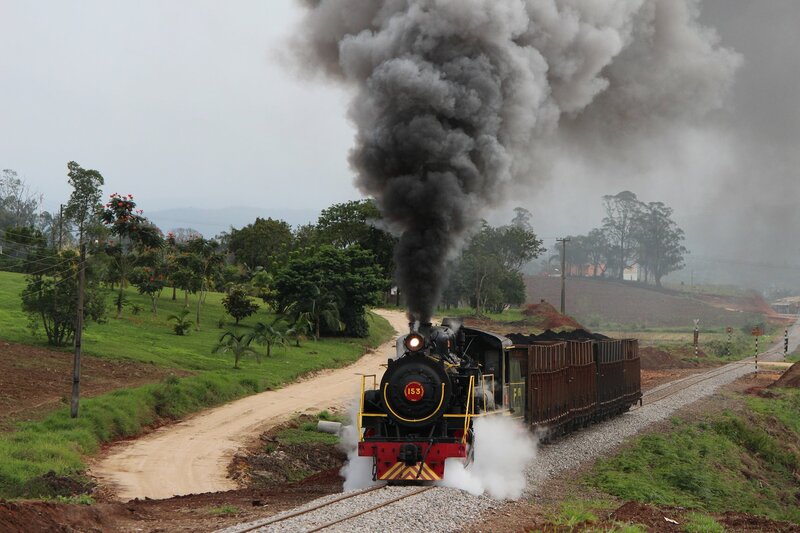 4008) was on the scene already and soon began the work of separating the wagons, box-car and steam locomotive. 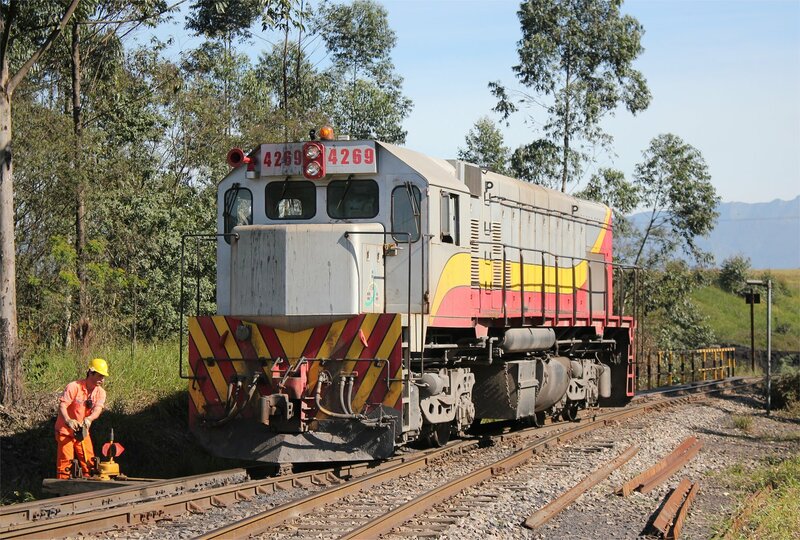 After this process was completed the diesel dragged Alco no. 153 back to the museum. Worryingly though, there was no sign of the Santa Fe which should have arrived at 3.30pm. 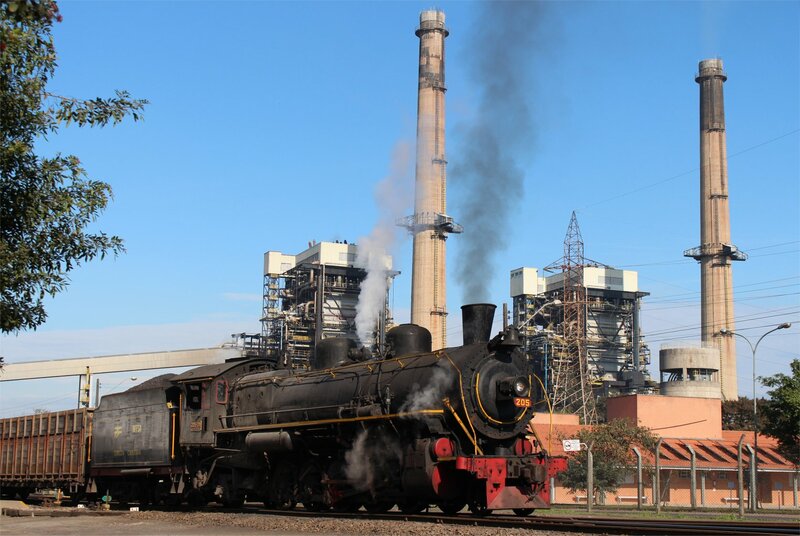 News soon filtered through that the Santa Fe had also failed with everything pointing to a problem with the steam pipe (although this later appeared to be something of a mistranslation, with the actual problem identified as a leaking boiler tube). 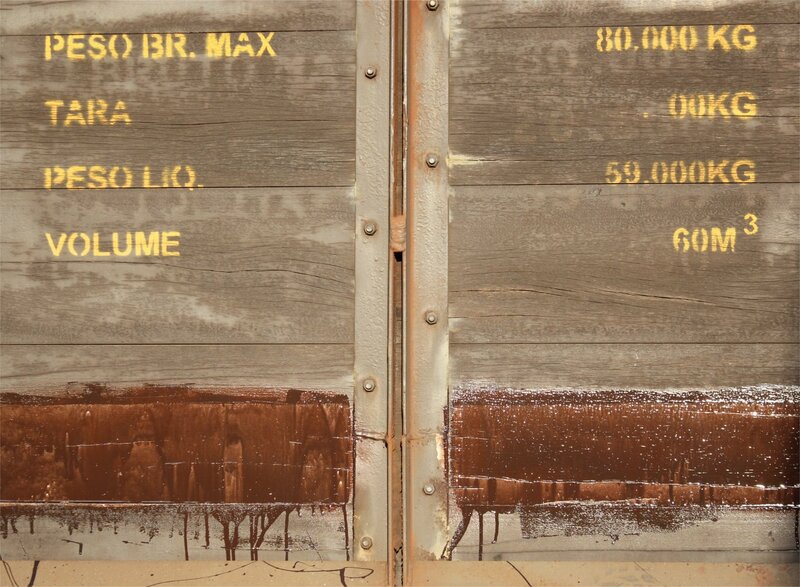 Although this should be fixable the locomotive will have to cool down before this can happen. 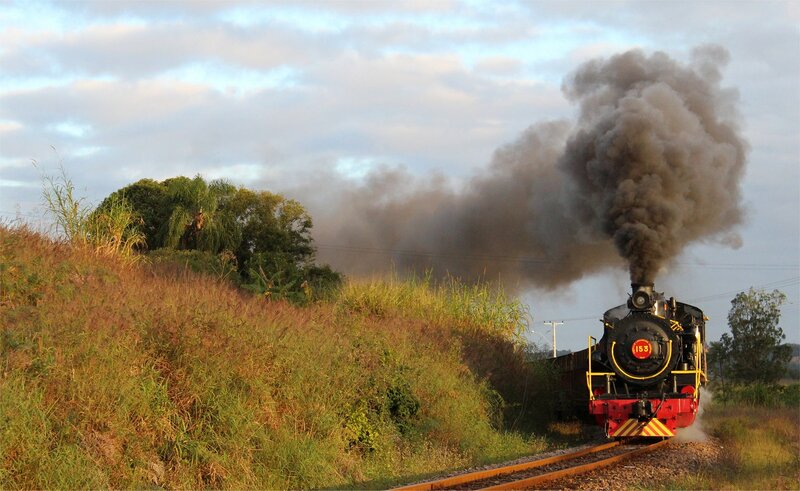 The suggestion that the locomotive would be in steam by tomorrow afternoon seemed a little optimistic to us! I always try my hardest to look for a glimmer of hope, even on a bad day like this, but there is no doubt that the outlook is pretty grim for the next few days (at least). One small positive in the day was that our unexpected long lunch stop gave us a chance to try the traditional Brazilian Feijoada (a stew of black beans with beef, pork trimmings and sausage) and a rather incredible dessert made up of a milk mousse with a coconut layer and white chocolate crust. It’s not much to grasp at, but I’ll take anything right now! 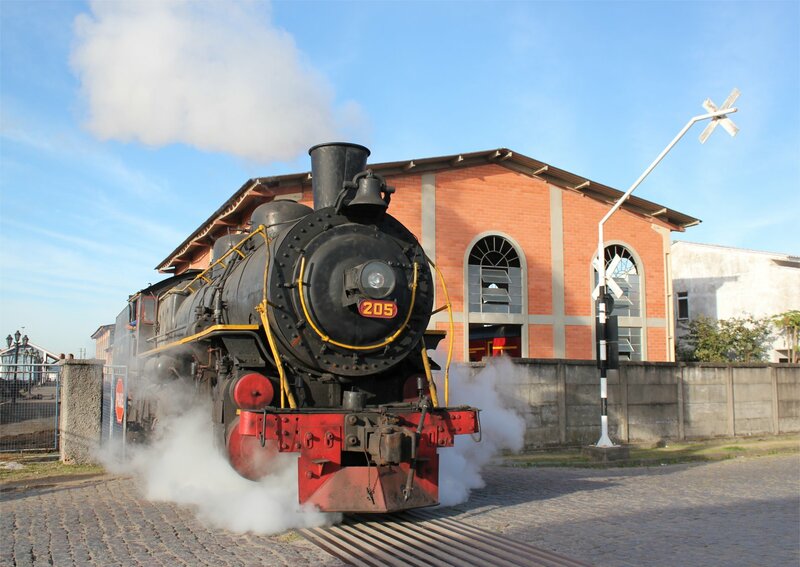 The railway museum at Tubarão, the centre of the system, currently has three serviceable steam locomotives and two of these will be used on our tour. The first to make an appearance was an Alco 2-8-2 (no. 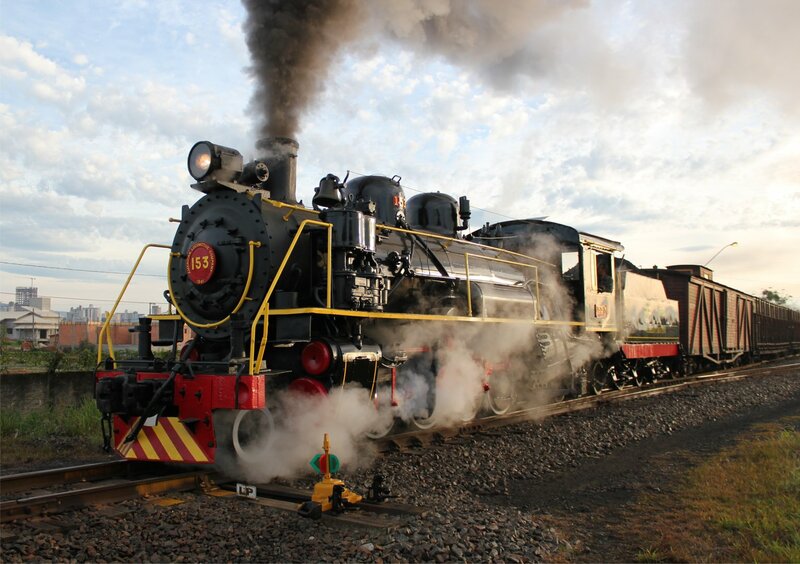 153, built in 1941) which was used for shunting and light use on the line. 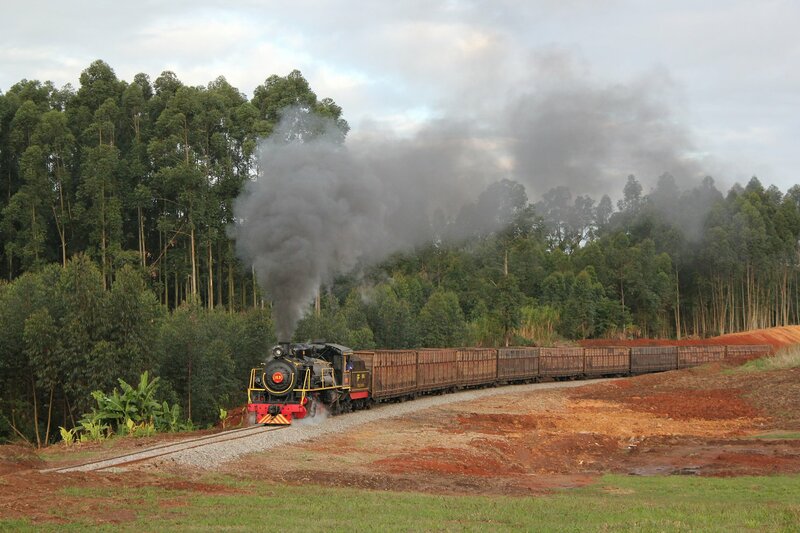 This locomotive was painted green some time after it finished its working life, but has been re-painted in its authentic black livery for our re-creation. 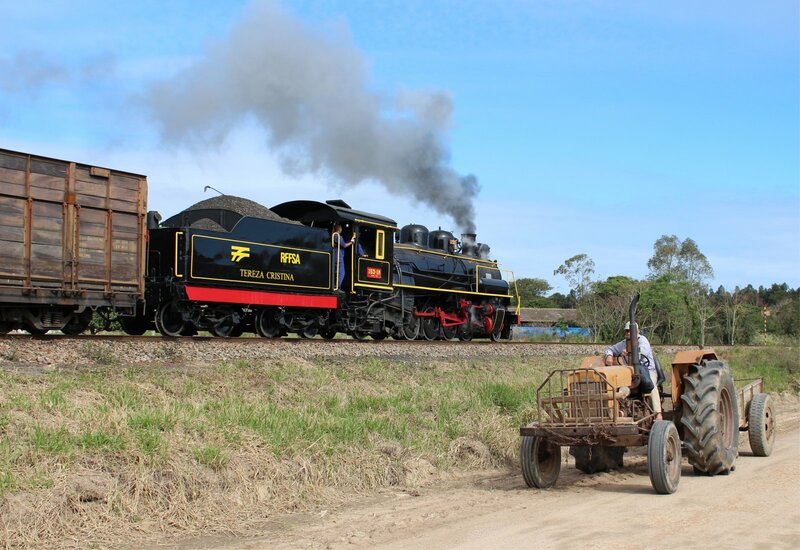 Since joining the museum fleet the loco has been used on tourist trains, so this occasion presents an unusual opportunity to see it hauling coal wagons. Our morning with Alco no. 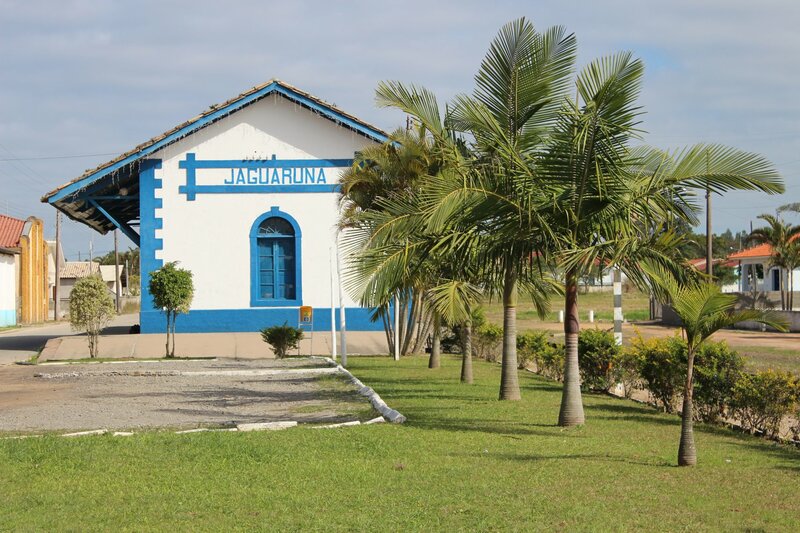 153 began at Tubarão and took us close to the outskirts of Jaguaruna, with a number of photo stops along the way. 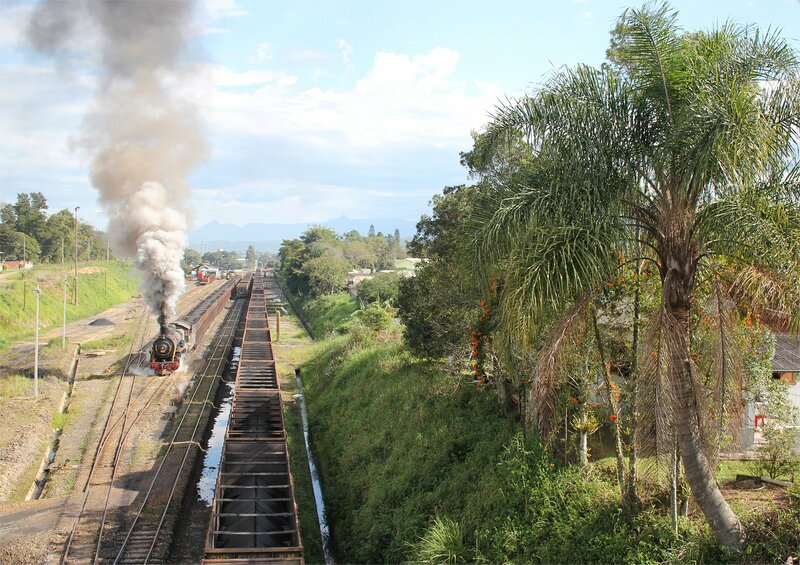 As most of the steam I have seen in my life has been in Europe or China, it was quite striking to see a steam locomotive working past a couple of palm trees. It was well worth spending the time to get this photograph right! 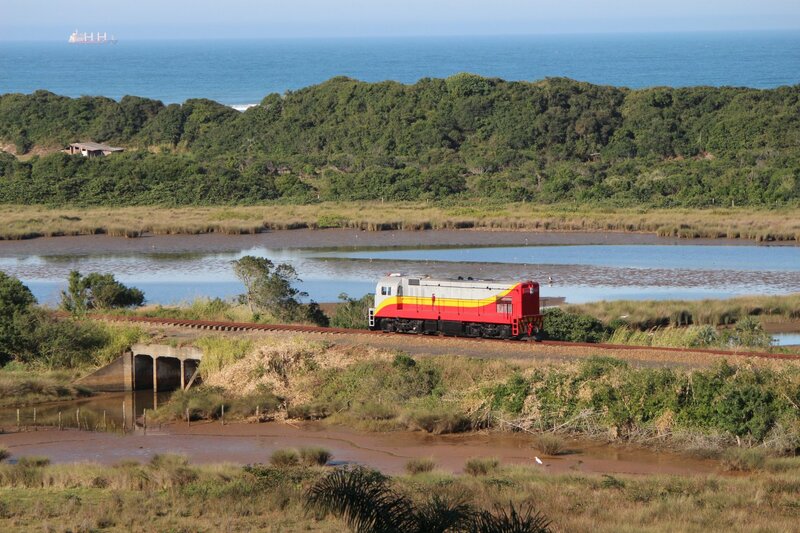 On this charter we are not riding the train but instead chasing it using four Volkswagen Kombis well suited to the rough back roads in the area – a necessity to reach the most scenic spots. It was also great to be able to call on the local knowledge of the museum president, Dr. José Warmuth, who spent many a moment in the 1980s photographing the real thing from the same spots. 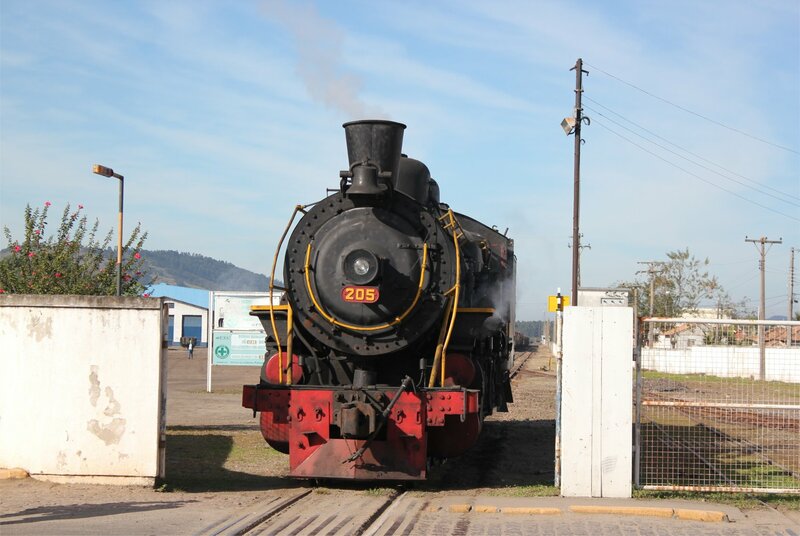 Later in the week we will get to see one of the beautiful ex-Argentinian Santa-Fe 2-10-2’s (no. 205, built by Skoda in 1949) that first appeared on the system in the early 1980s. 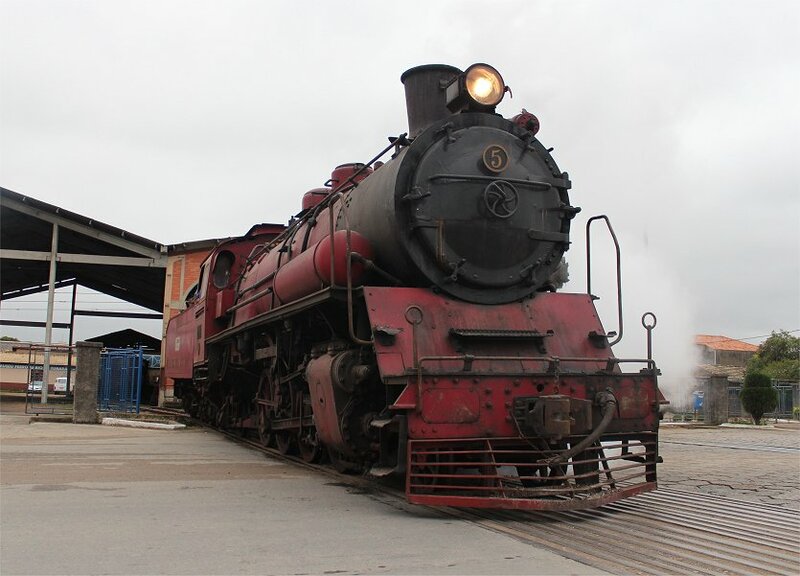 The third serviceable locomotive in the museum is a Jung 2-8-2 (no. 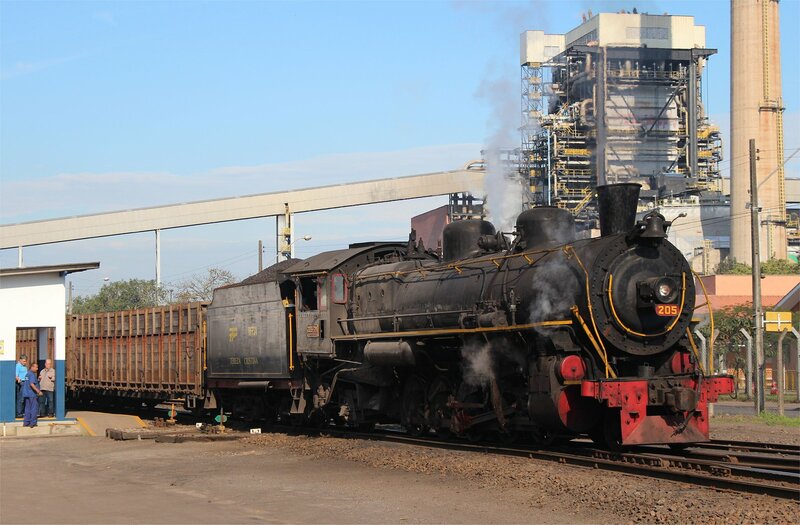 5, built in 1954) which spent its life shunting at Capivari power station, rather than on the line, but we will not see this in steam during our tour. 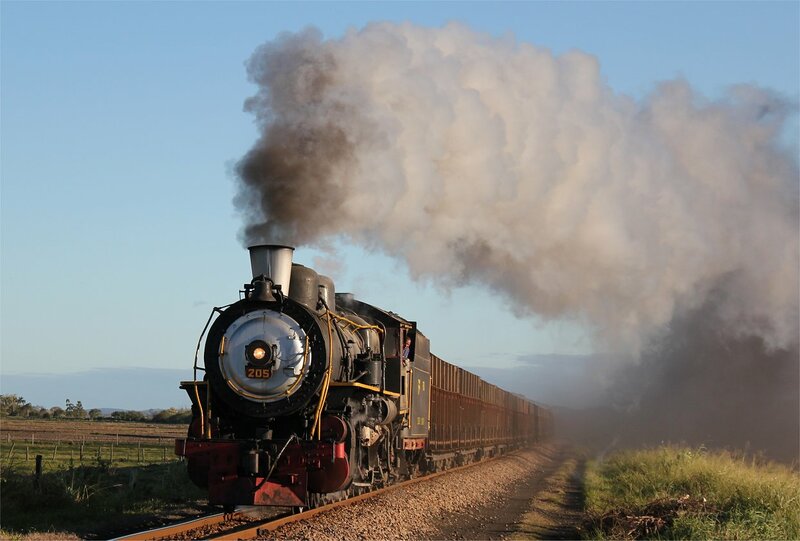 The number and variety of locations in the world with real steam is rapidly diminishing, but in some places it is just possible to turn back time for a moment or two and restore the sight of working steam. 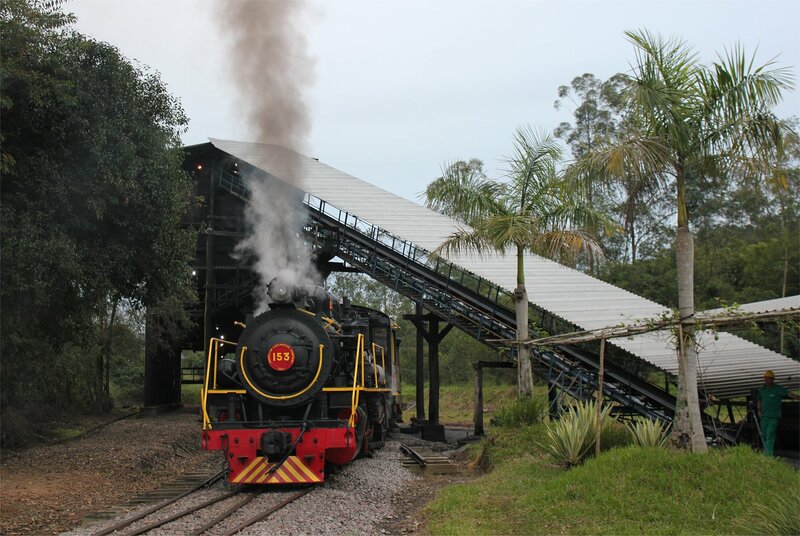 The Dona Teresa Cristina railway in the state of Santa Catarina, Brazil, is one such place. 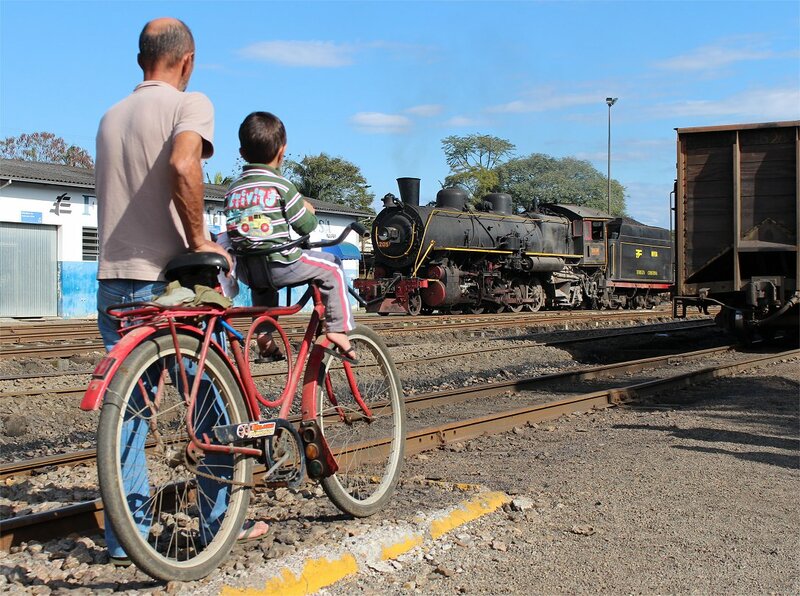 Bernd Seiler of FarRail Tours has worked with the railway museum at Tubarão and the privatized modern railway (Ferrovia Tereza Cristina) to re-create the spectacle of heavy coal freight trains on the system. 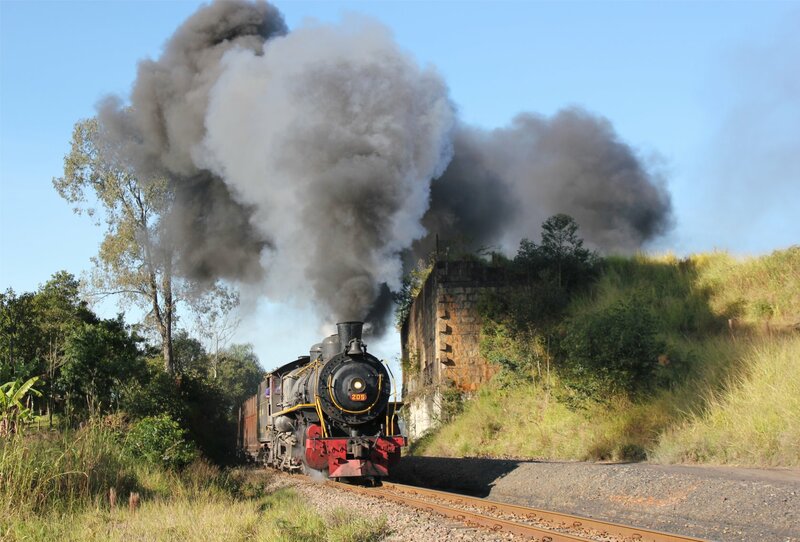 It has taken a remarkable amount of preparation to ensure that these trains can run and to create a workable plan to dovetail these steam freights with the regular traffic on the line. The incredible attention to detail that has gone into arranging this tour was a significant factor in convincing me to book a place and take up the opportunity to photograph a moment out of history. 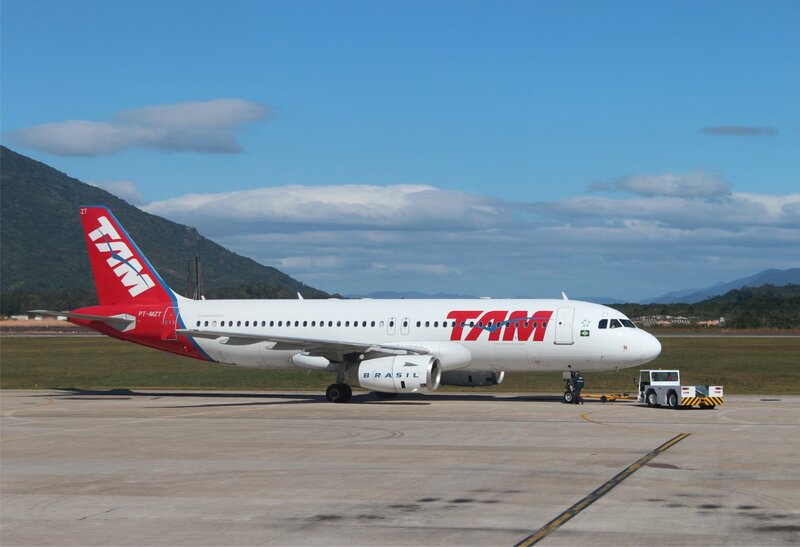 Our international group of photographers and videographers assembled at Florianópolis airport this morning after completing long haul flights from all corners of the globe. Unusually, for a trip such as this, our first day has been relatively relaxed. 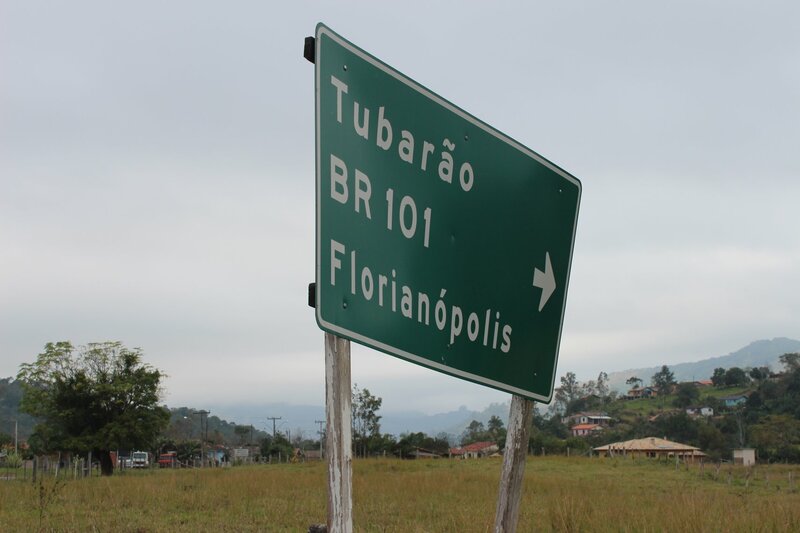 After completing the 160km bus ride south to Tubarão we have been able to chill out at the hotel and explore the surrounding area. 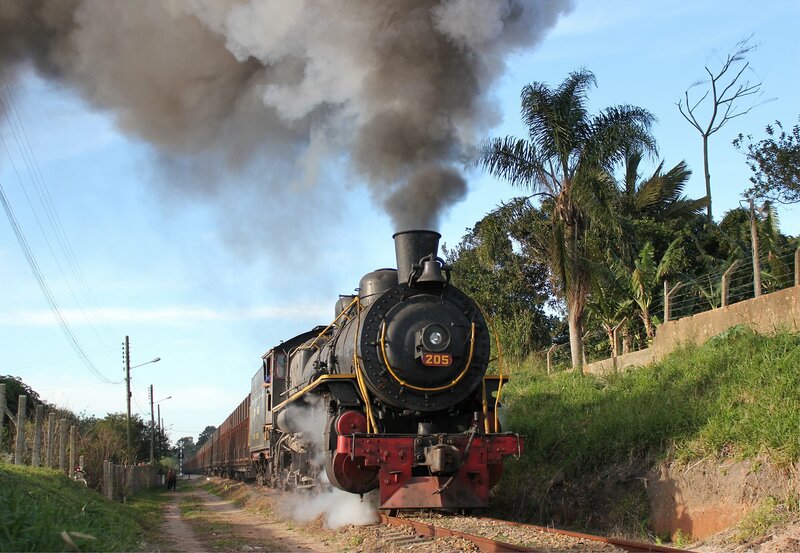 Tomorrow will be a different matter, with the first steam freight from Tubarão to Urussanga.